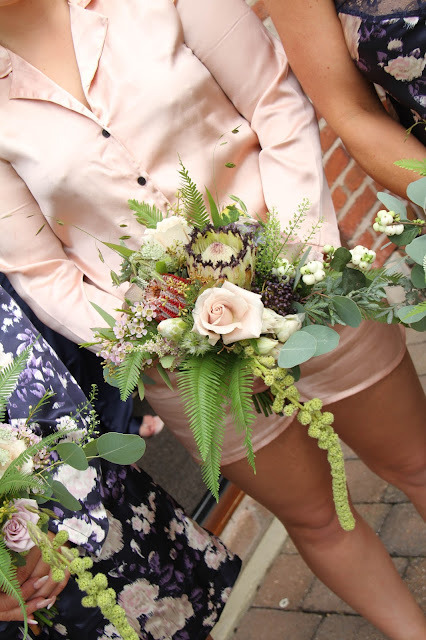 Regular FD blog readers please brace yourselves this is going to be one of those mammoth posts with a mega multitude of flower pics, there's just so many and I am, stupidly terrible at editing, I feel so tragic deleting images so I just don't!! 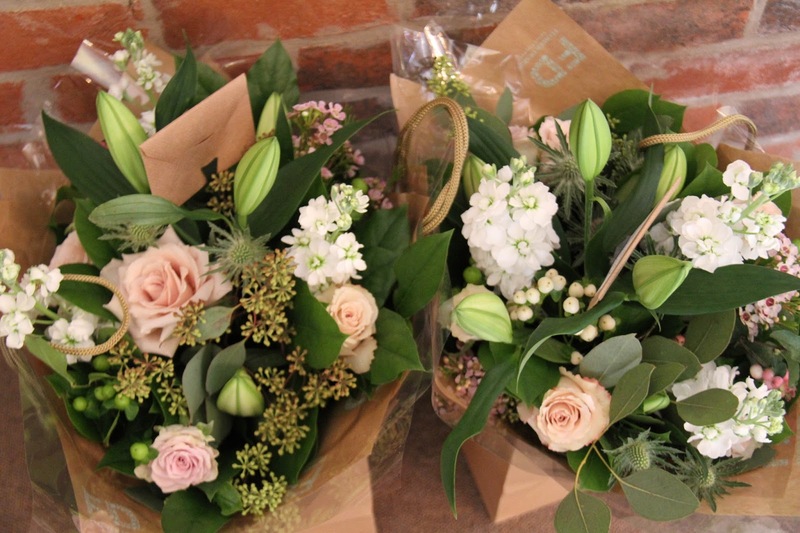 apologies therefore for the scandalously ridiculous quantity! So our flower journey with Leanne & Chris started way back in April 2016 when we first met up to talk through their plans, other than Sandhole Oak Barn nothing else was booked, so we arranged to meet up again about 6 months before their big day to see their magnificent mood board and hear how things had progressed. 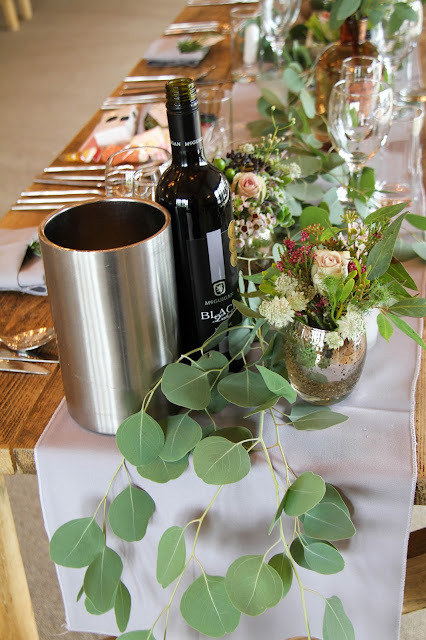 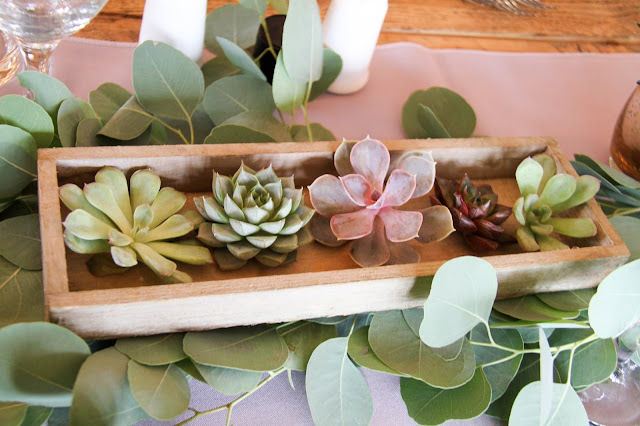 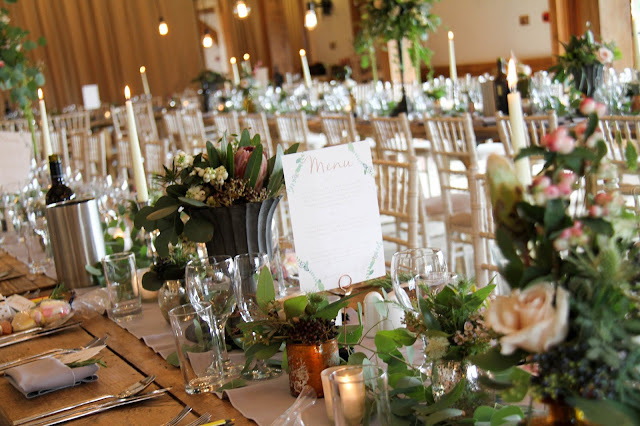 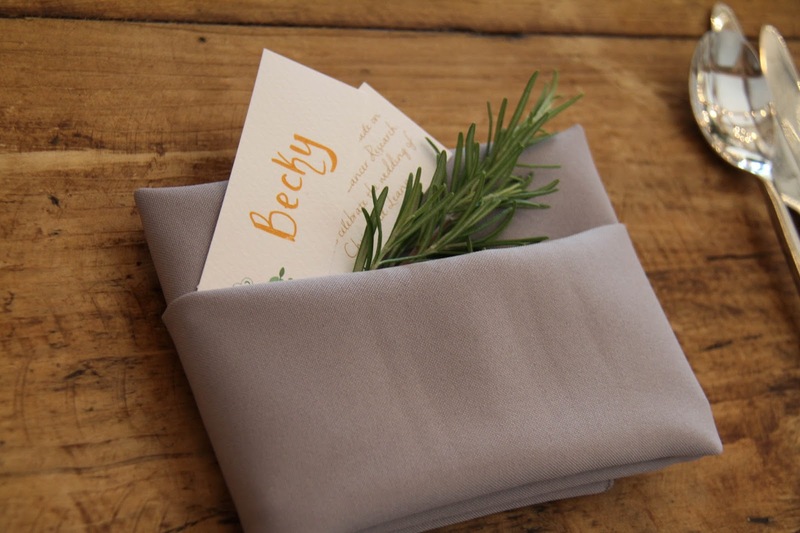 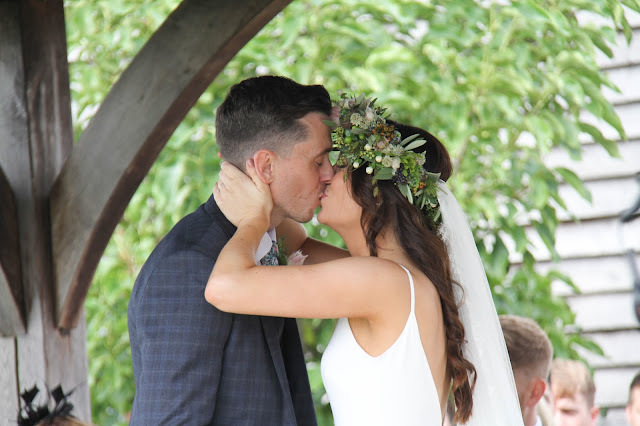 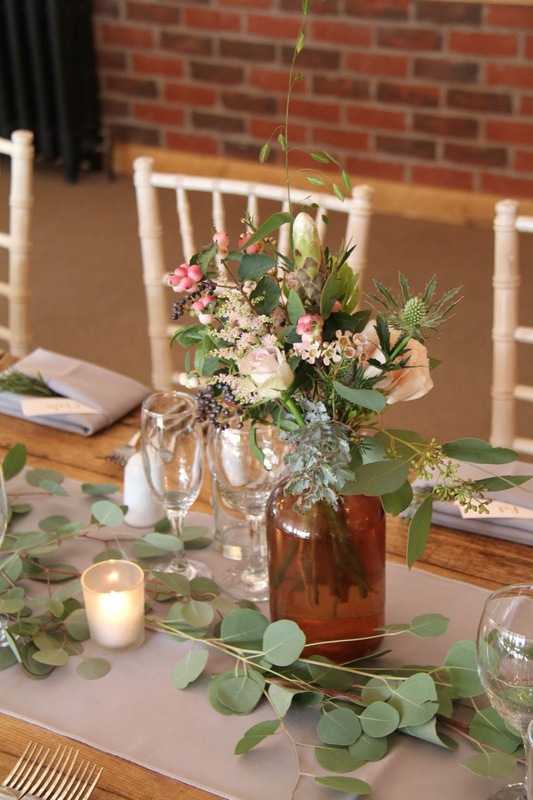 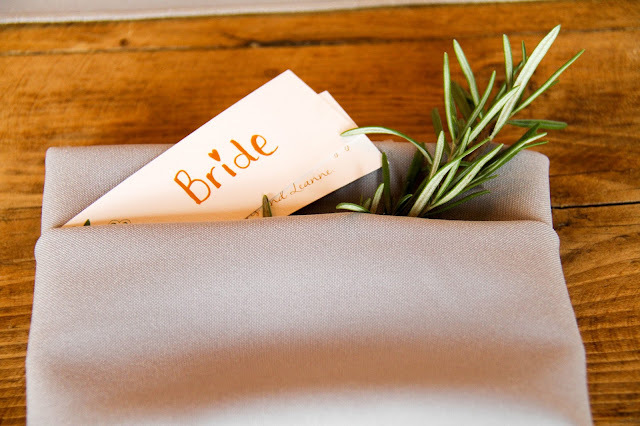 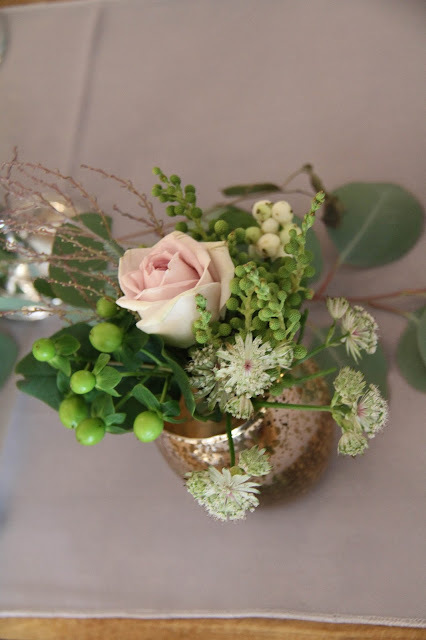 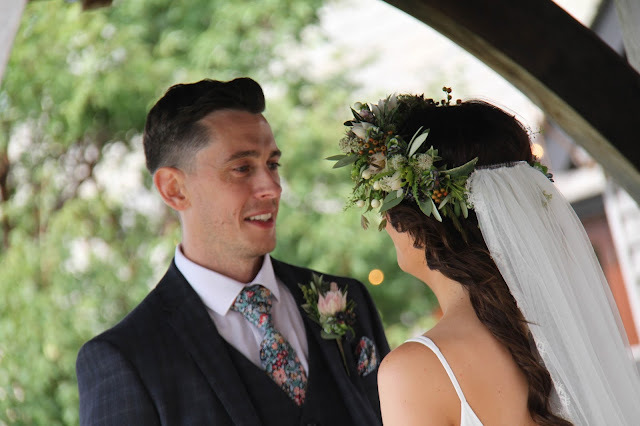 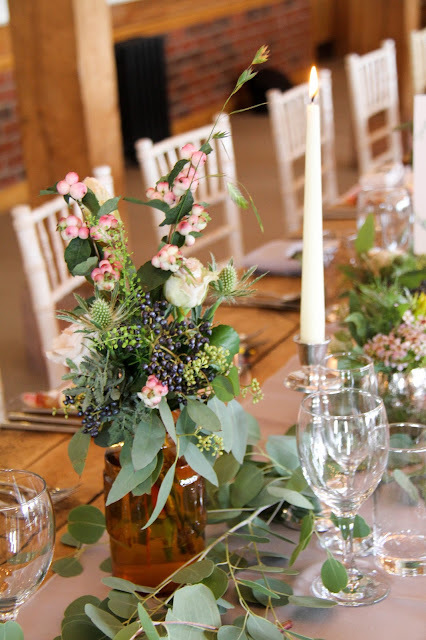 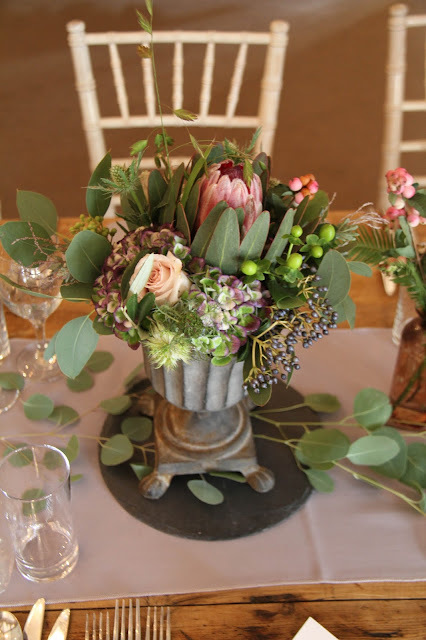 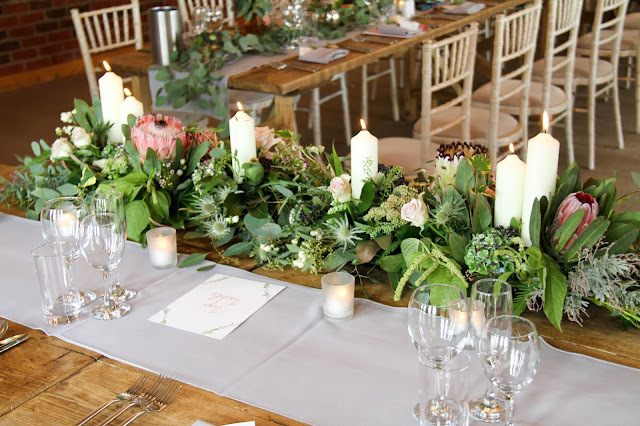 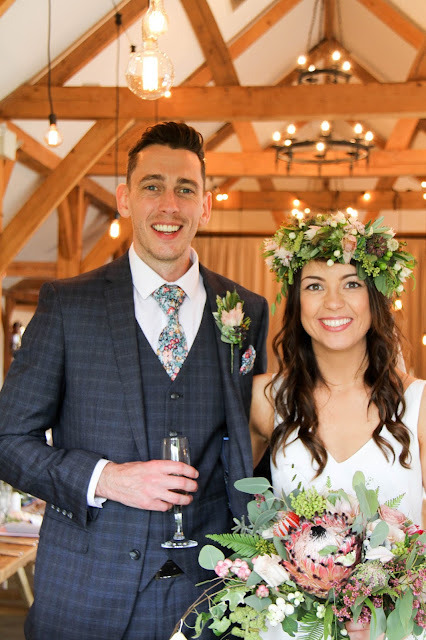 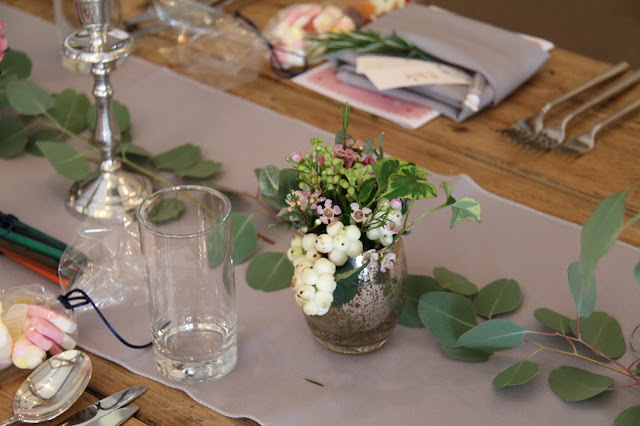 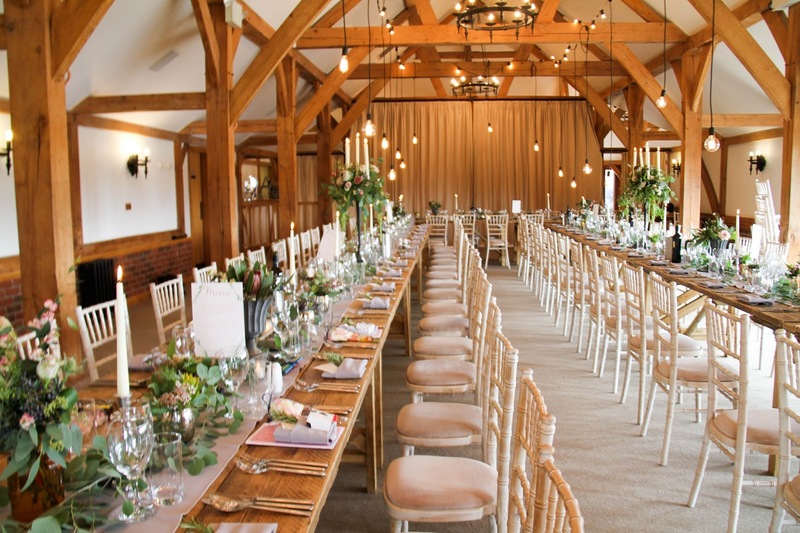 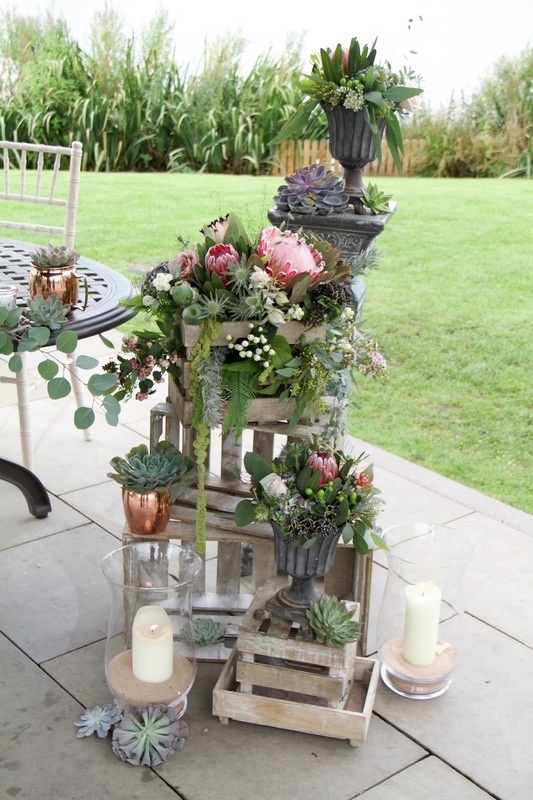 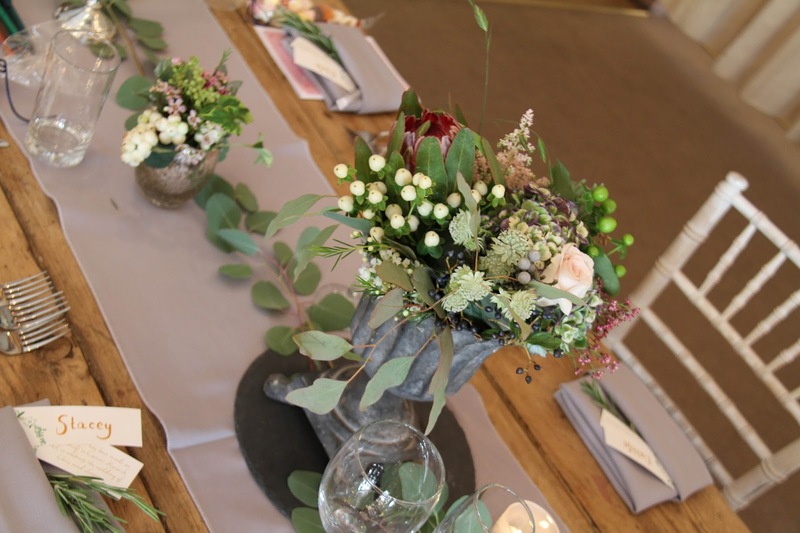 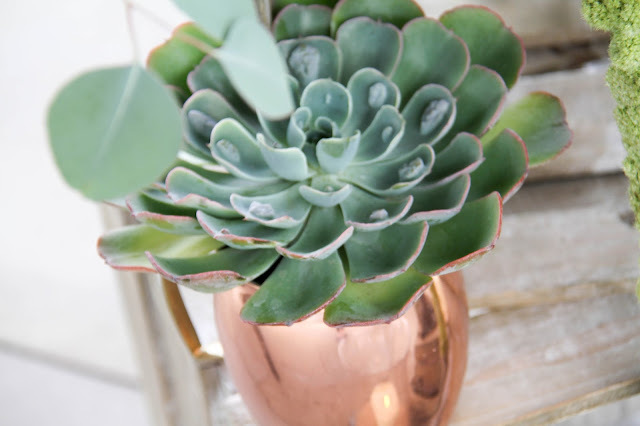 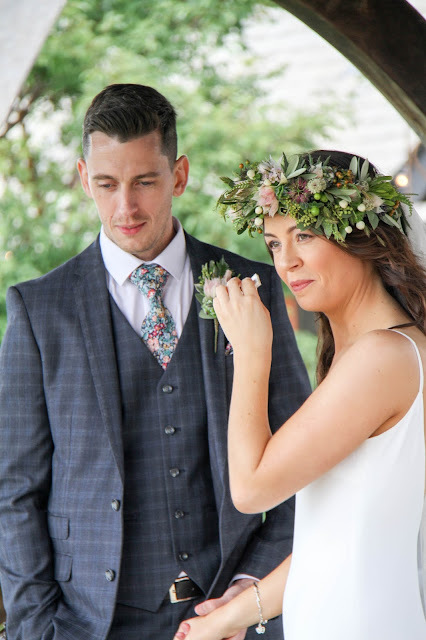 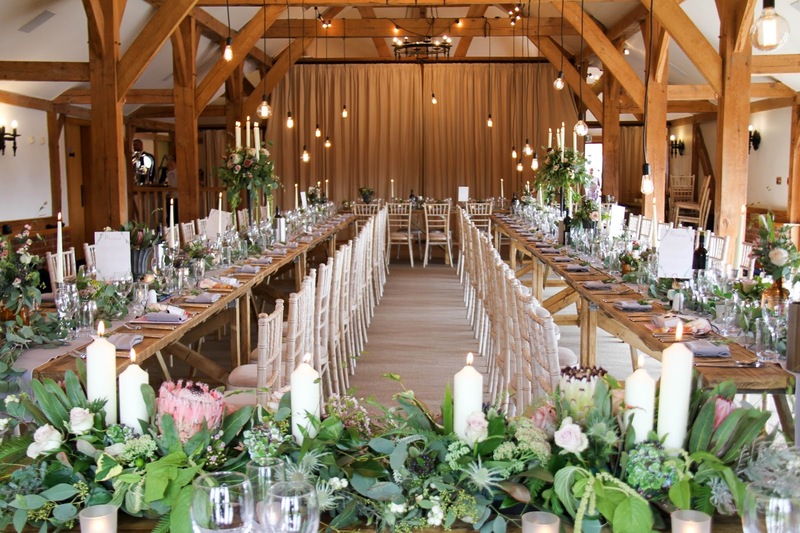 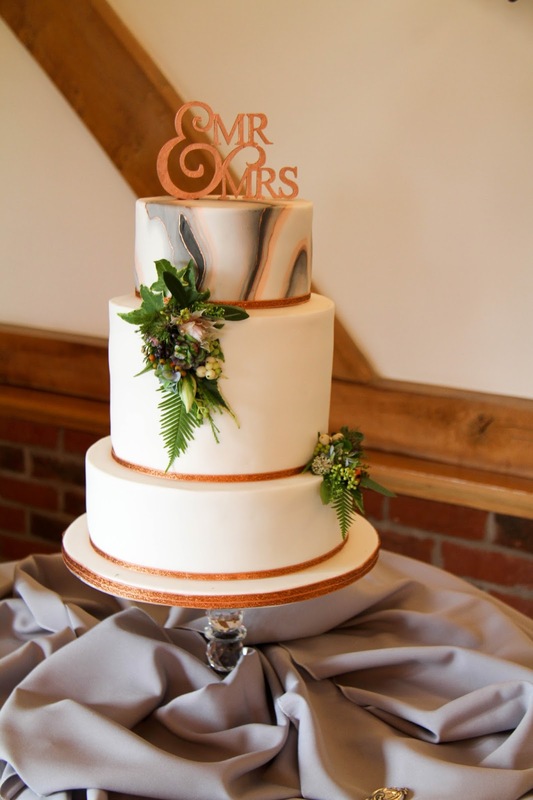 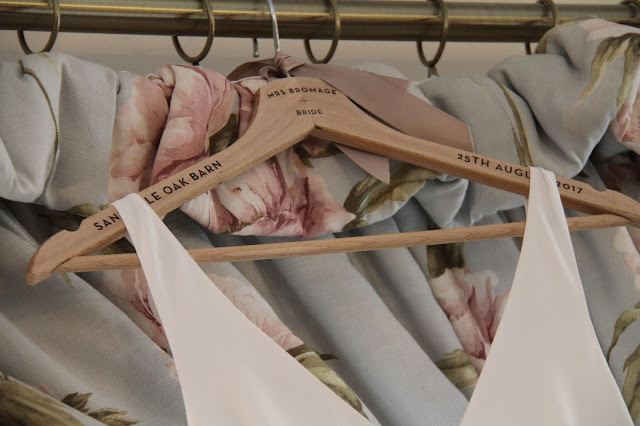 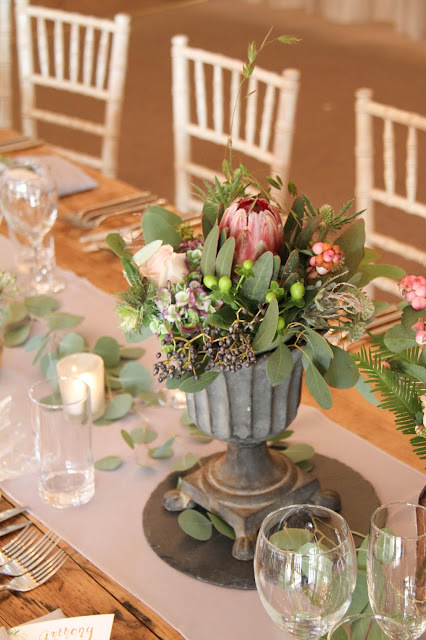 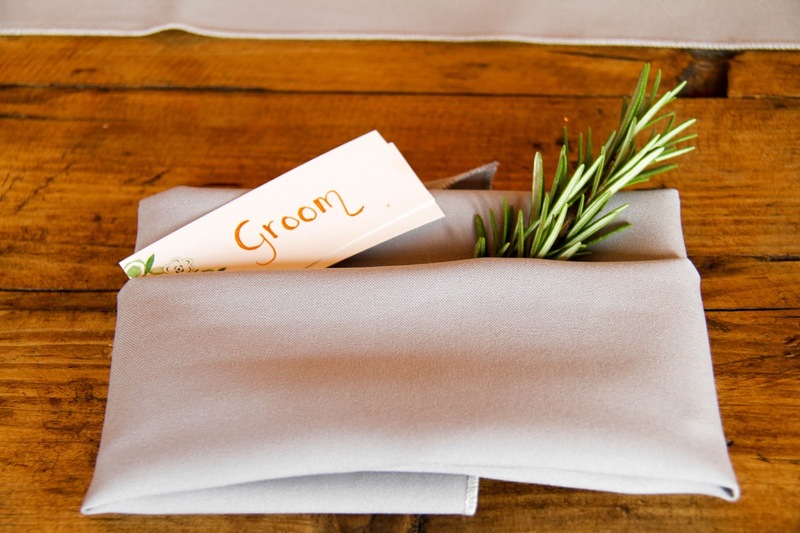 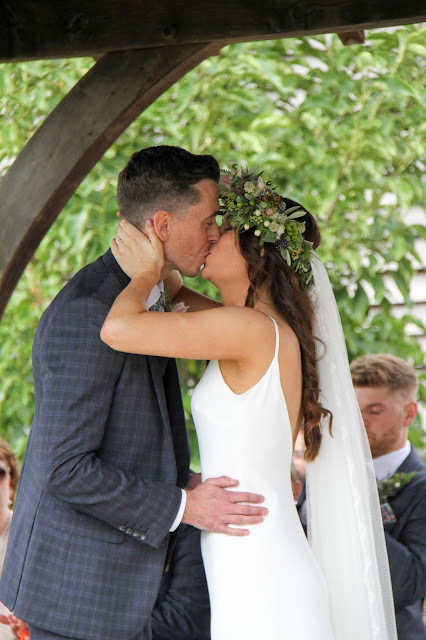 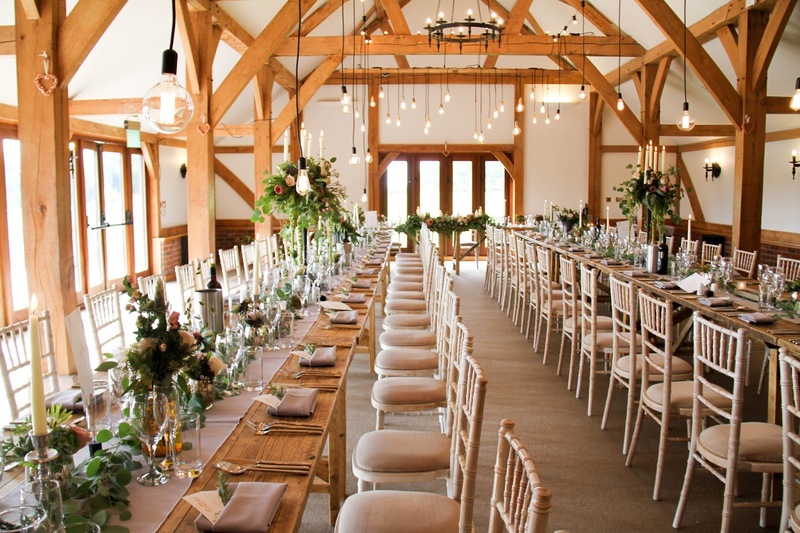 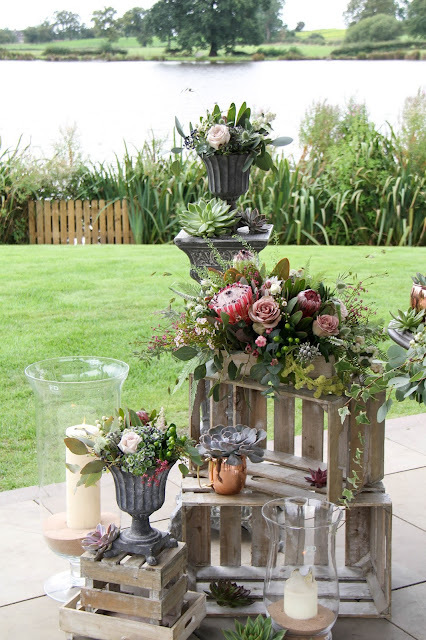 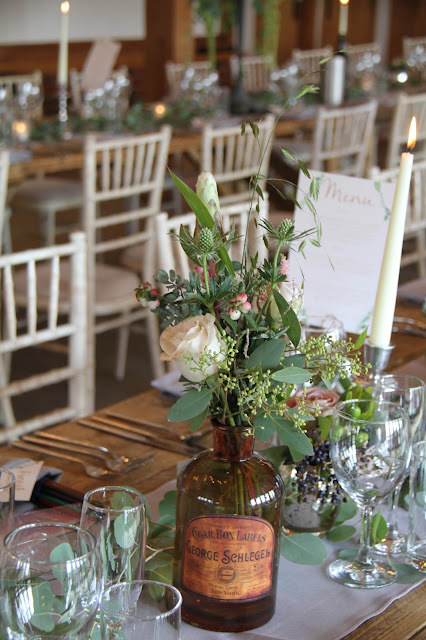 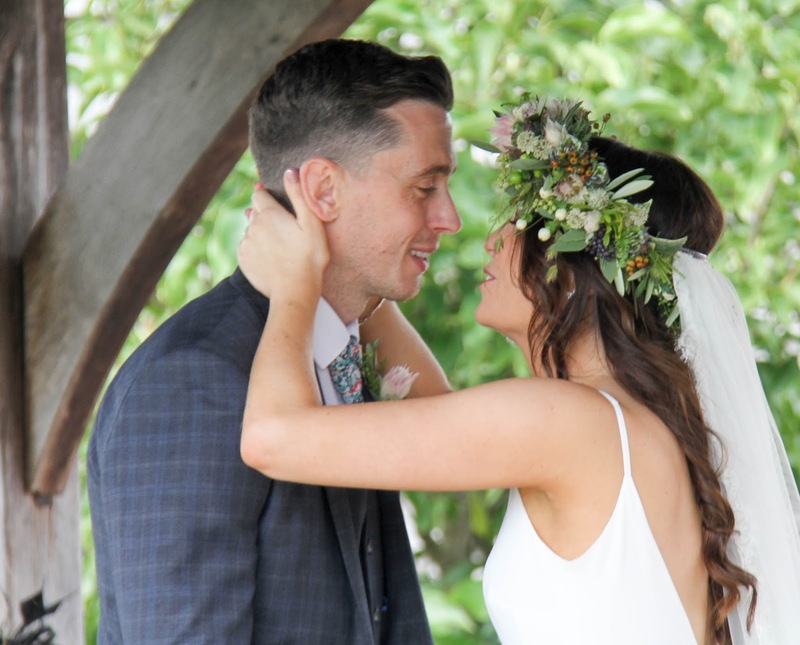 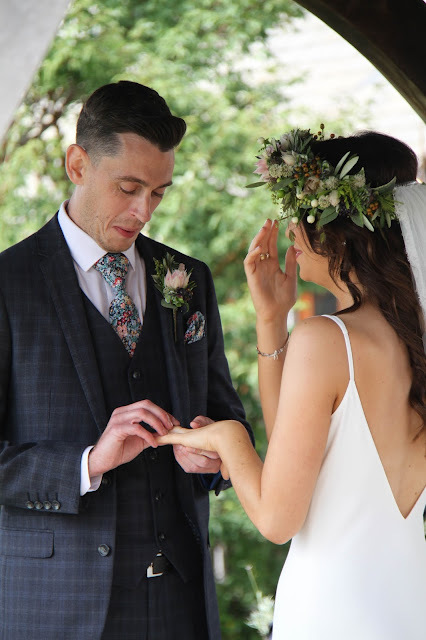 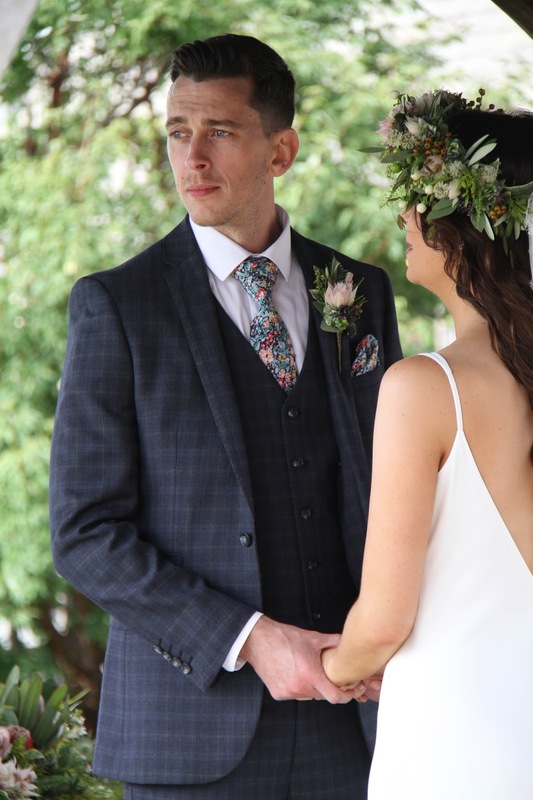 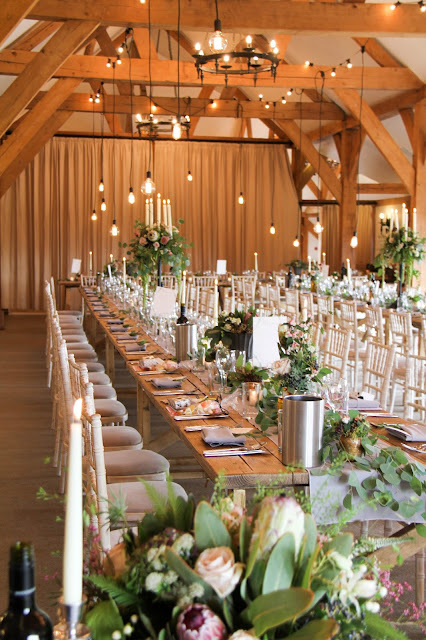 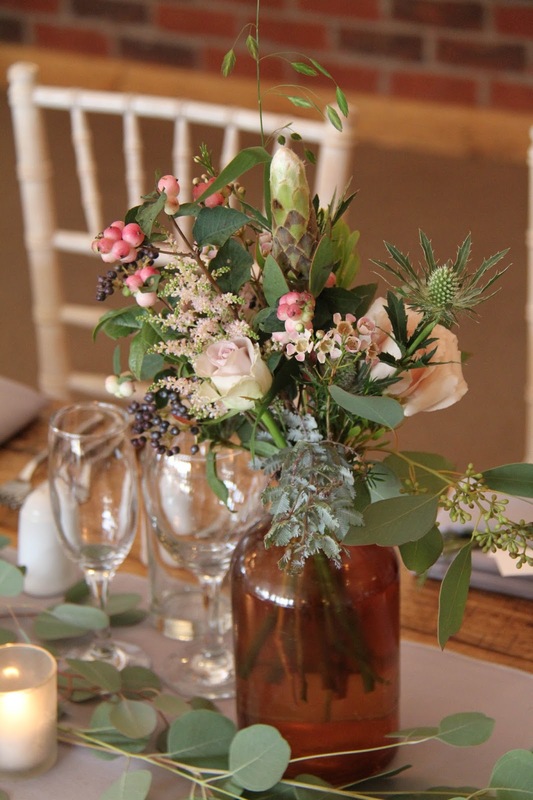 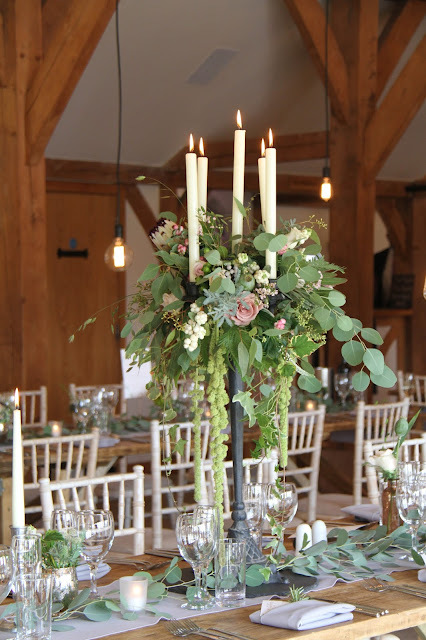 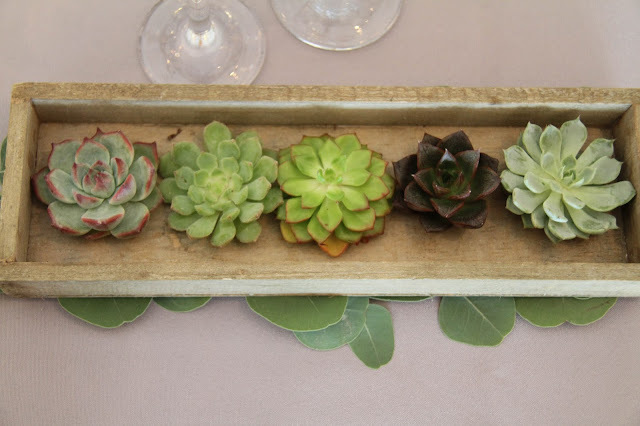 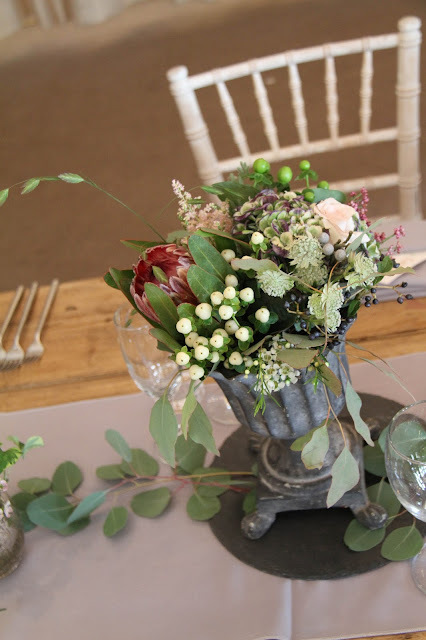 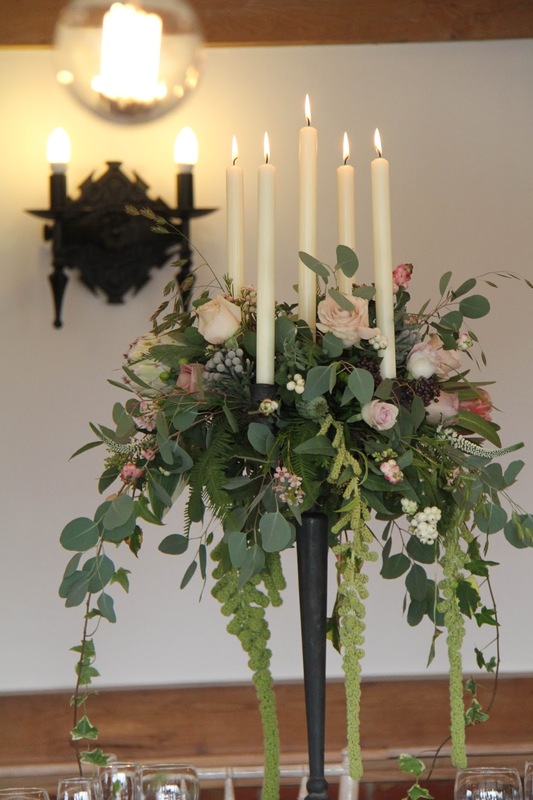 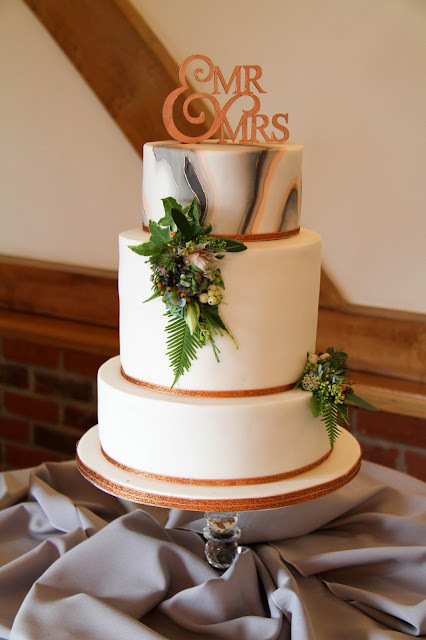 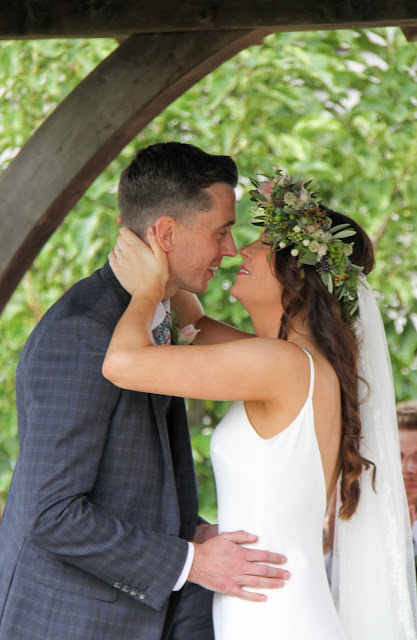 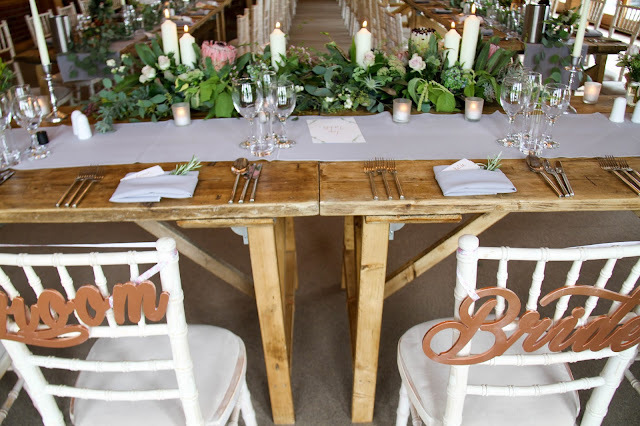 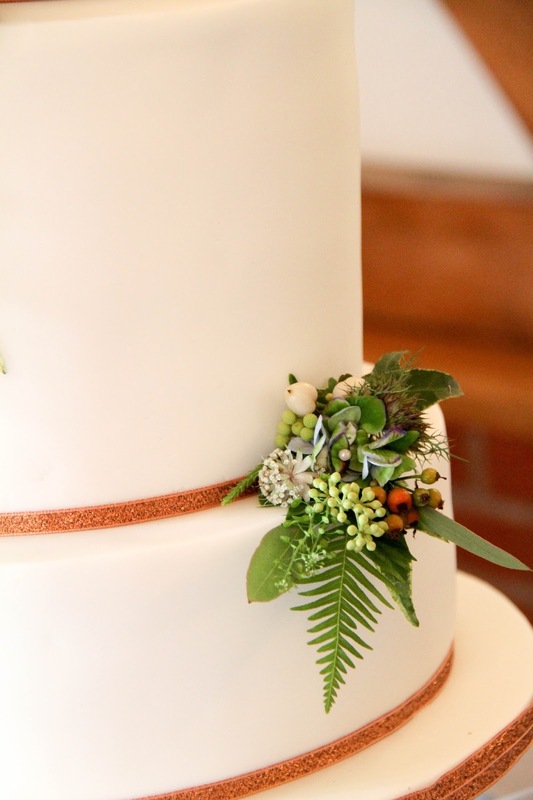 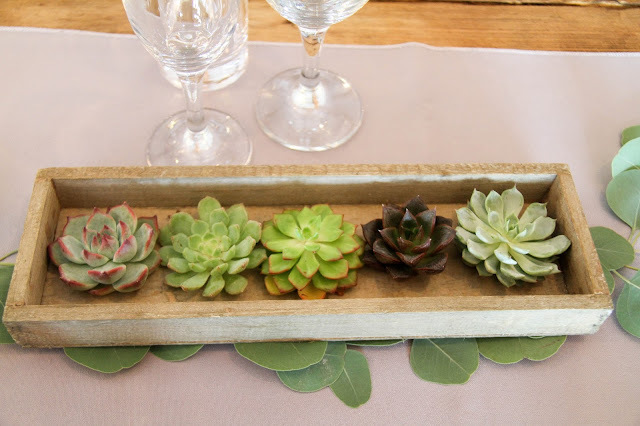 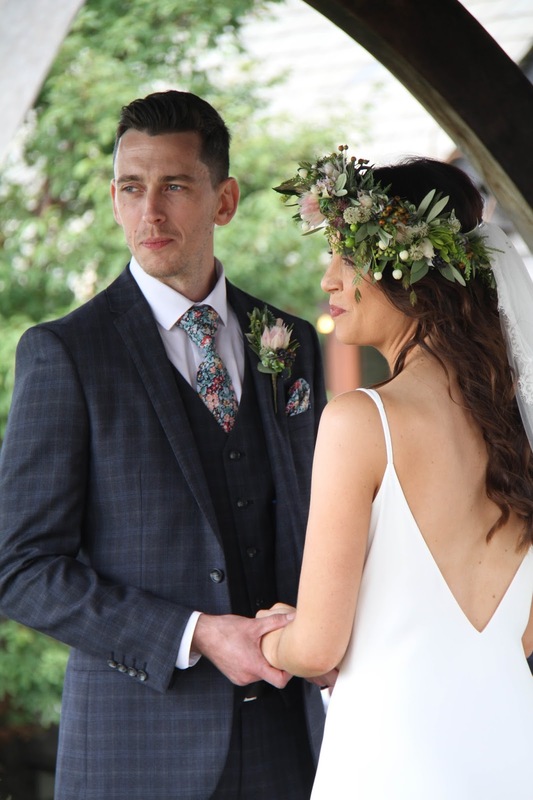 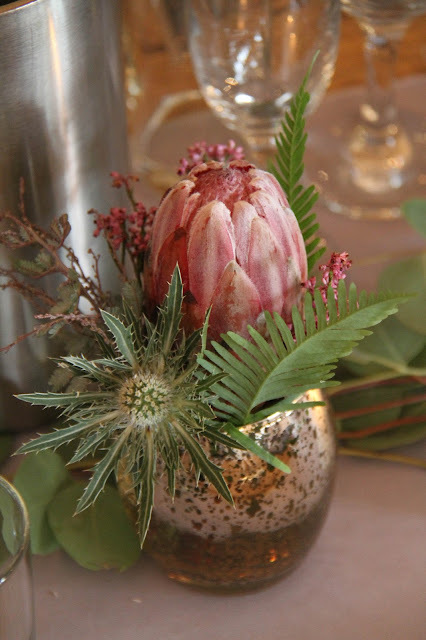 We learned about their unique ideas for a truly beautiful wedding day, copper and slate were definitely featuring, as to was Eucalyptus, relaxed and wild shapes and a Floral Crown were now on the agenda. 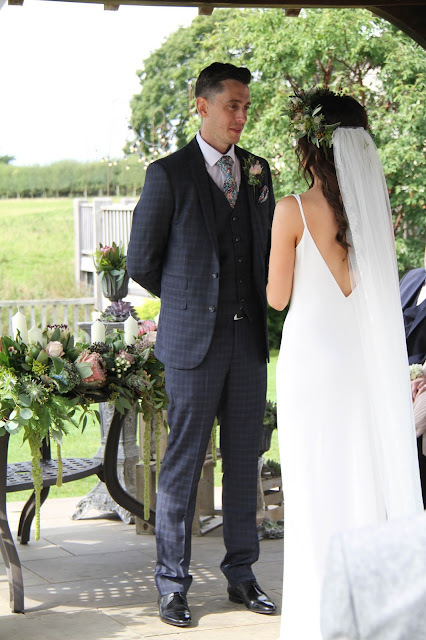 By this time too they'd booked some of our favourite wedding professionals not least the amazing Dan Wootton such a brilliant photographer, Daz & Megan from Typical Type were on board with their really special Edison lights, there was a sensationally simple and elegant Charlie Brear gown from our friends at Mears Ghyll, Salon Glo were looking after everyone's hair and the lovely Katie Bee was going to be making beautiful faces even lovelier, it was great to be working with the fab folks from Top Table again they were providing all of the catering, Mark Ford from Studio 54D would be recording all of the magic, and the brilliant Robin Kershaw from DFC Lancashire was hosting the whole day and providing all of the entertainment, there was a lovely cake by Helen from Say it with Cupcakes and our Bride & Groom were creating their own stationery, lets face it with all of those wonderful suppliers it was always going to be a cracker!!! 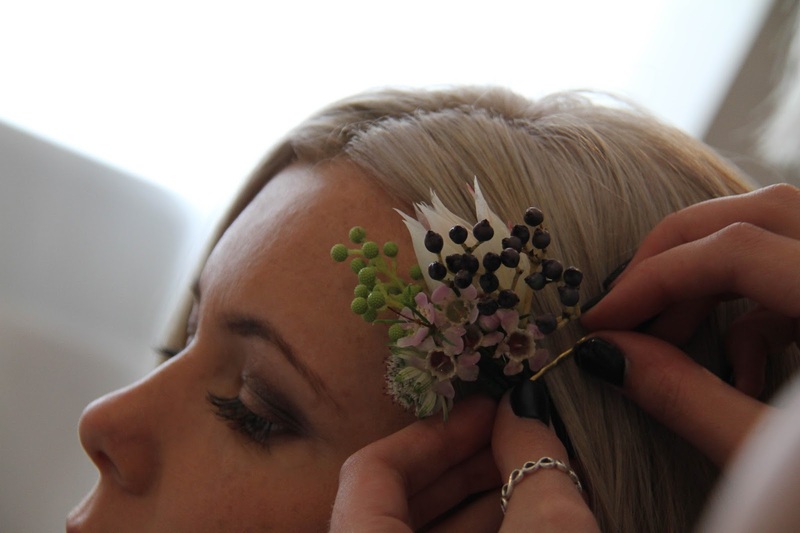 In Leanne' s Bridal Crown, we included a huge variety of textures, Berries, Proteas, Grasses, fresh Herbs, Rolled Rose Petals, Thistles and florets in a range of shapes sizes and colours, we made it so it was thinner at the back and more full and voluptuous at the front, we wanted some of the grasses to dance as Leanne moved so we allowed them to be longer. 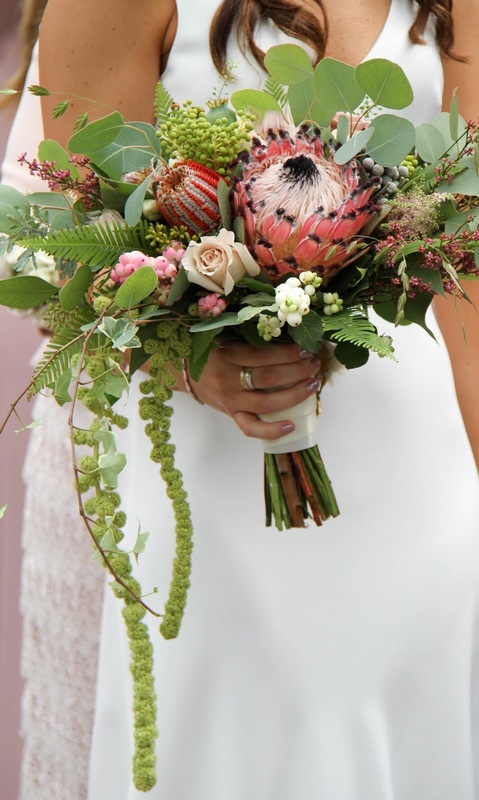 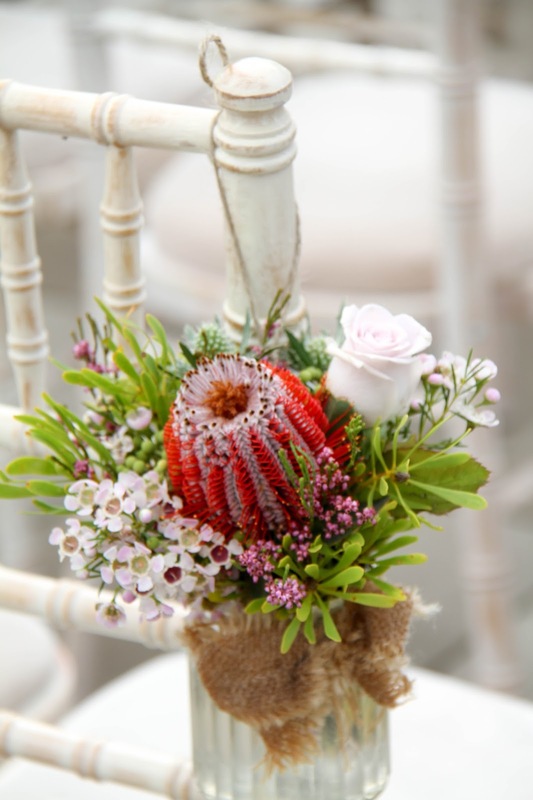 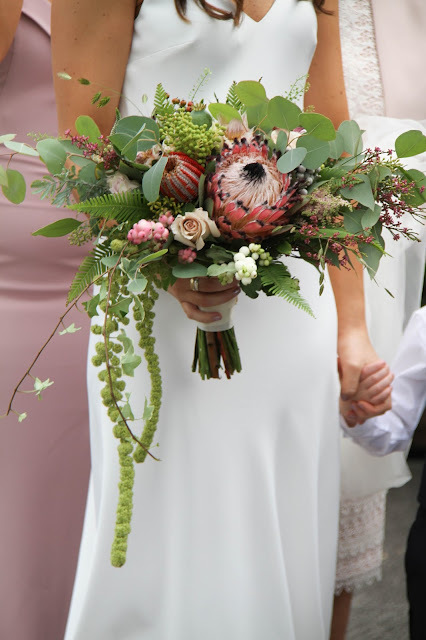 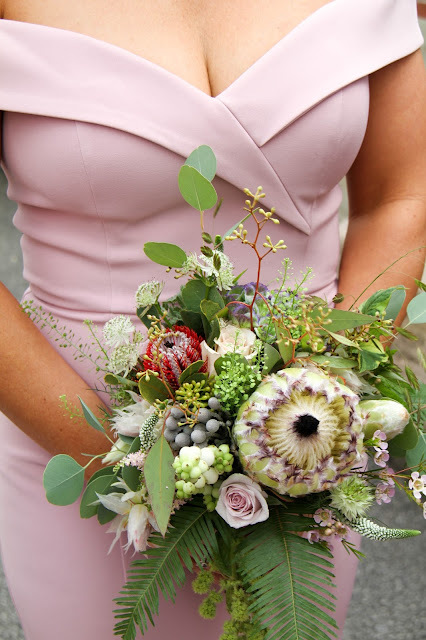 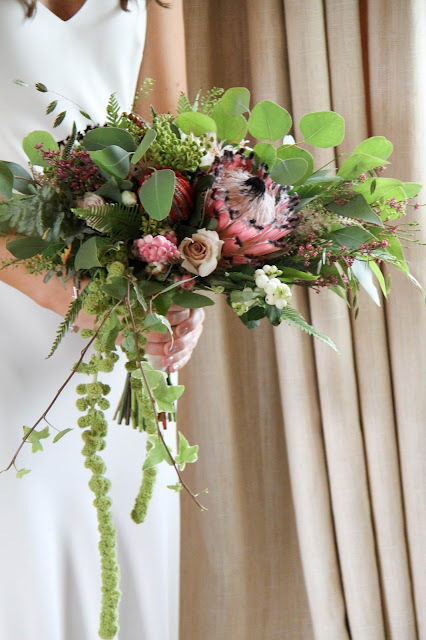 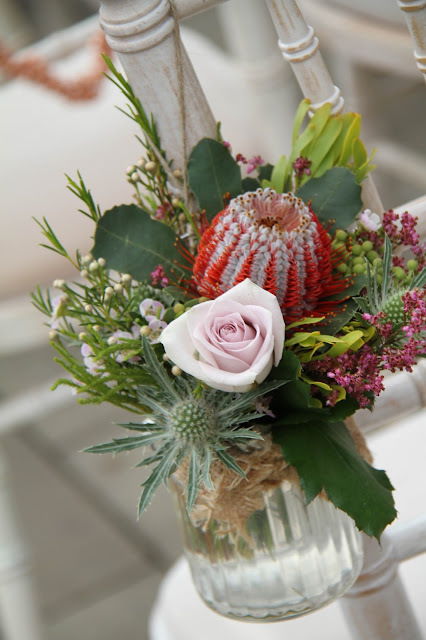 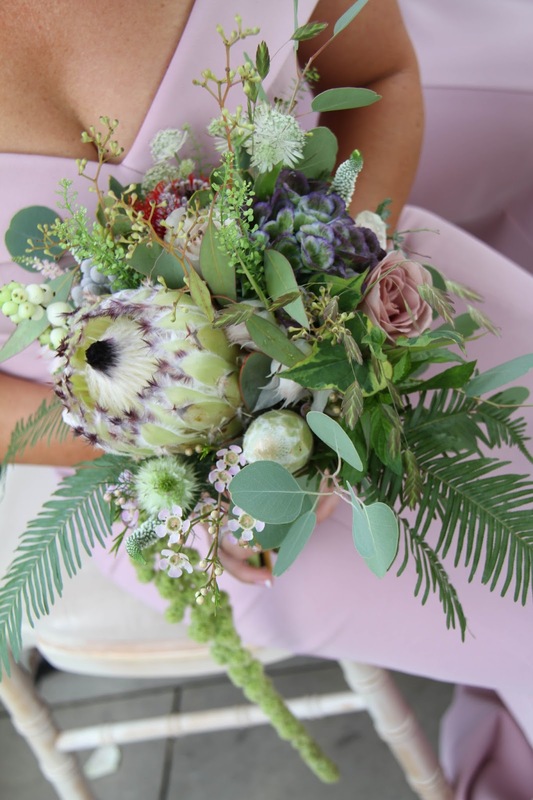 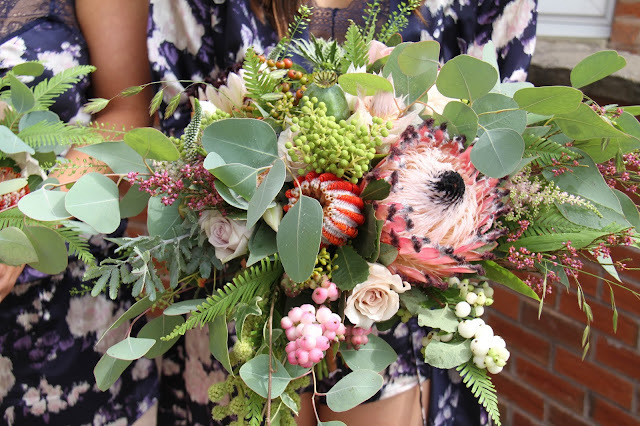 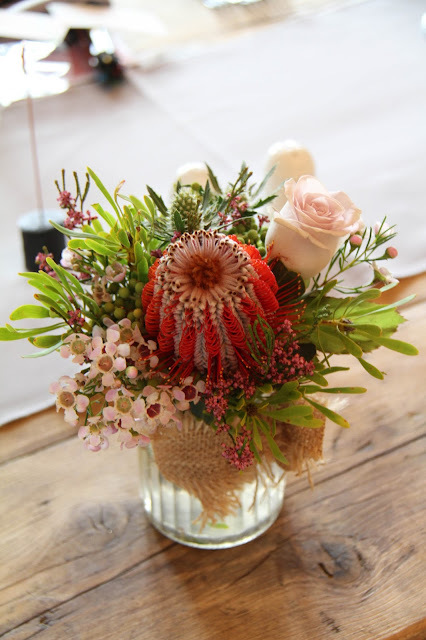 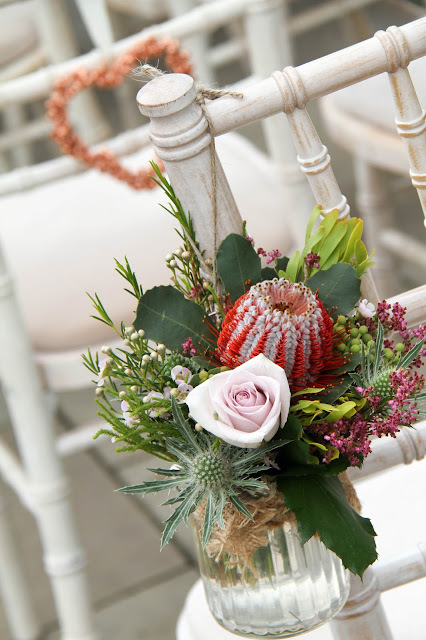 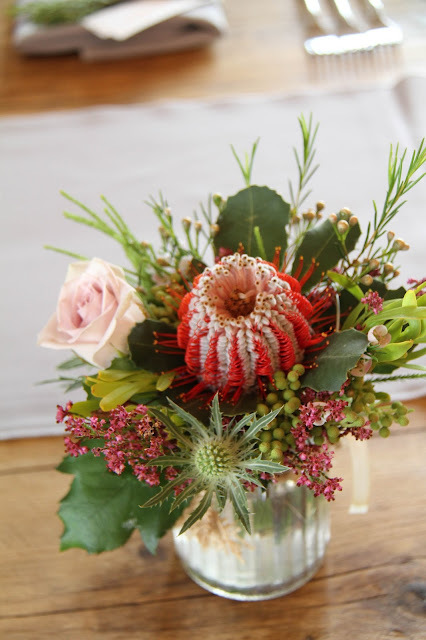 Leanne's Bouquet really did look glorious, the Proteas really added so much to this gloriously wild and textured design, I'd included lots of fresh Grasses too, the ceremony was always planned to be by the side of the lake, so I really wanted to include some lakeside materials, such as Typha & Chasmanthium Latifolia, fresh trails of Amaranthus and the Sea Holly seemed to be perfect accompaniments too, adding a watery vibe to the otherwise 'dry weather' Proteas. 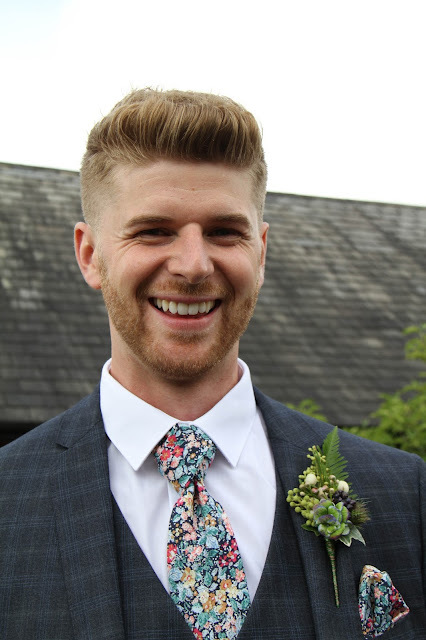 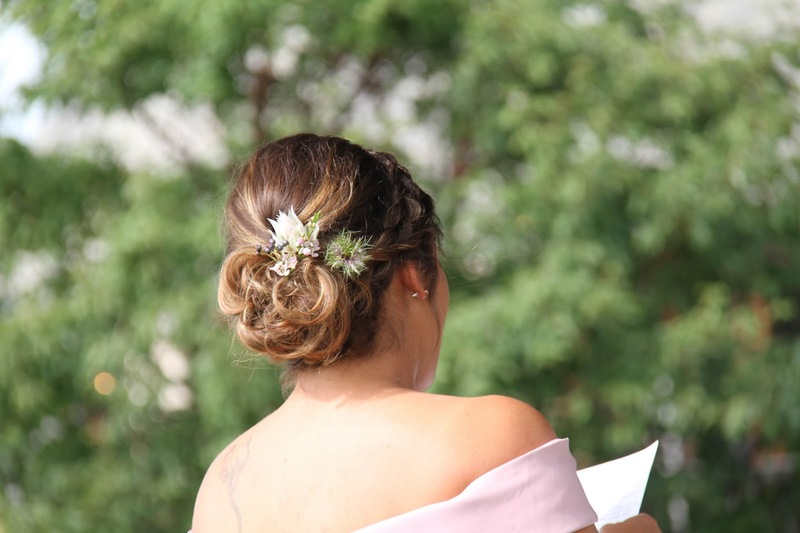 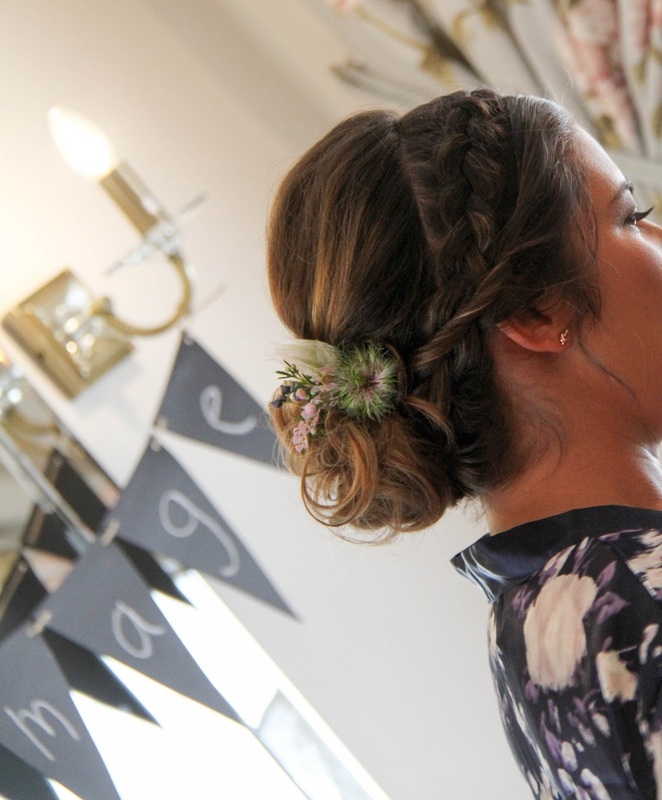 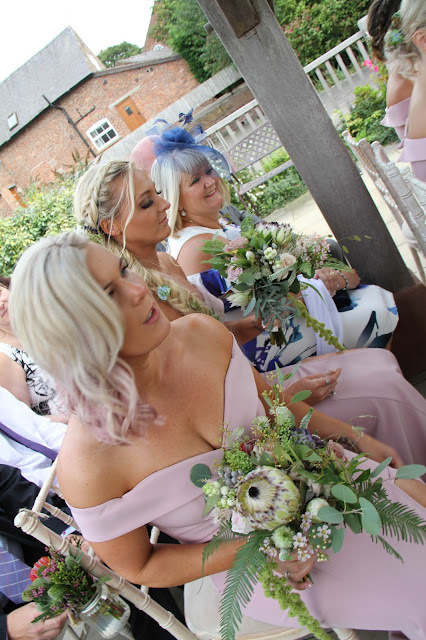 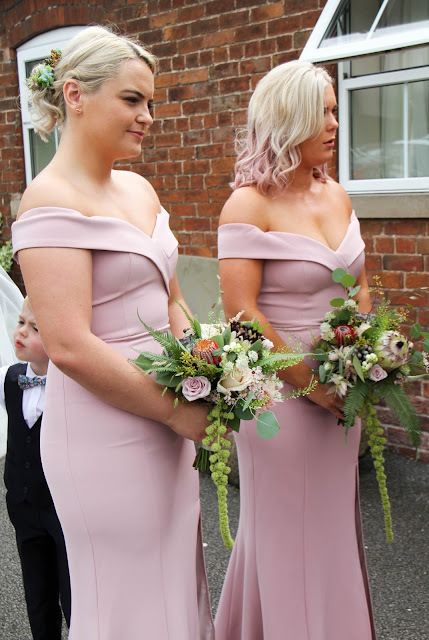 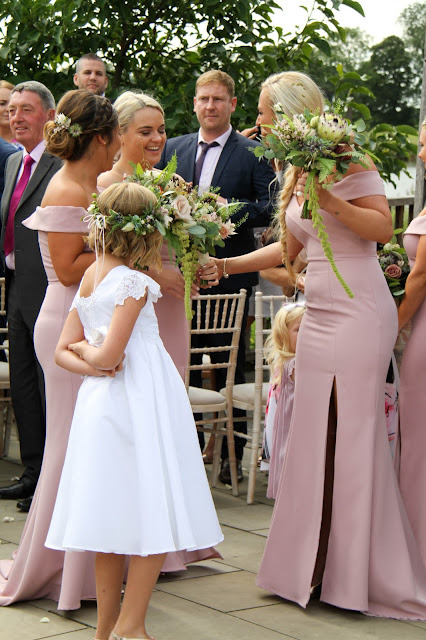 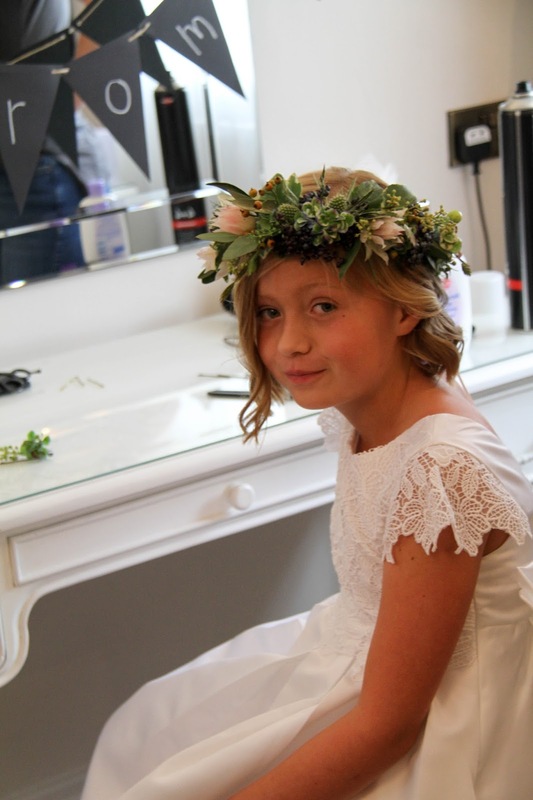 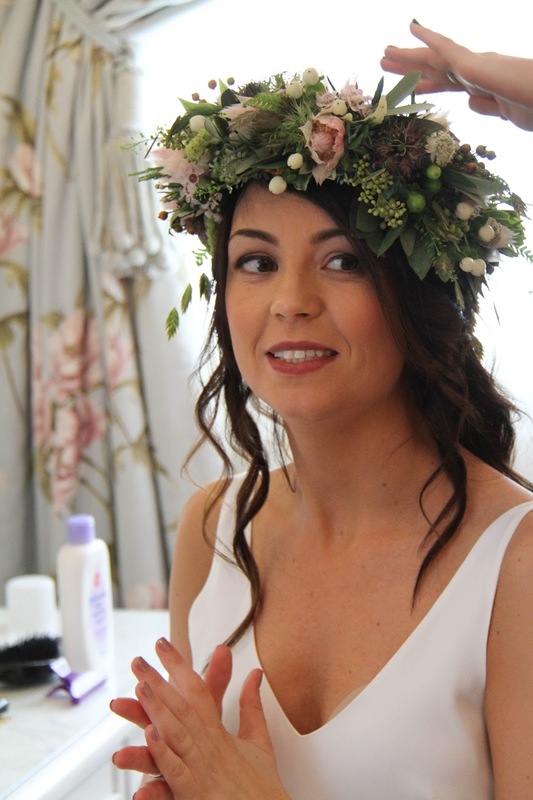 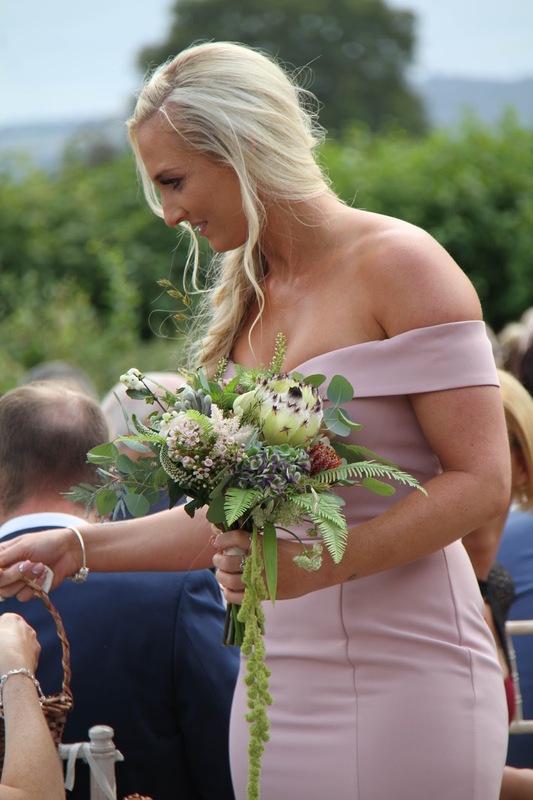 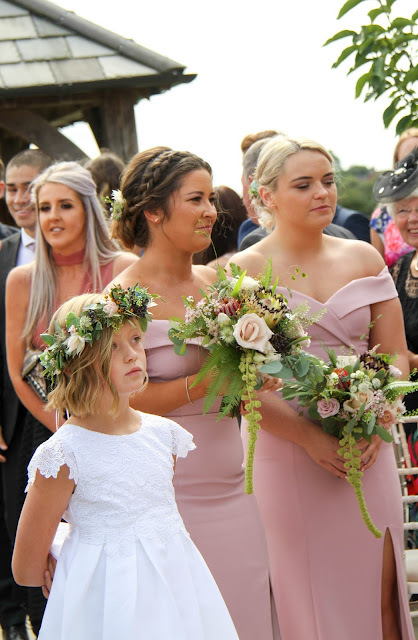 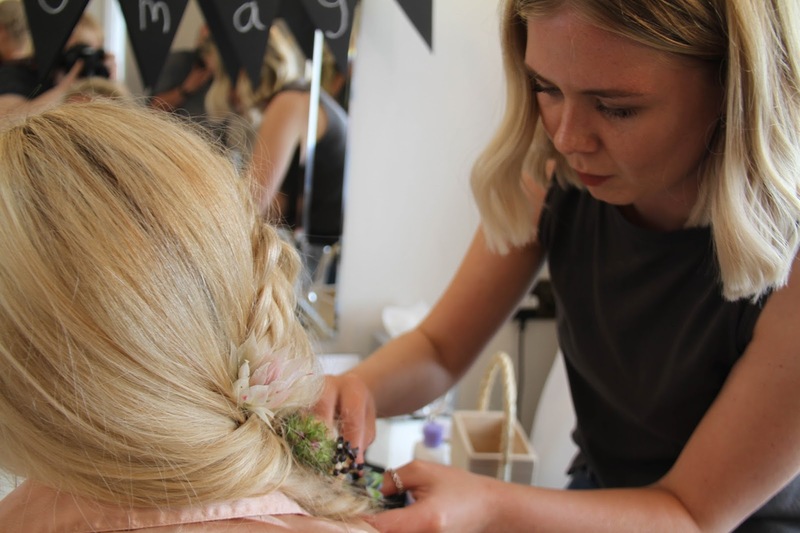 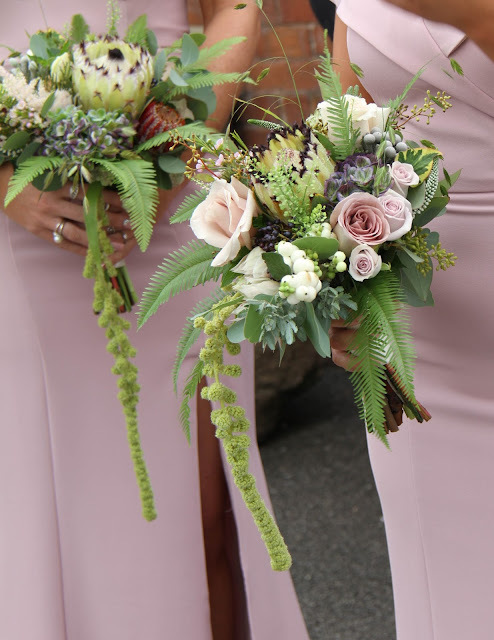 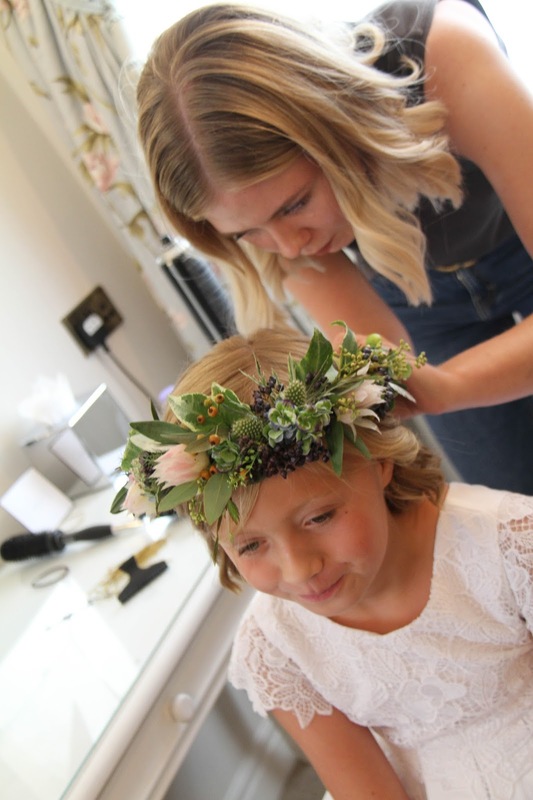 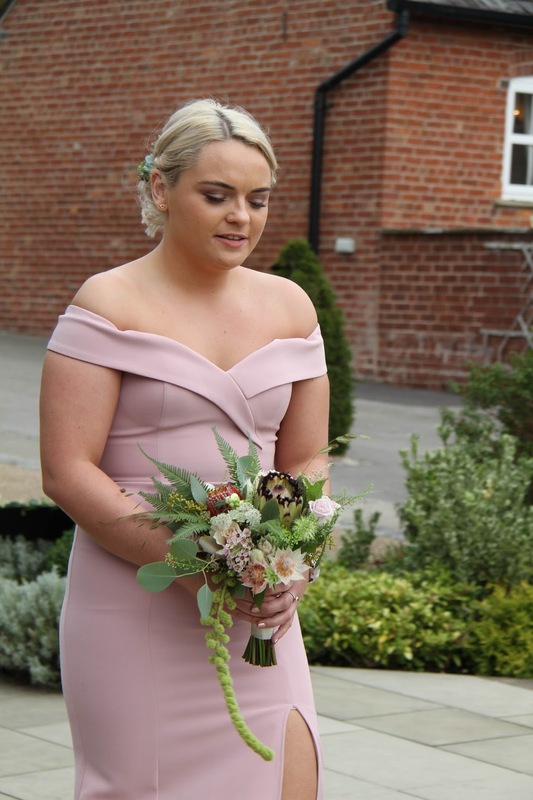 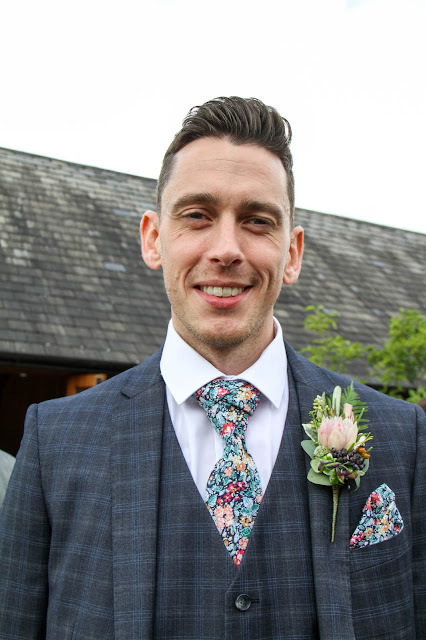 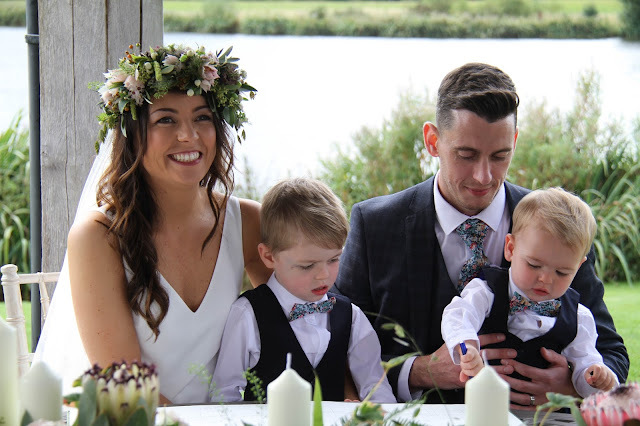 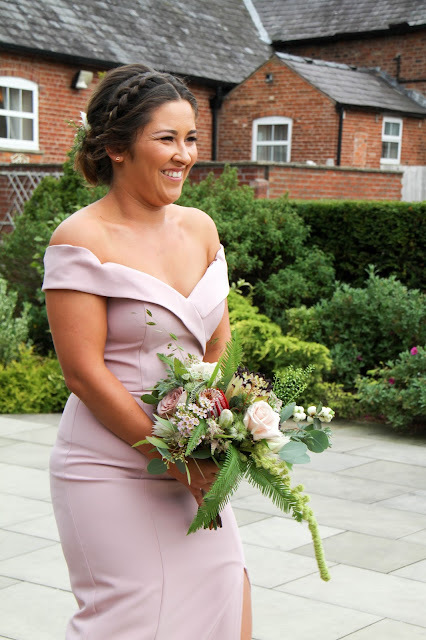 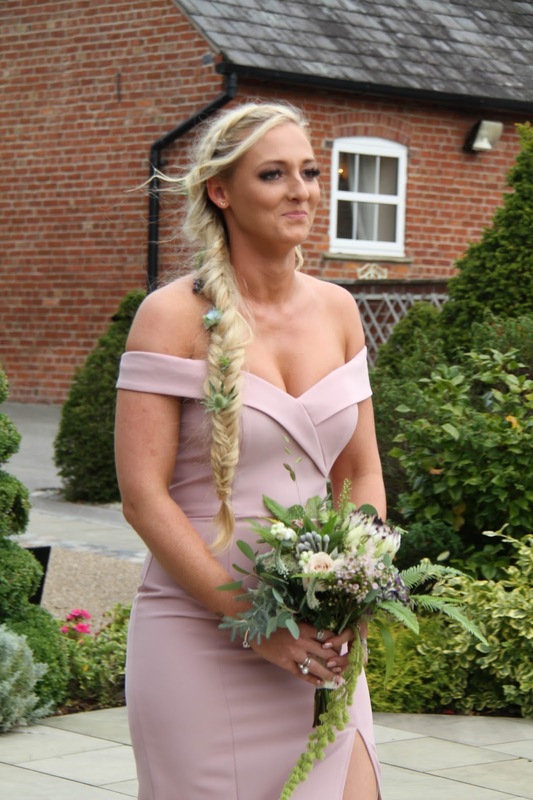 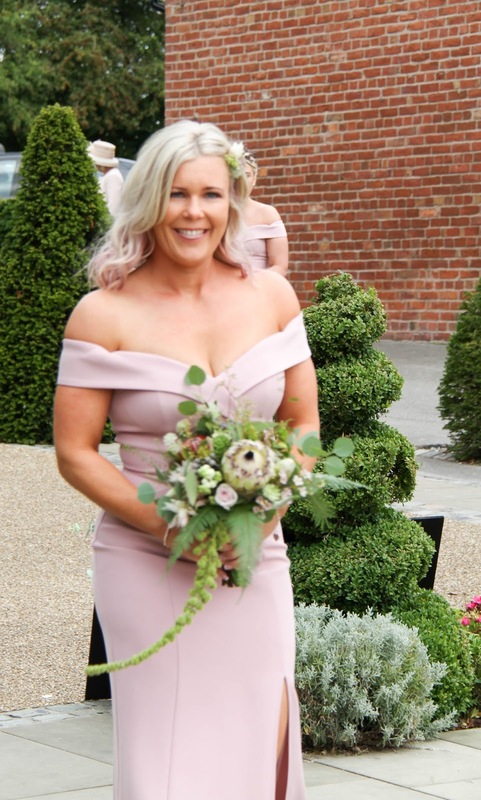 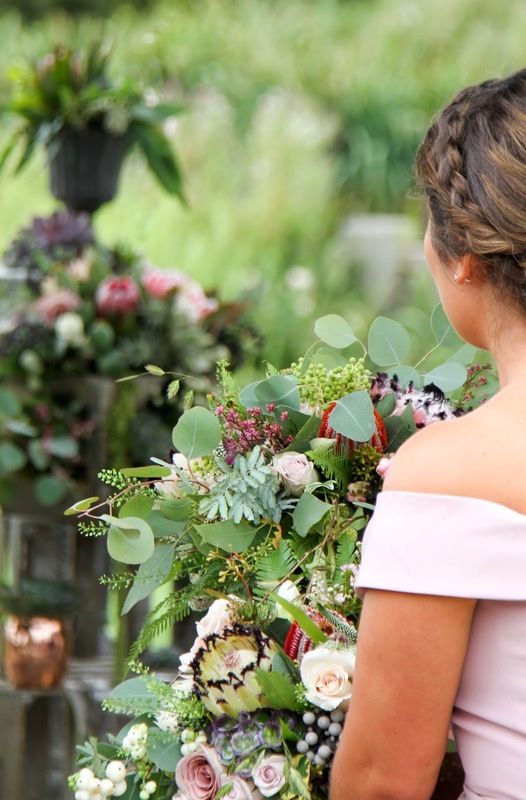 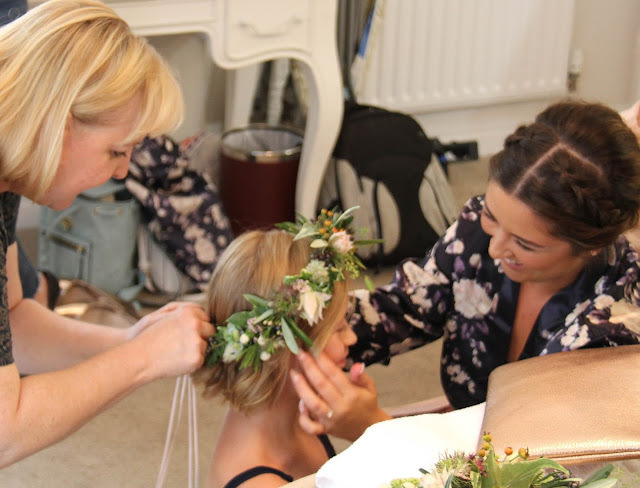 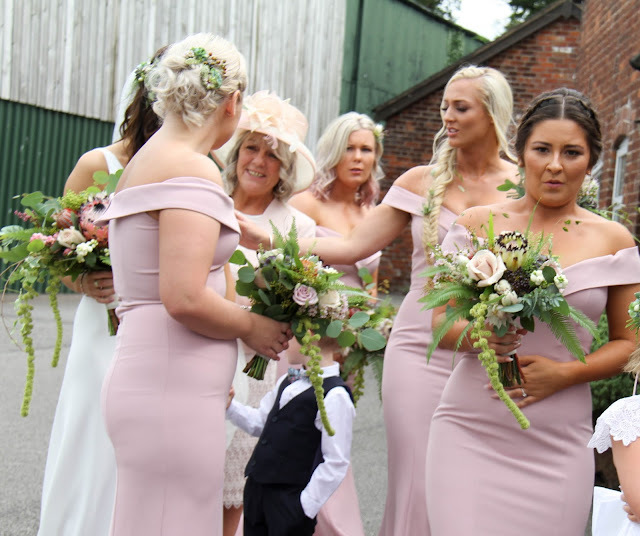 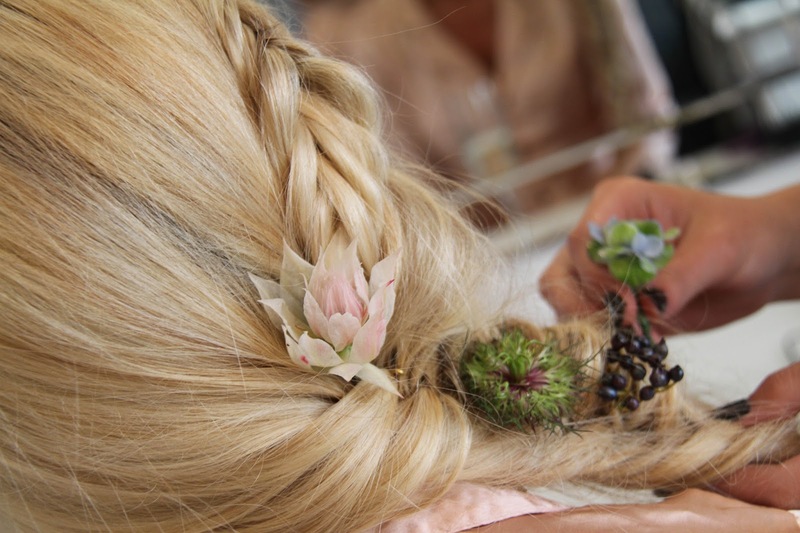 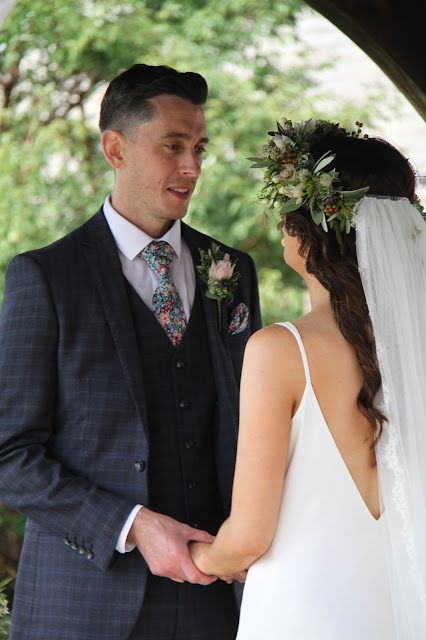 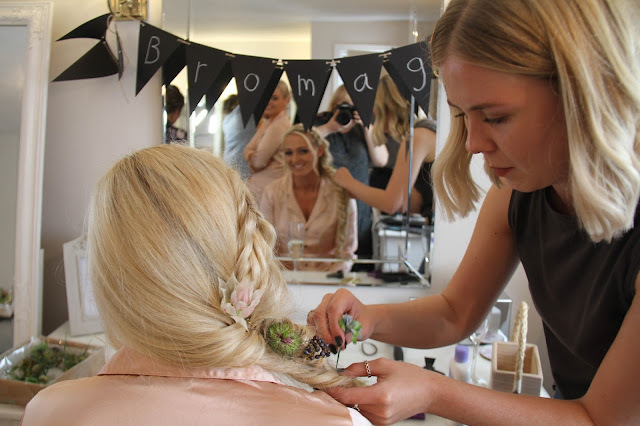 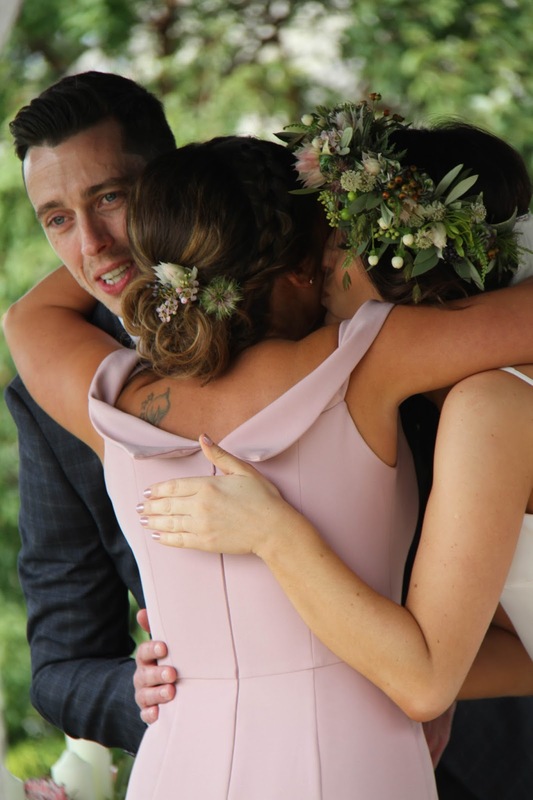 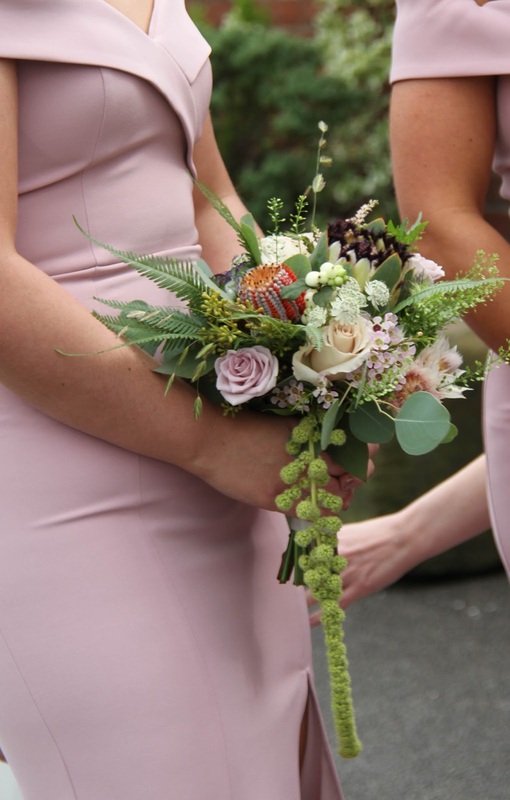 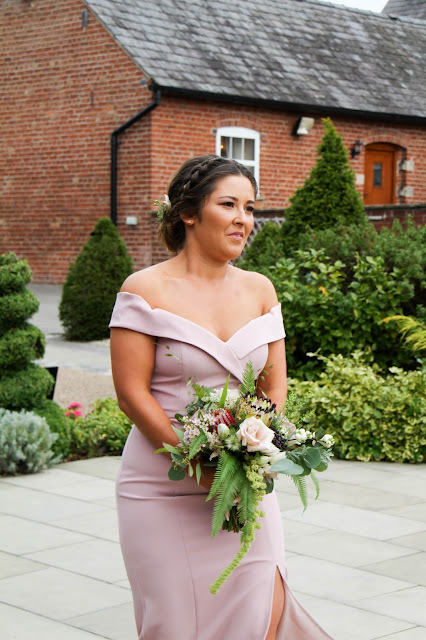 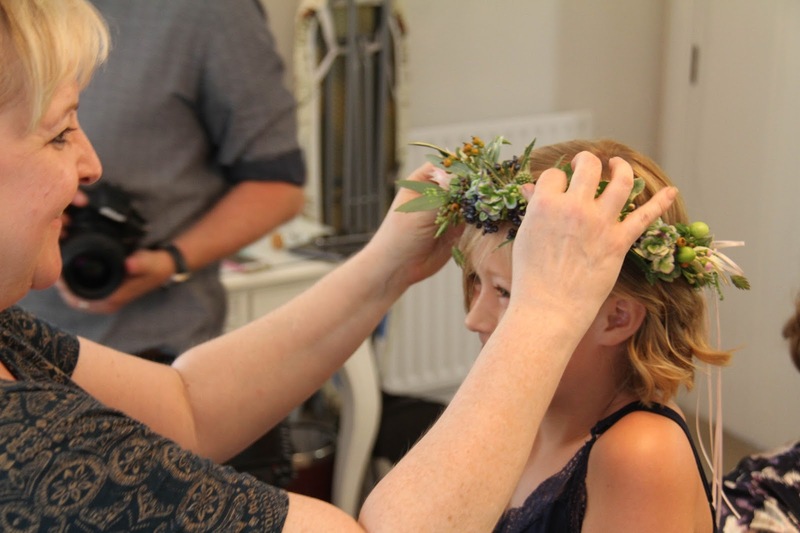 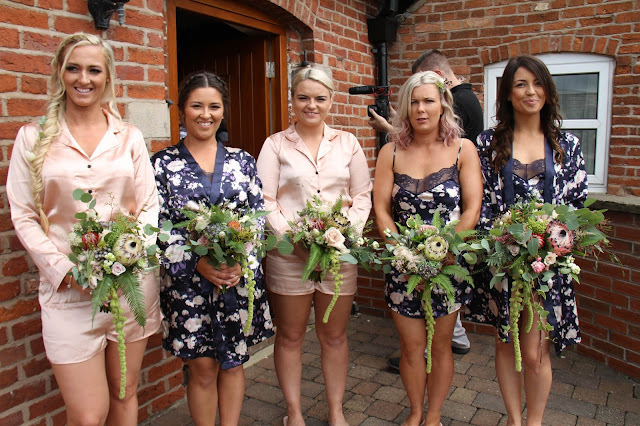 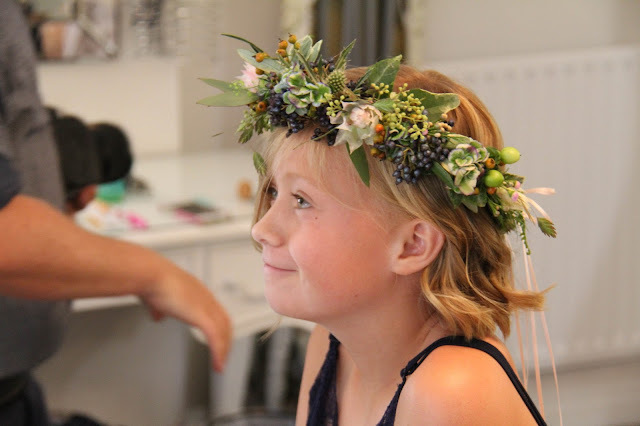 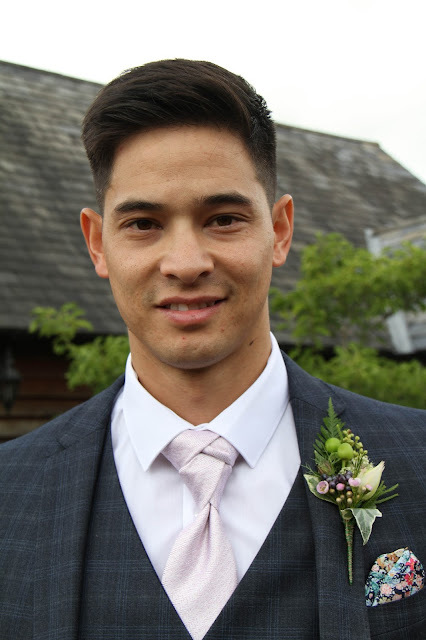 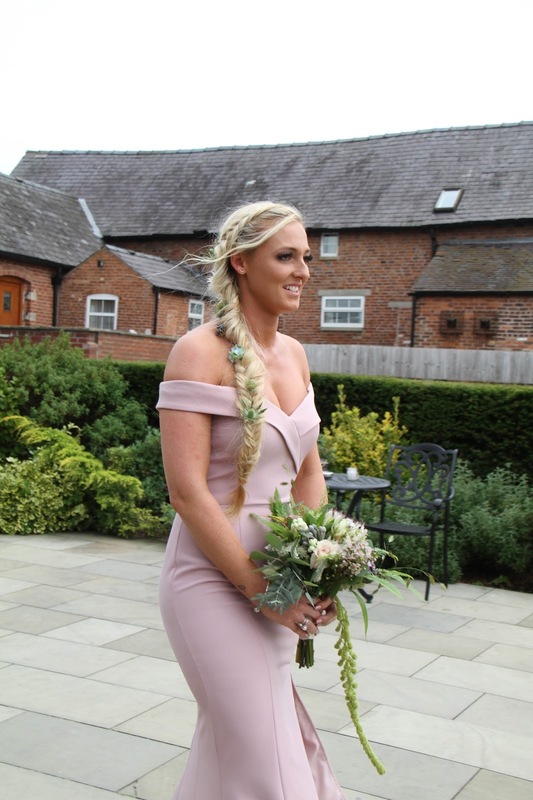 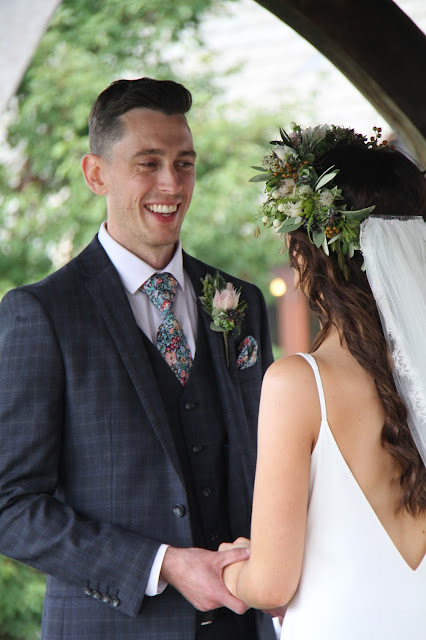 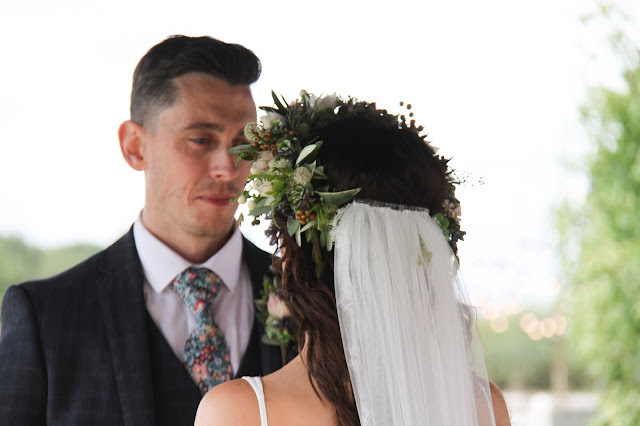 The Bridesmaid's were all having fresh flowers in their hair, but done to suit their individual hairstyles, this works best when you have a great hair dresser on the wedding the team from Salon Glo were exceptional. 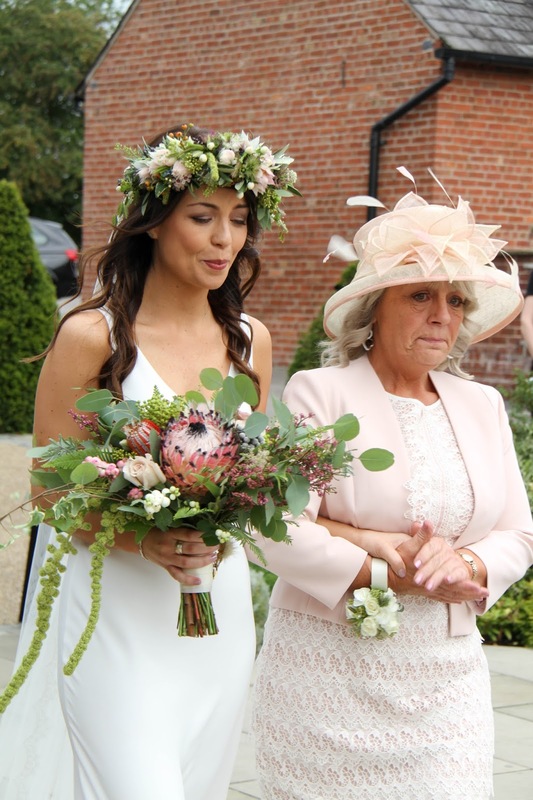 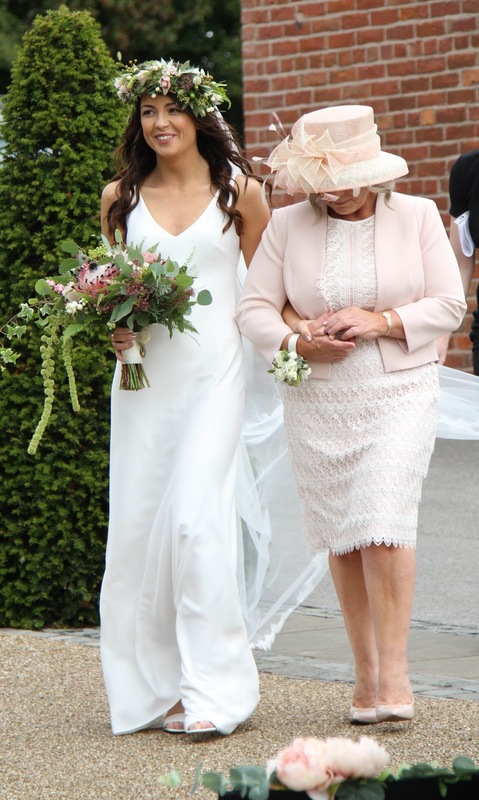 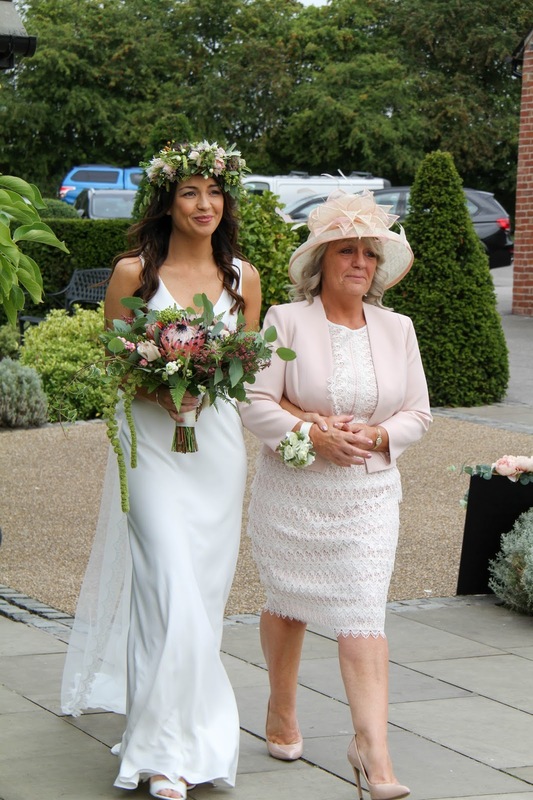 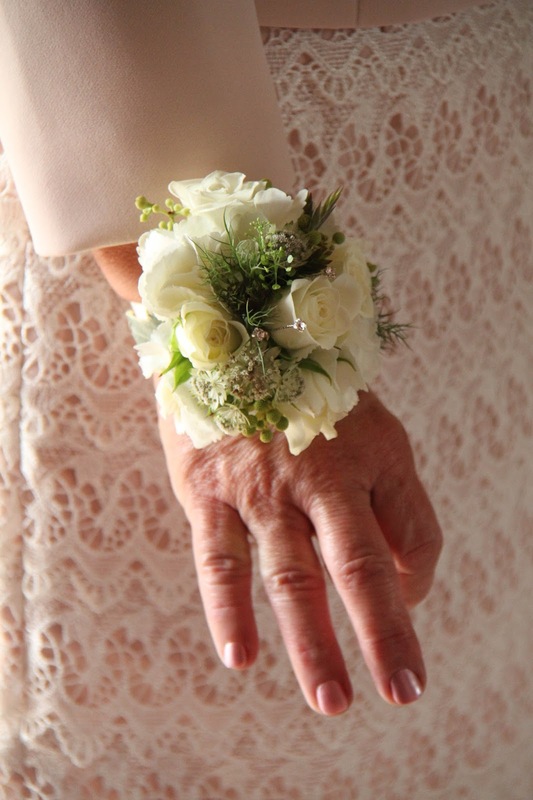 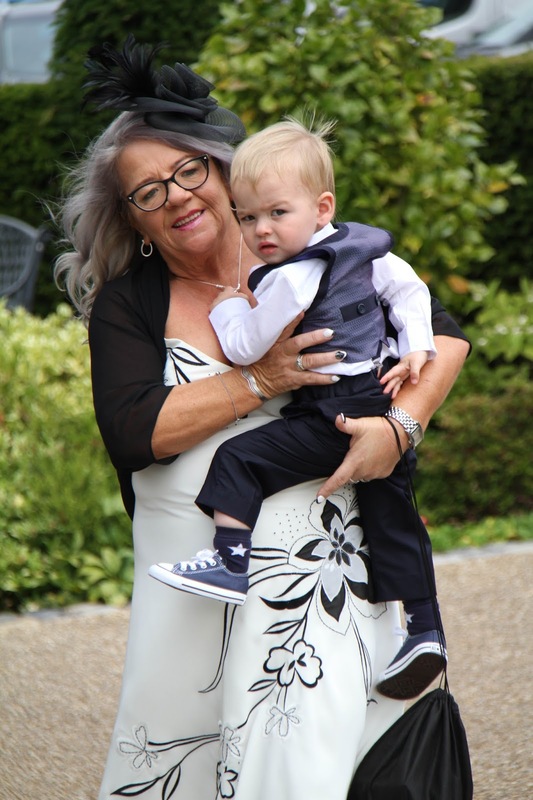 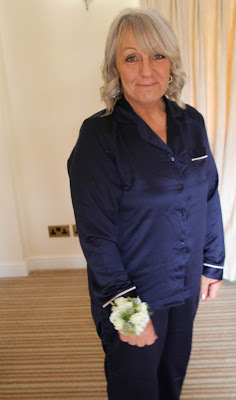 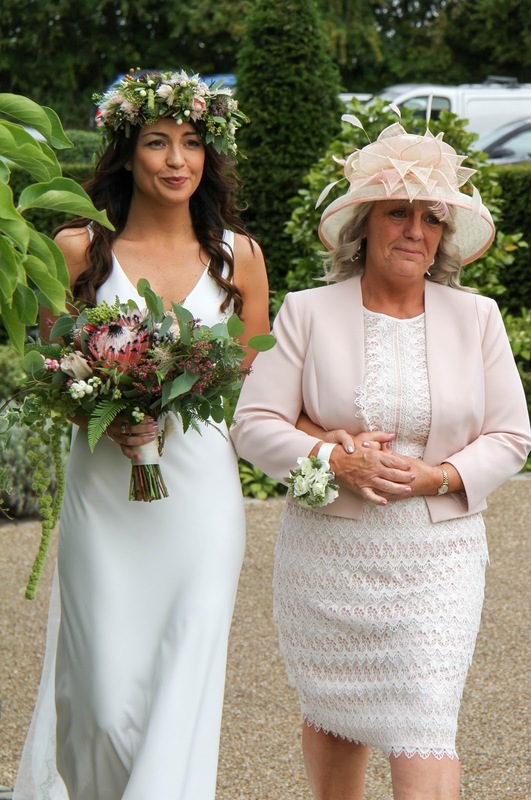 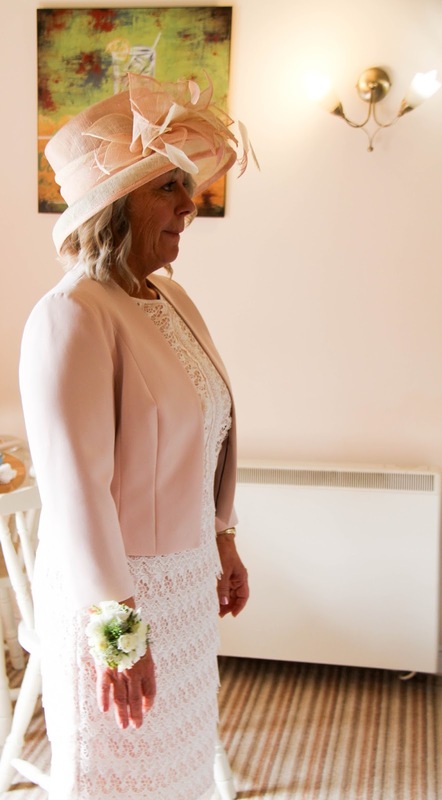 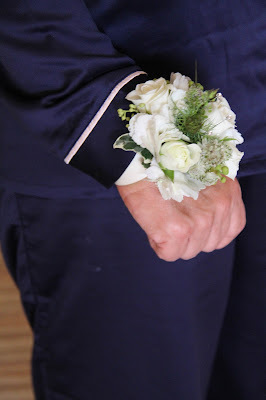 The beautiful Bride's Mum Denise seriously rocking those pj's, I made sure her wrist corsage fitted her perfectly too. 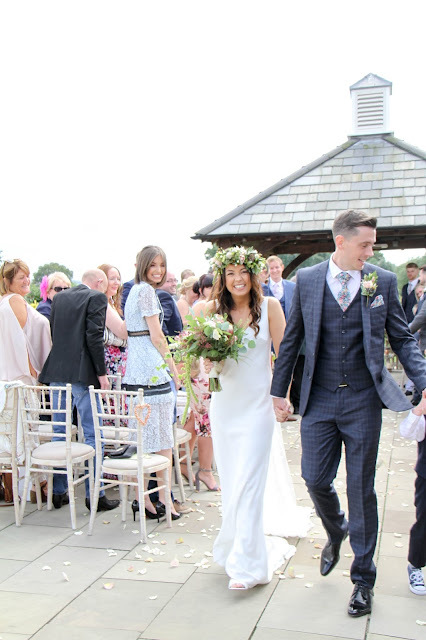 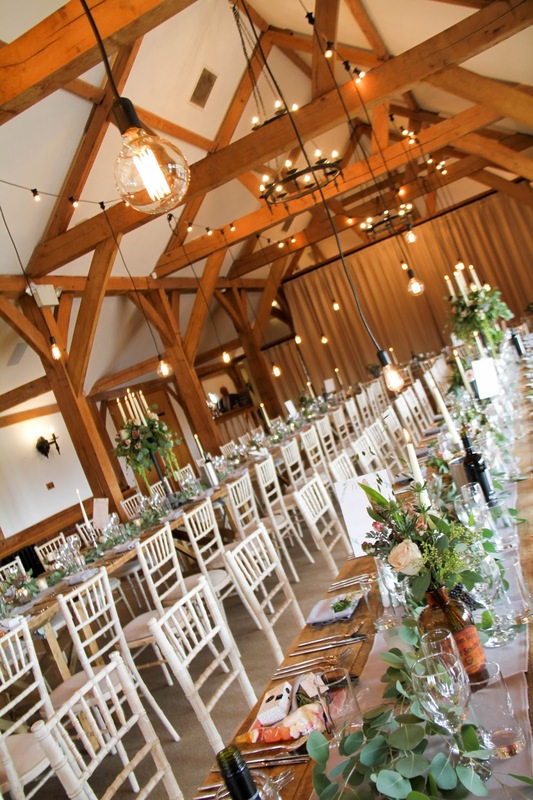 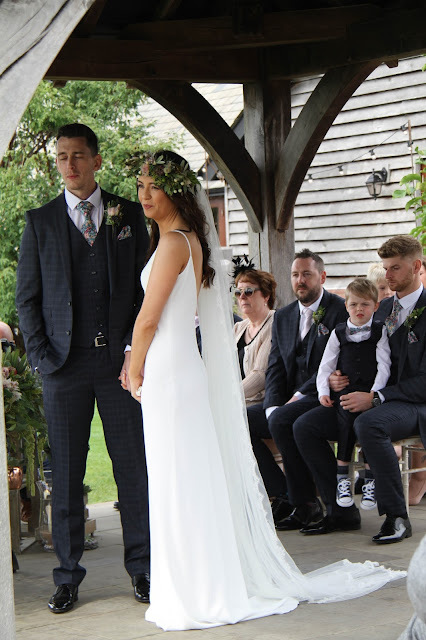 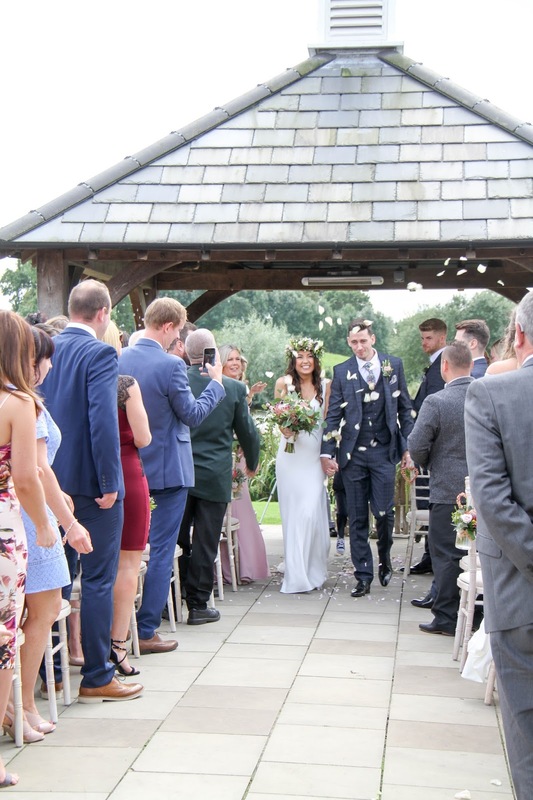 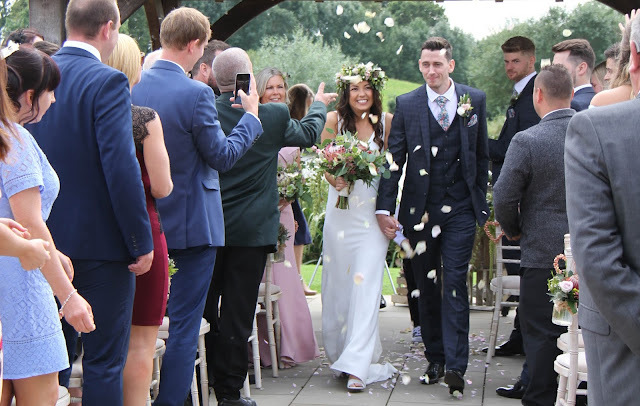 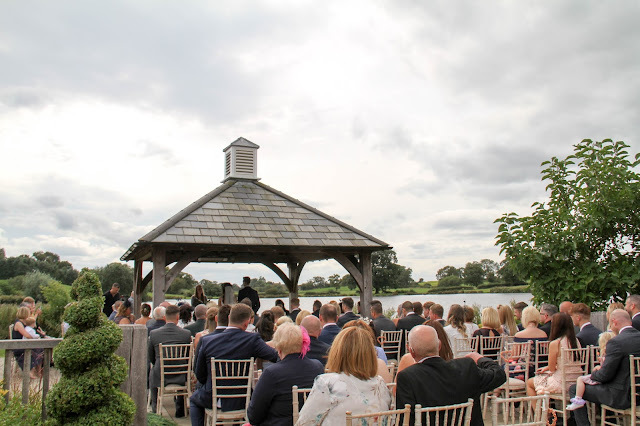 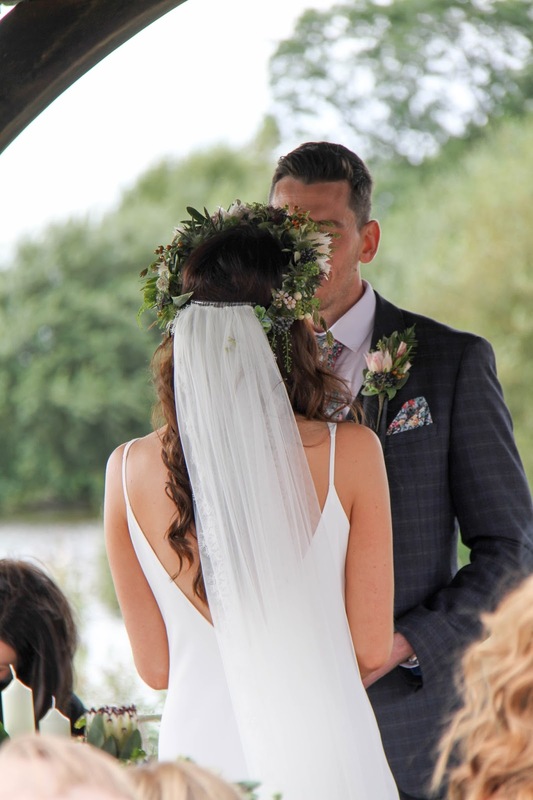 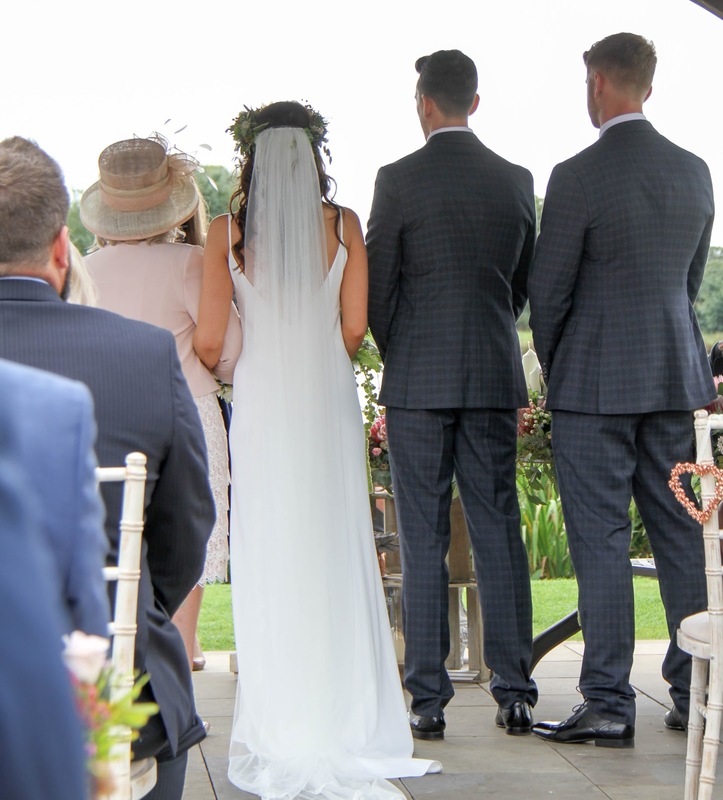 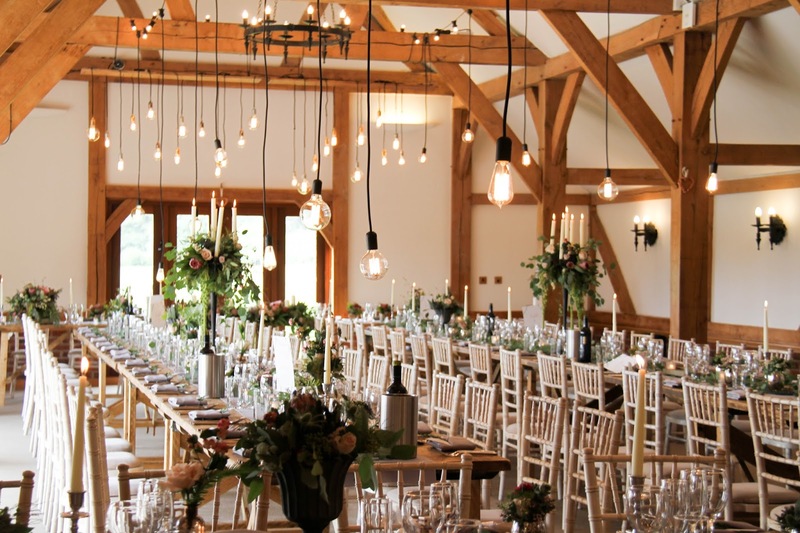 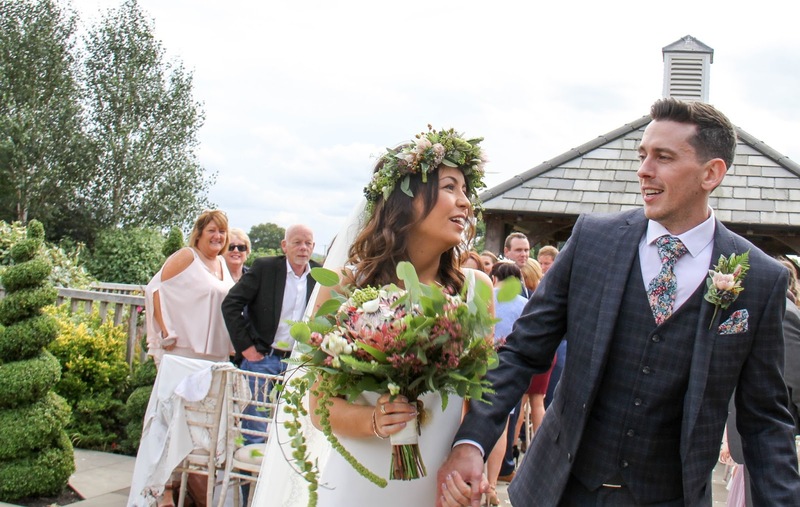 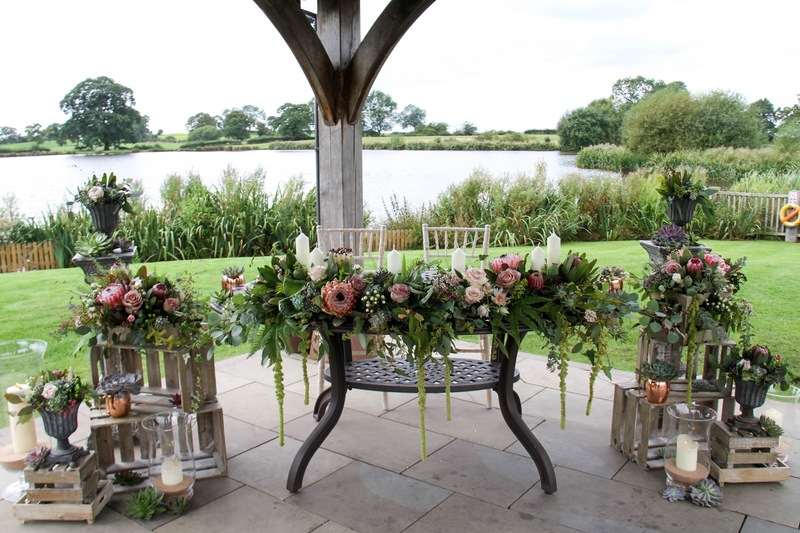 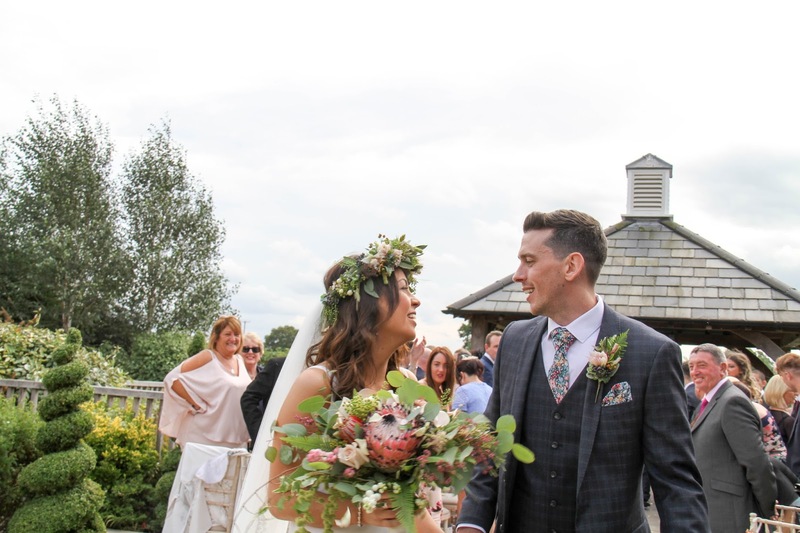 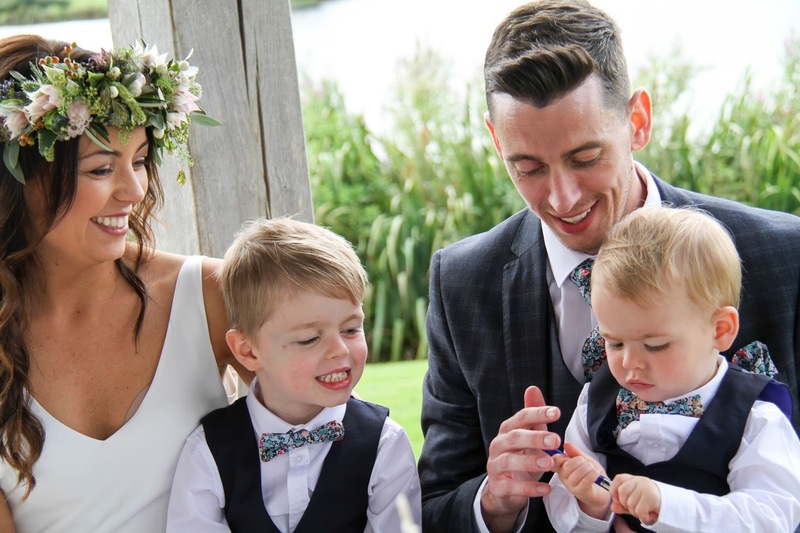 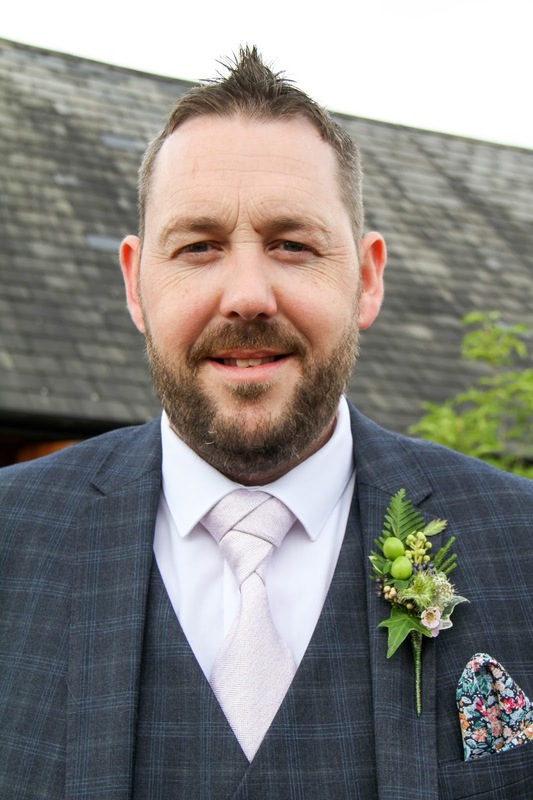 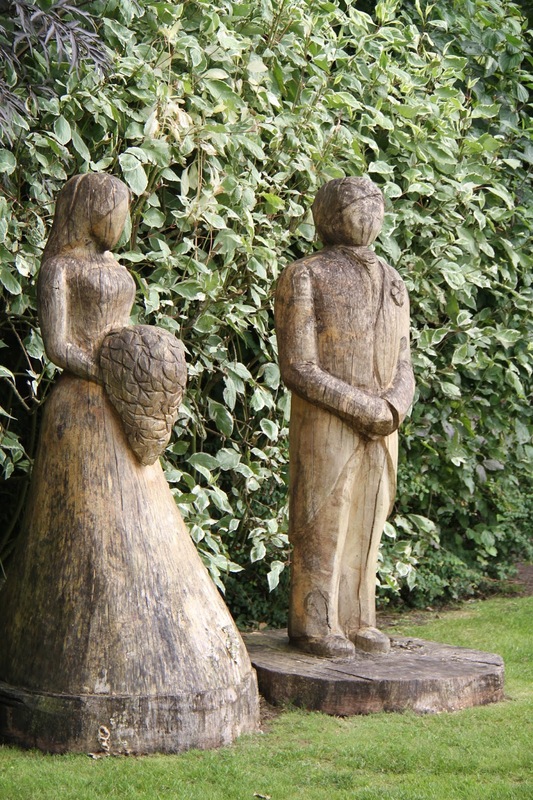 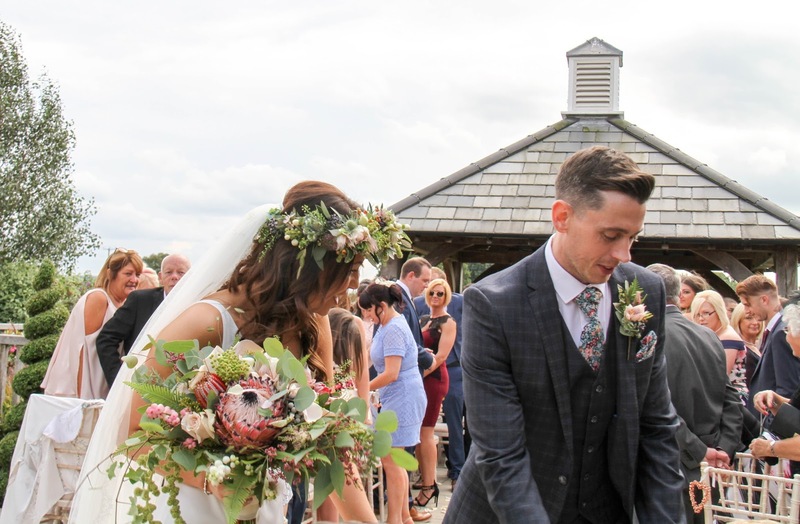 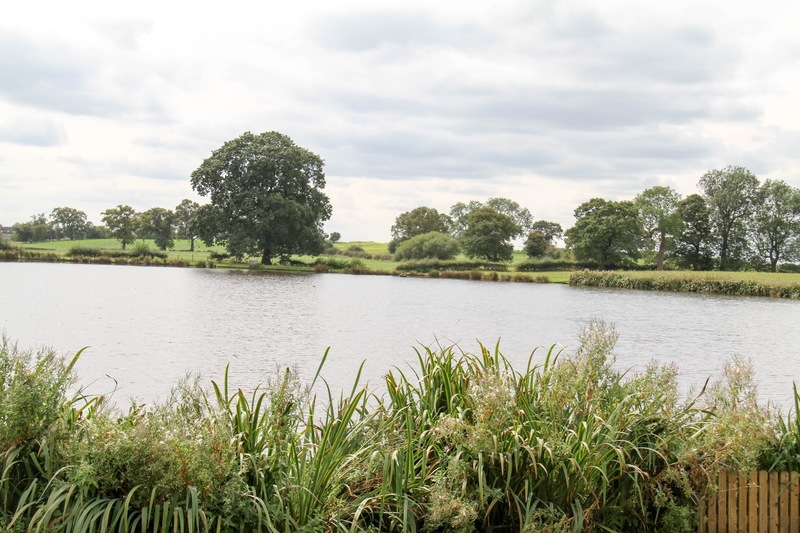 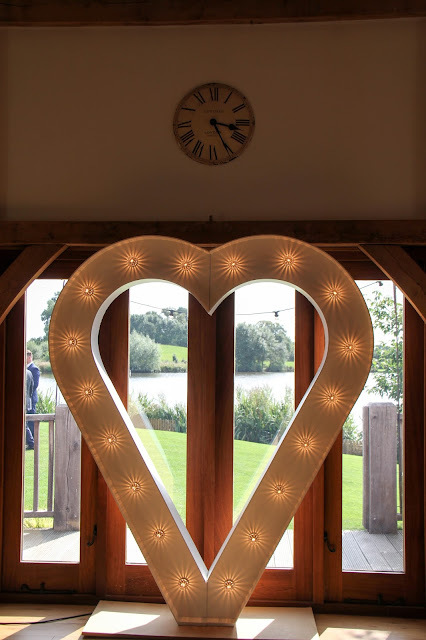 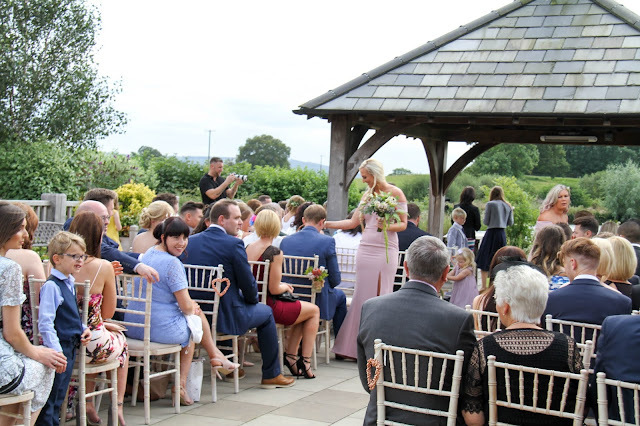 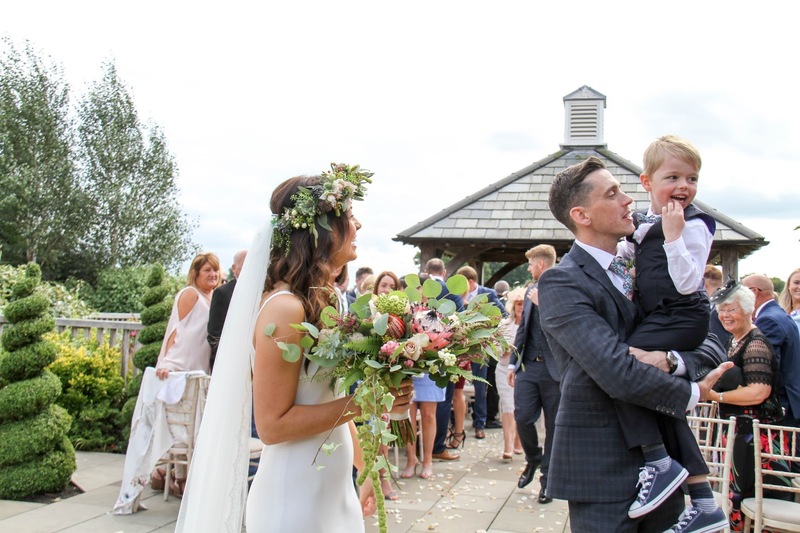 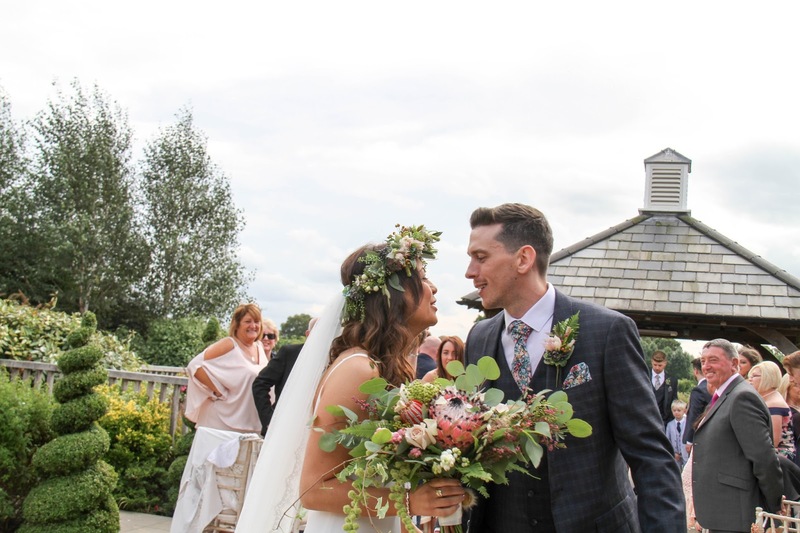 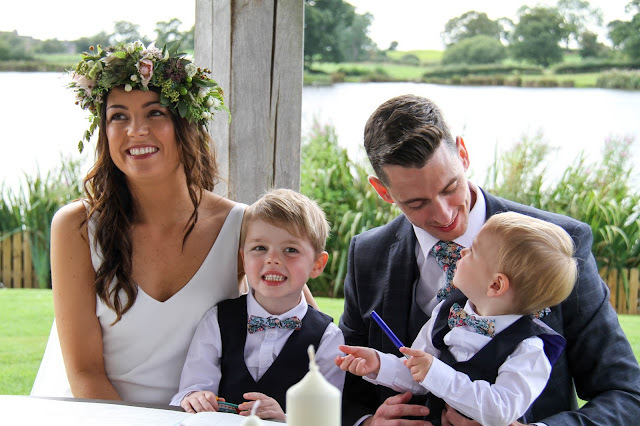 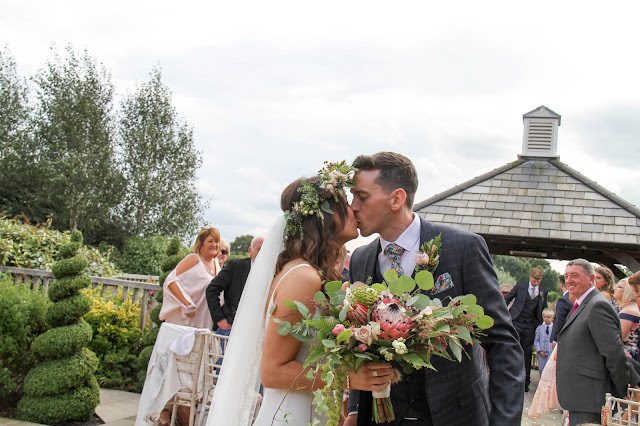 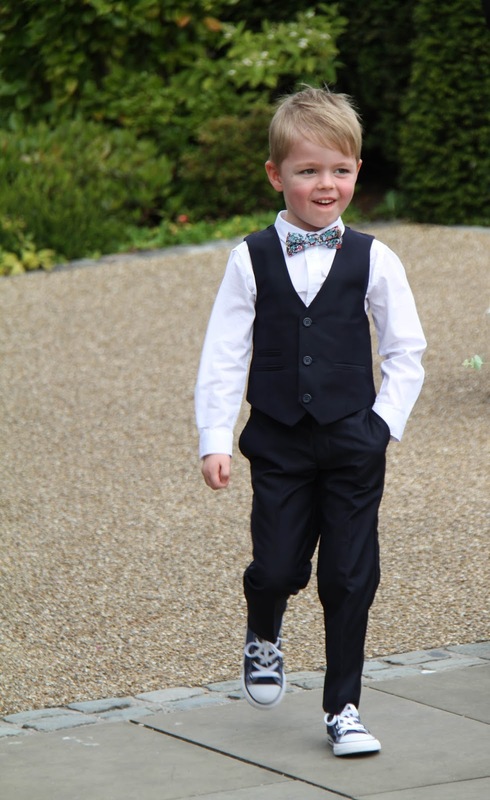 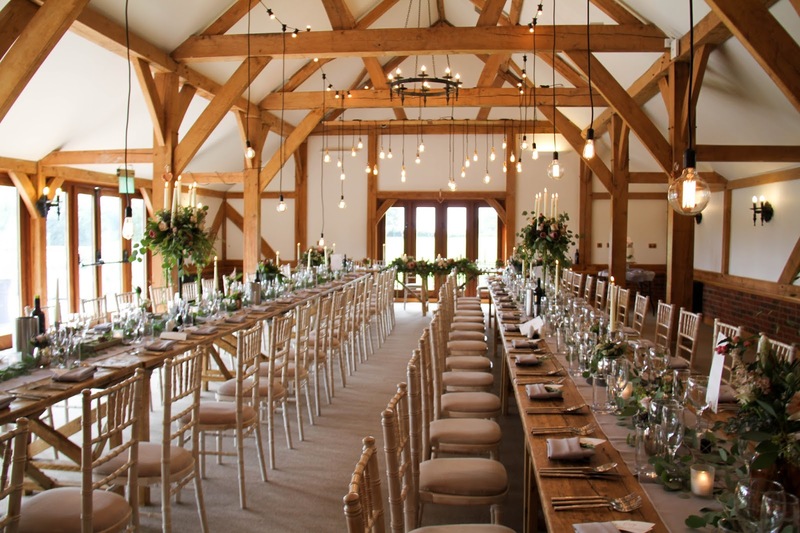 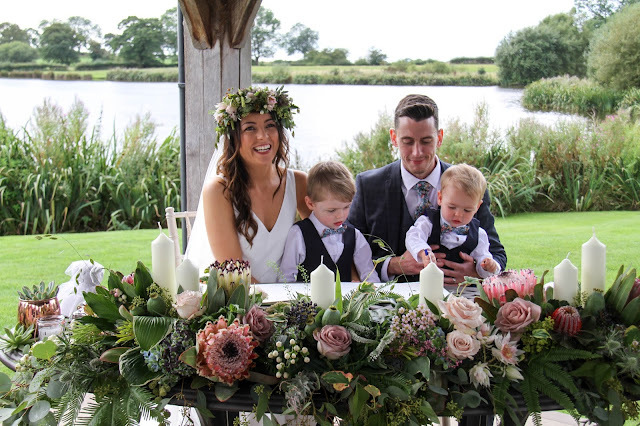 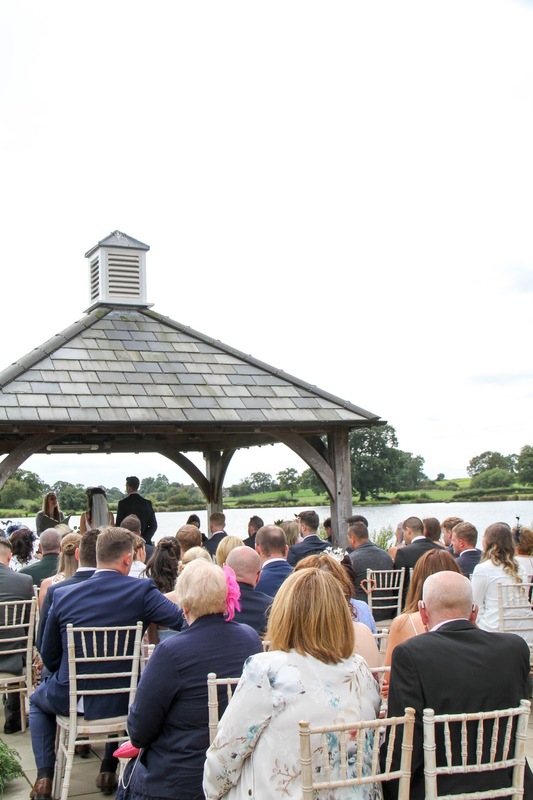 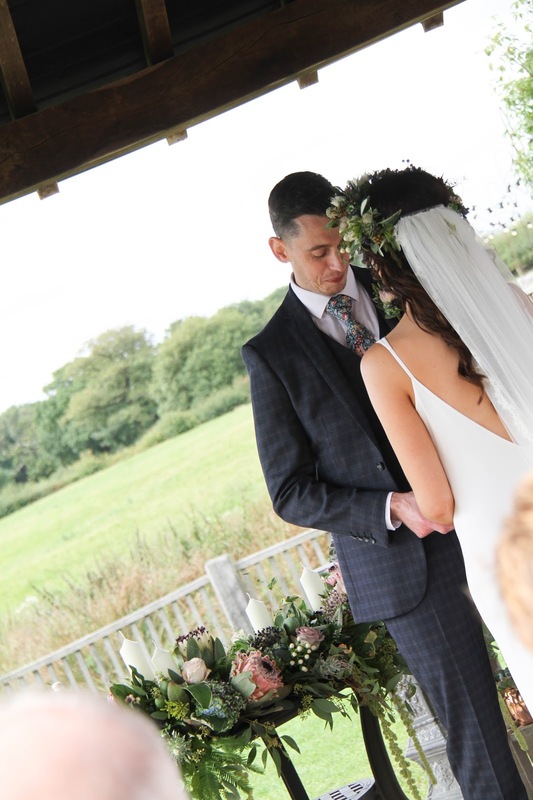 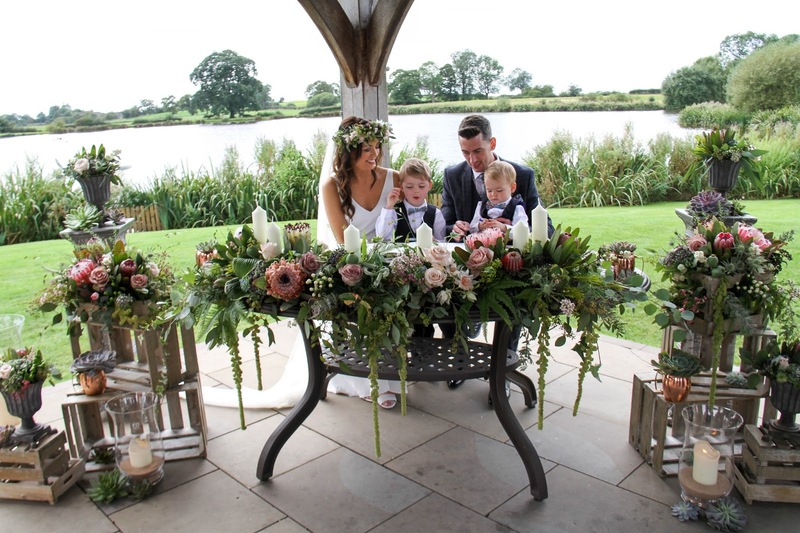 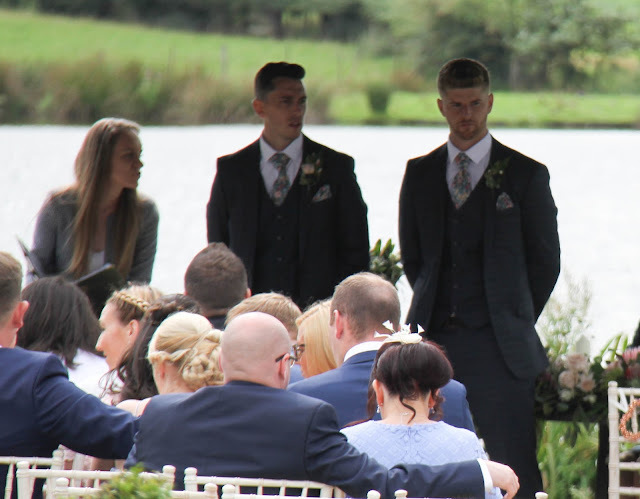 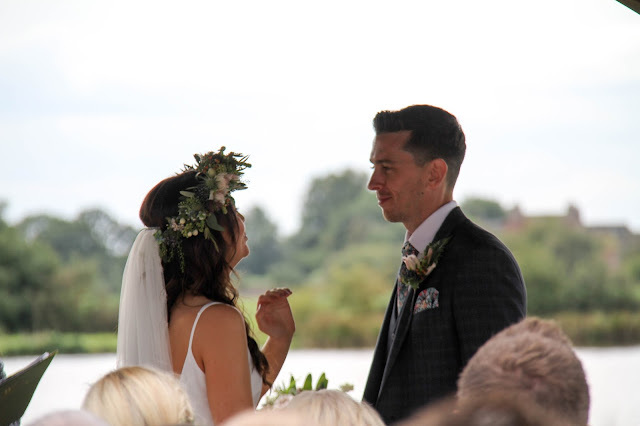 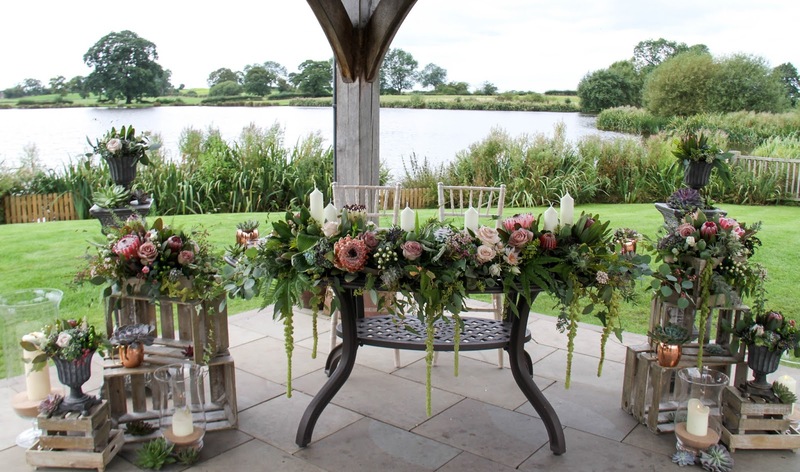 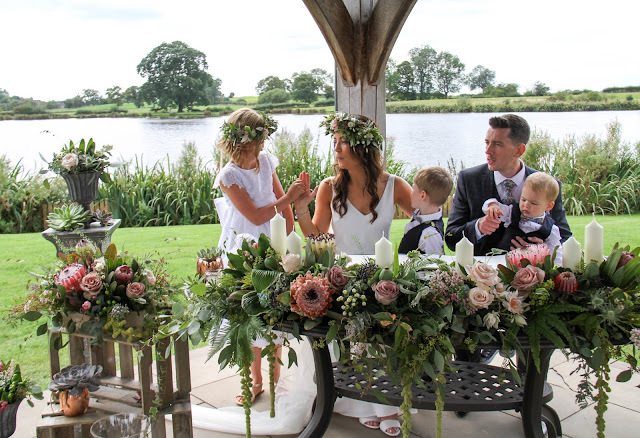 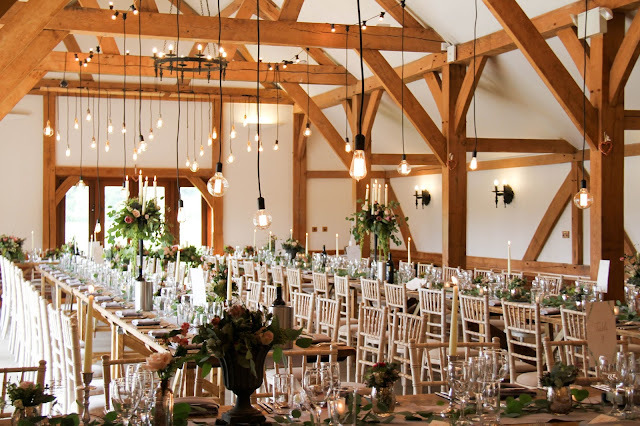 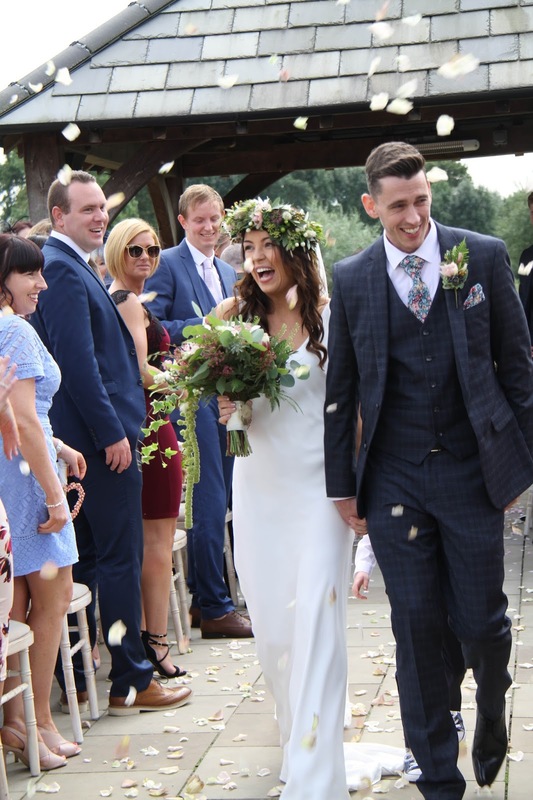 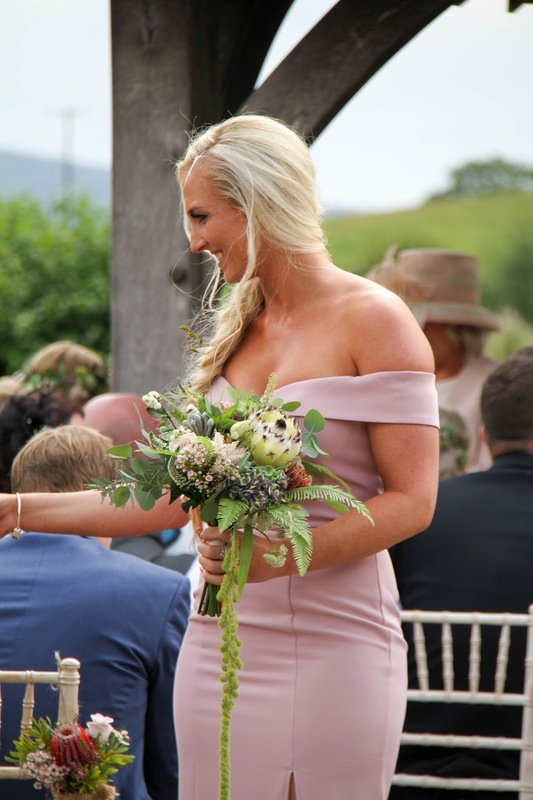 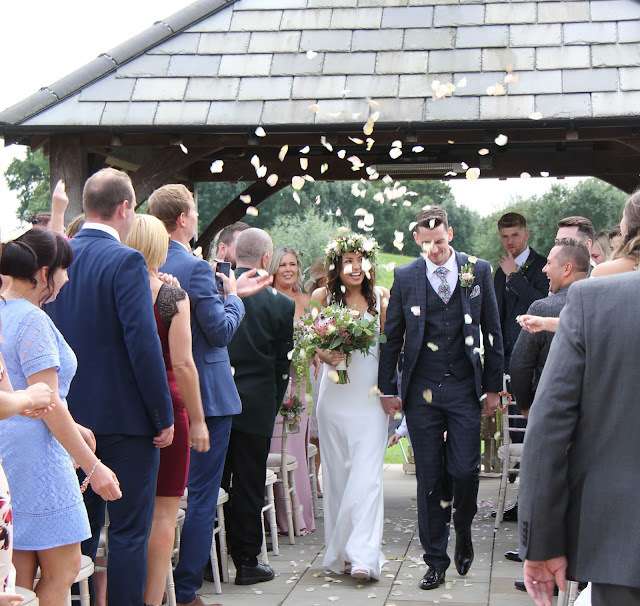 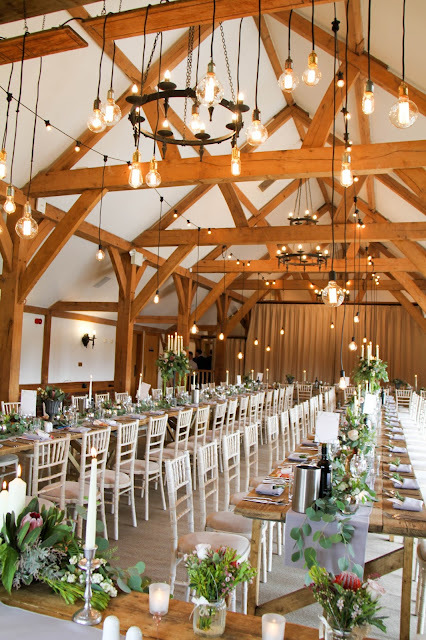 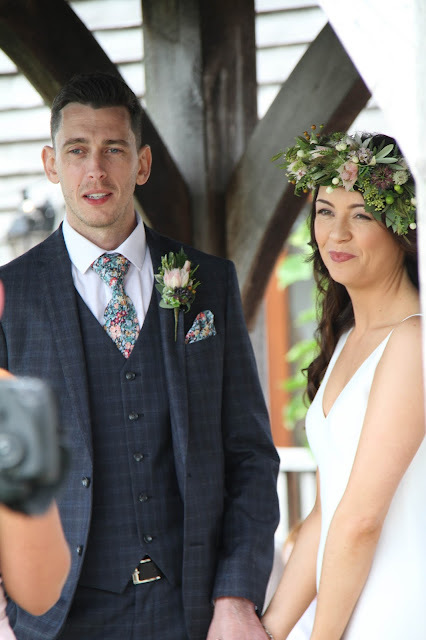 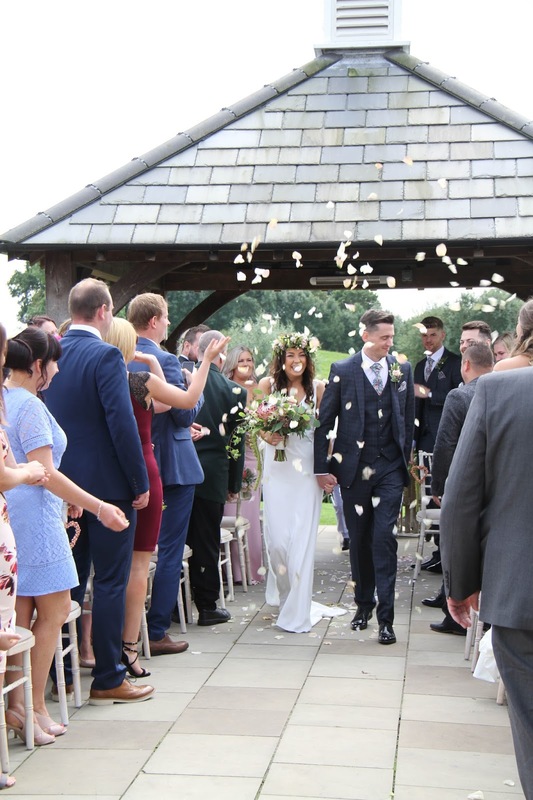 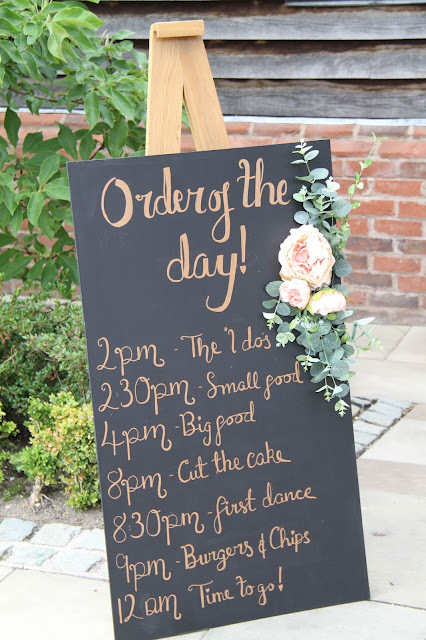 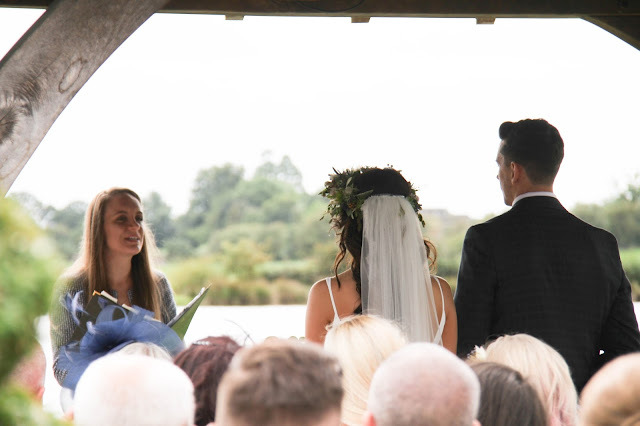 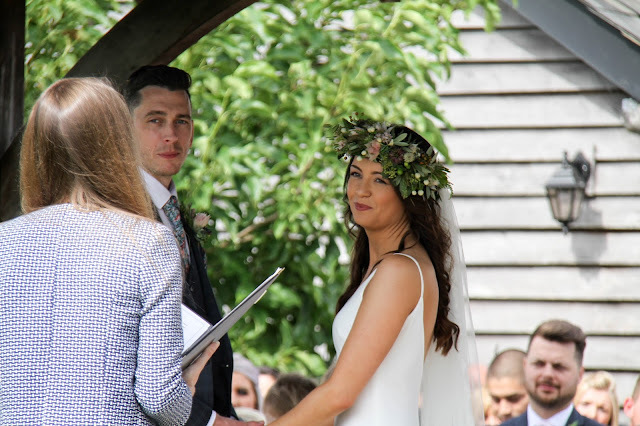 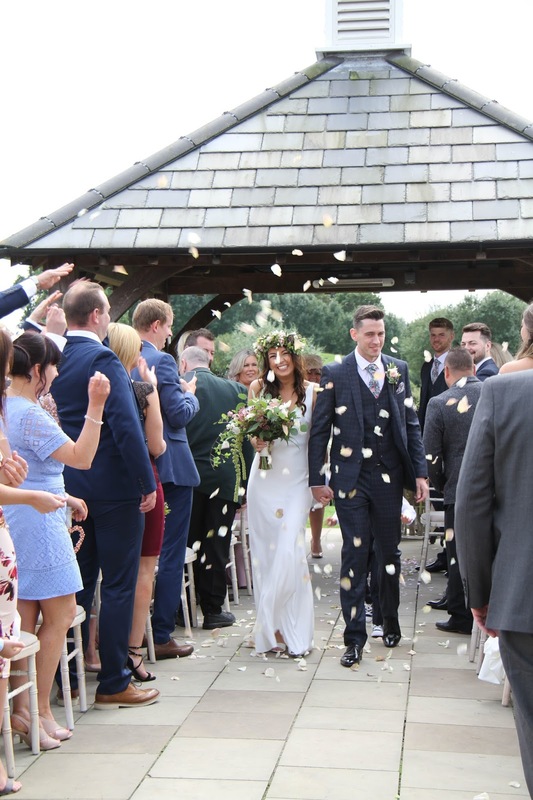 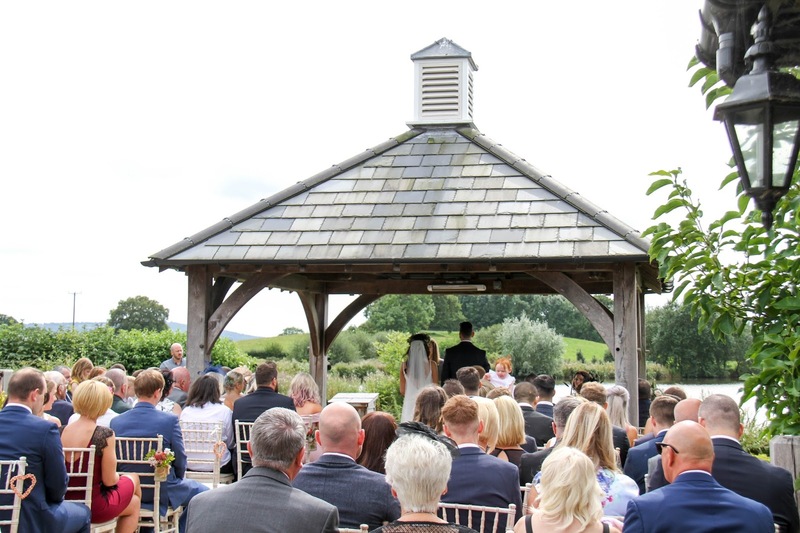 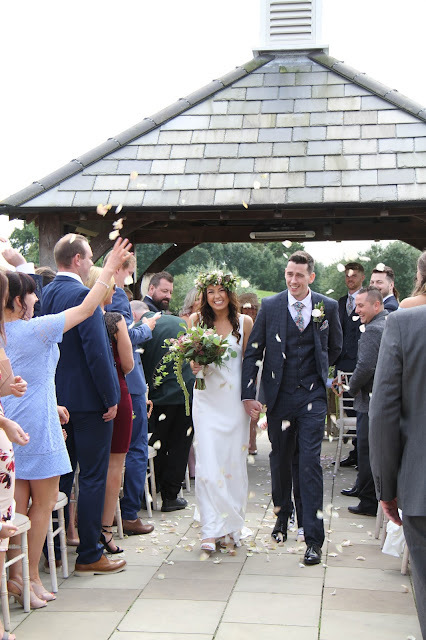 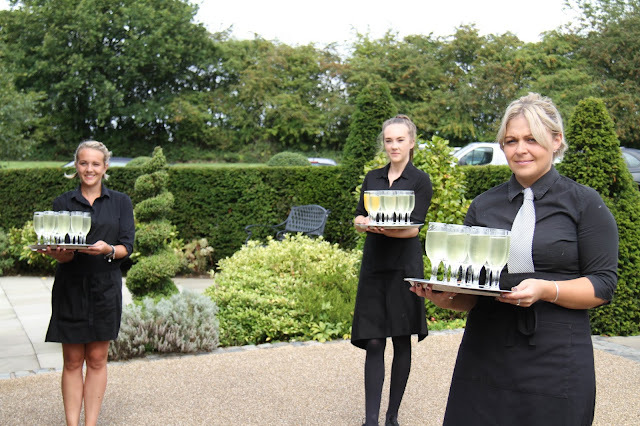 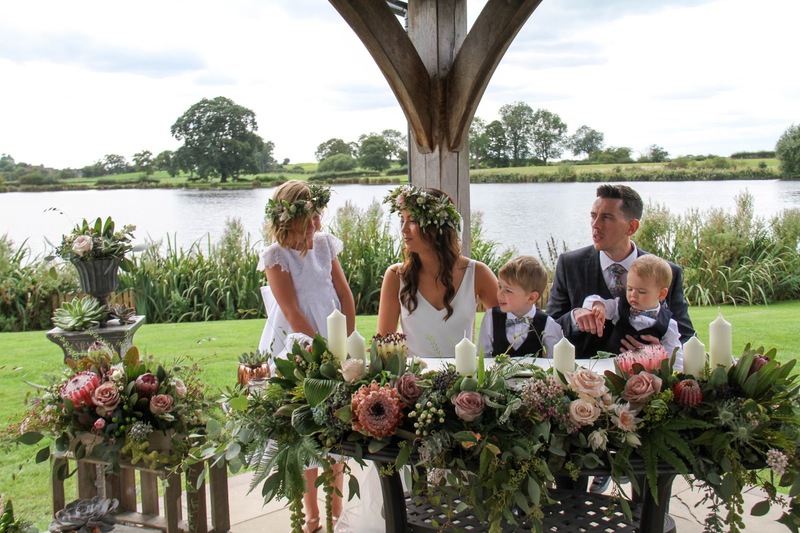 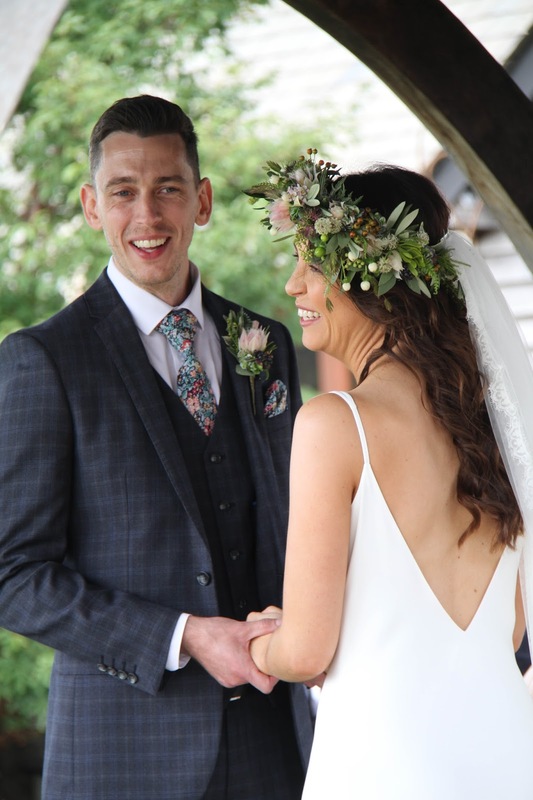 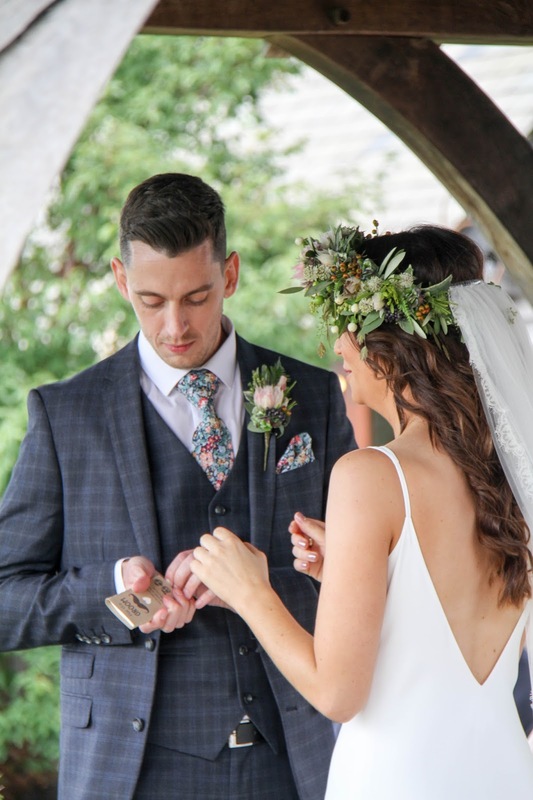 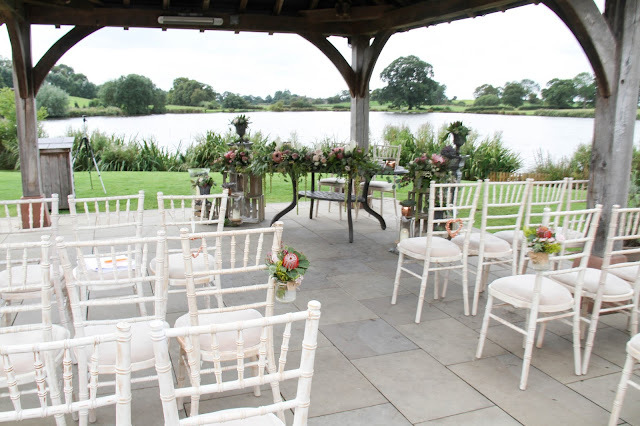 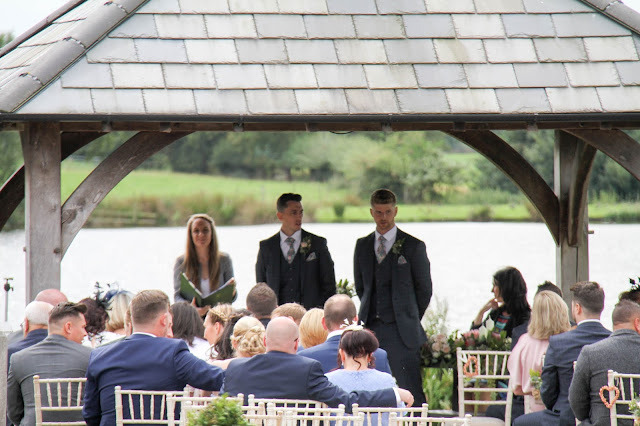 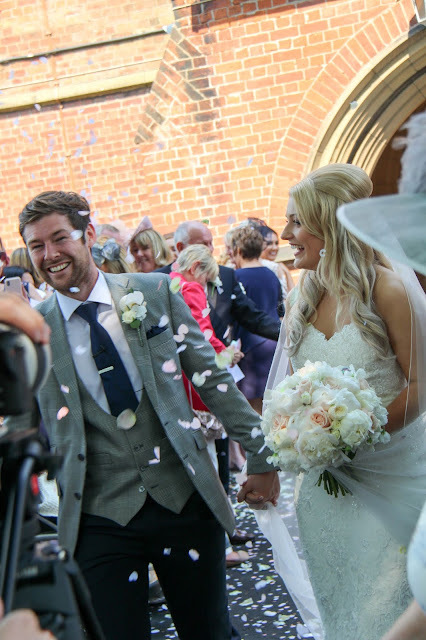 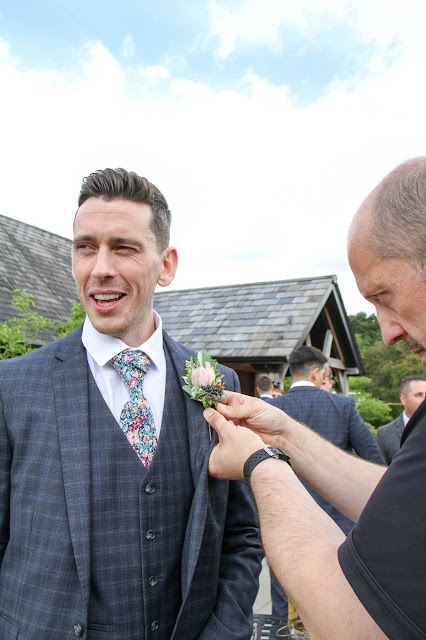 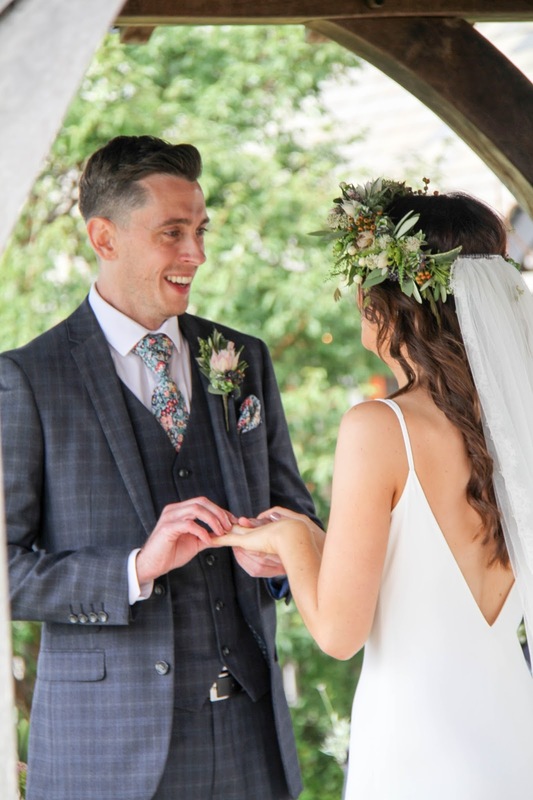 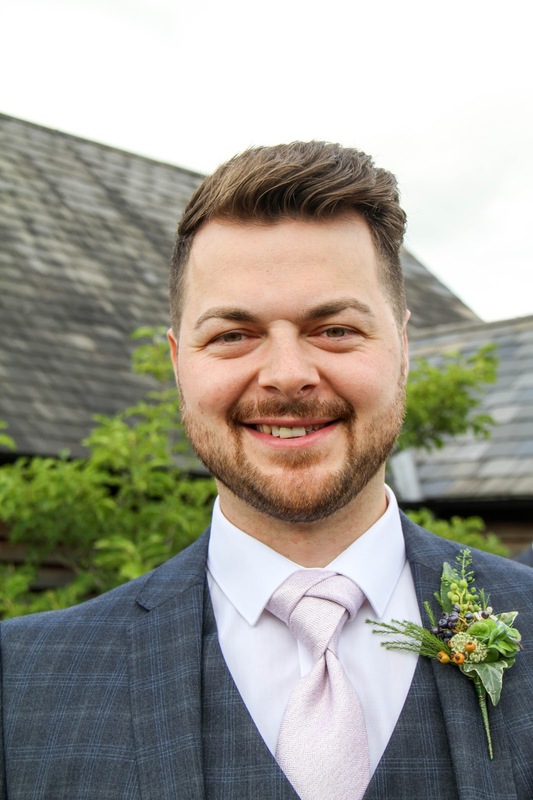 Outside on the lakeside the sun was shining the sky was blue and the scene was set for the ceremony, we found everyone at Sandhole Oak Barn to be hugely helpful, they seemed to thoroughly enjoy the flowers and took a real pride in their venue, it was a huge pleasure to work there. The Registrars table was framed by some pretty incredible fresh flowers, Proteas and Succulents, we designed the Registrars table design to reflect the back drop, we'd arranged the flowers, foliages and grasses in a 'vegetative' style grouped and clustered to mirror the planting around the lake just behind. 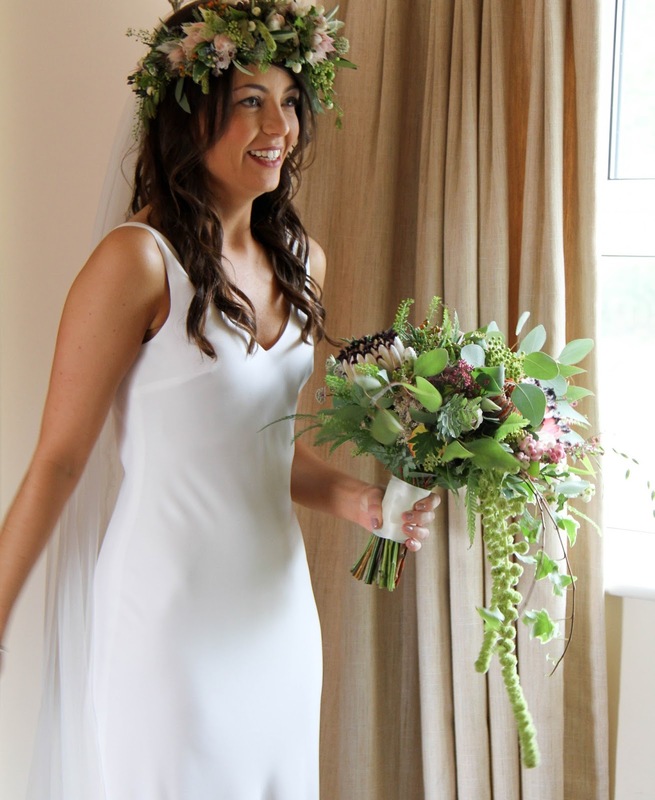 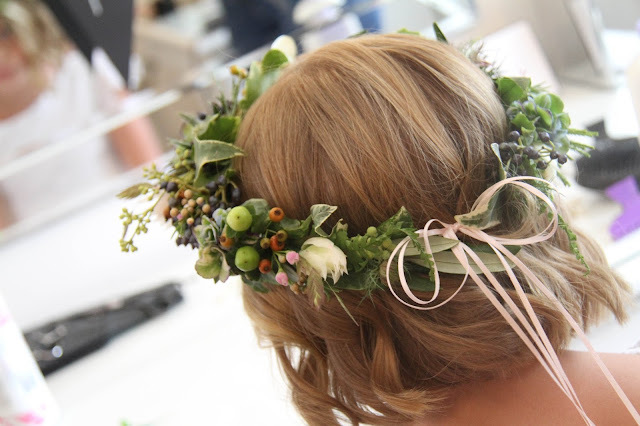 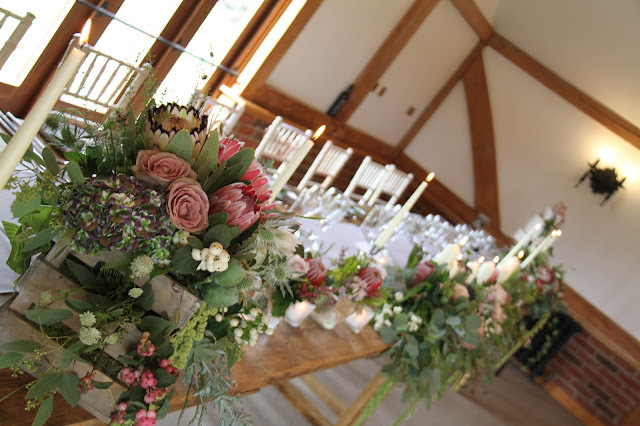 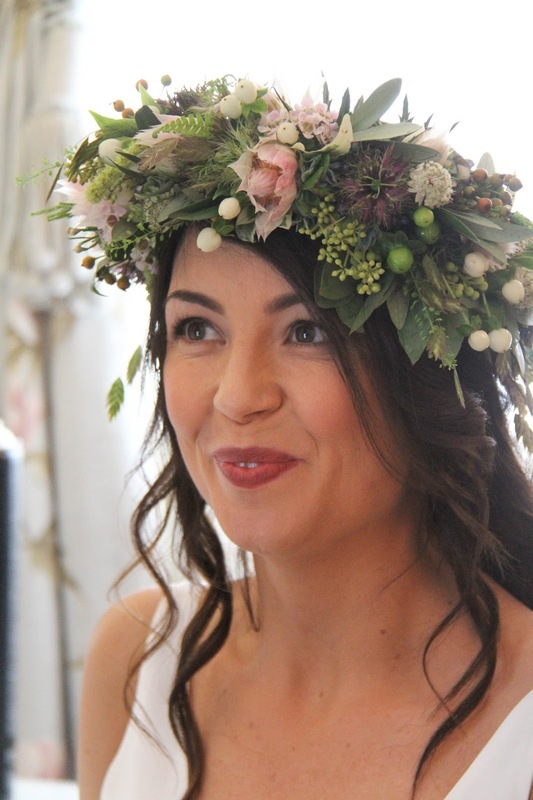 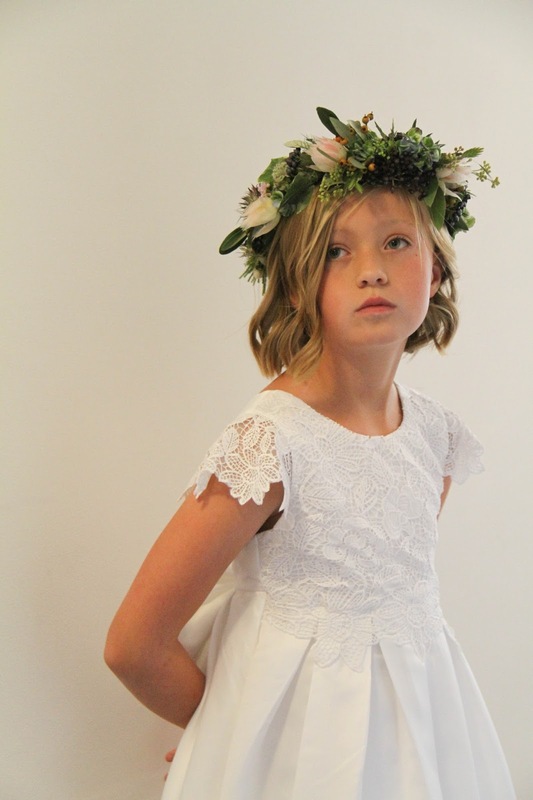 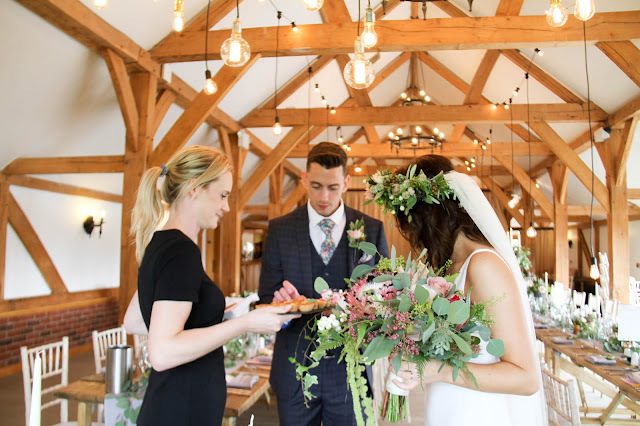 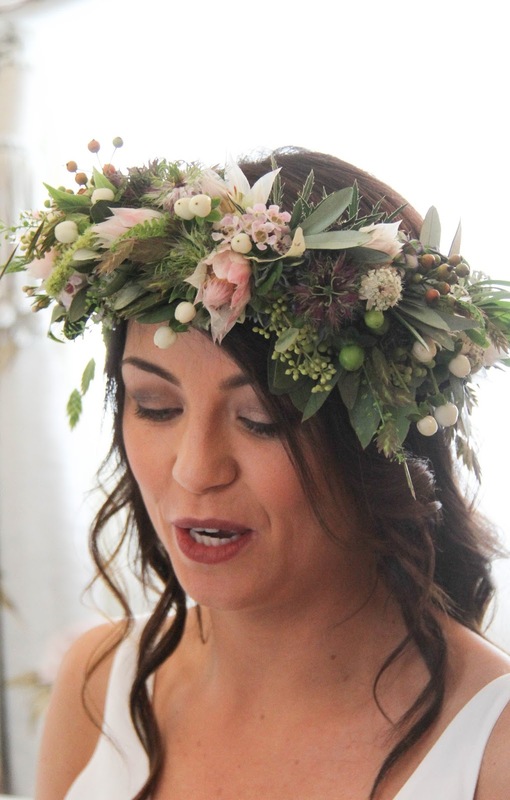 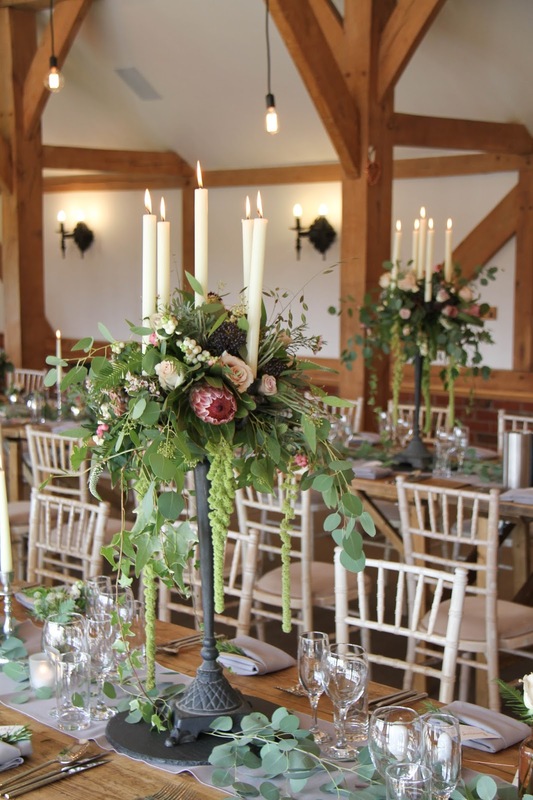 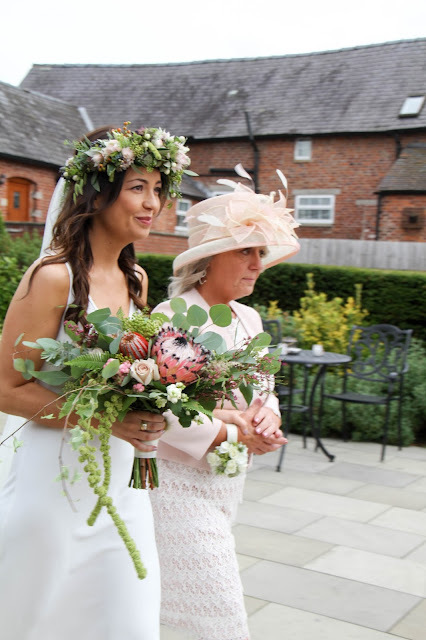 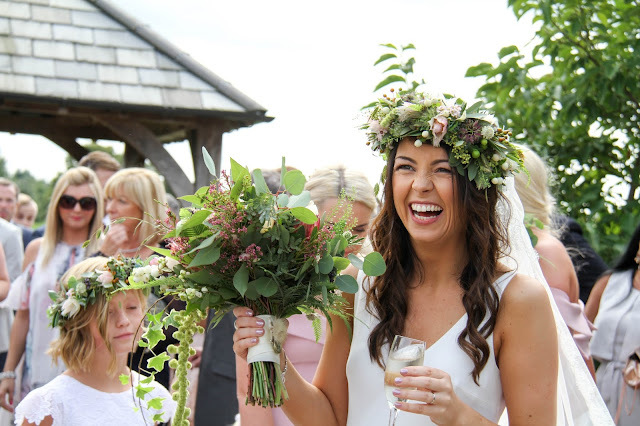 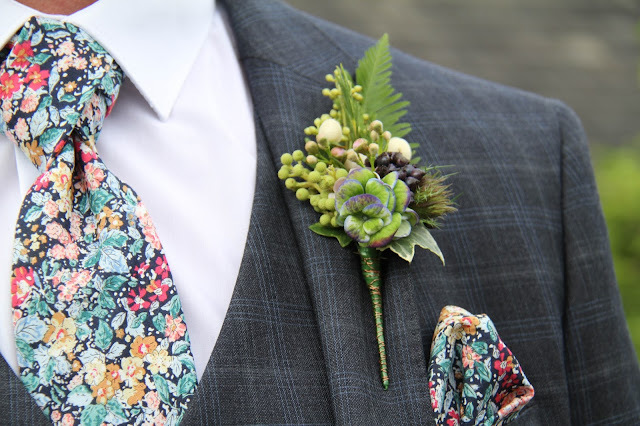 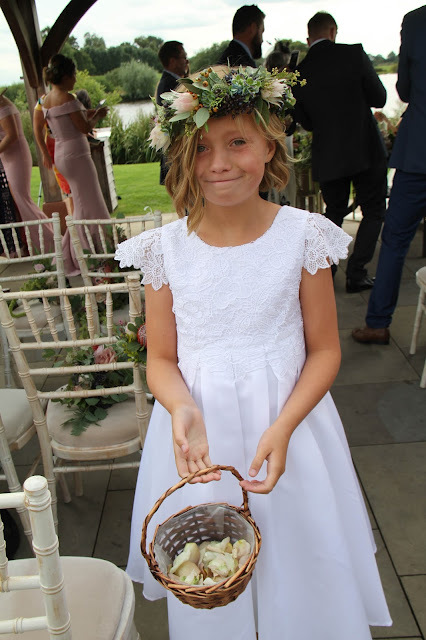 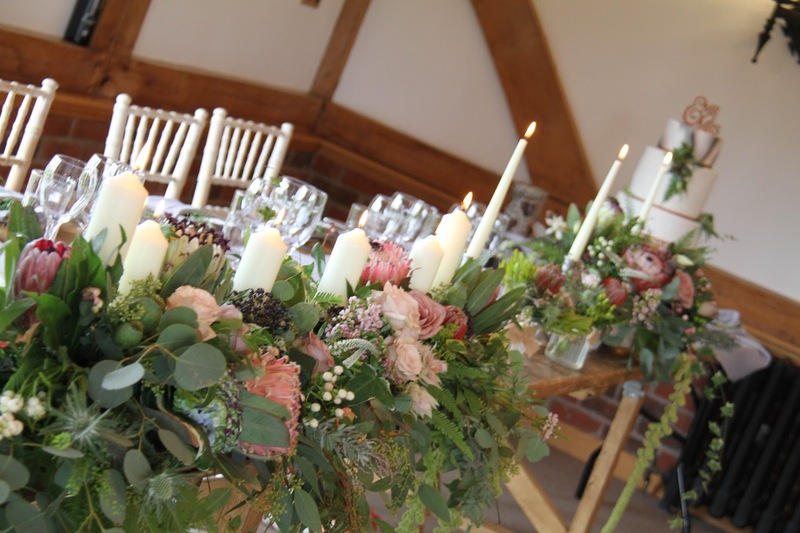 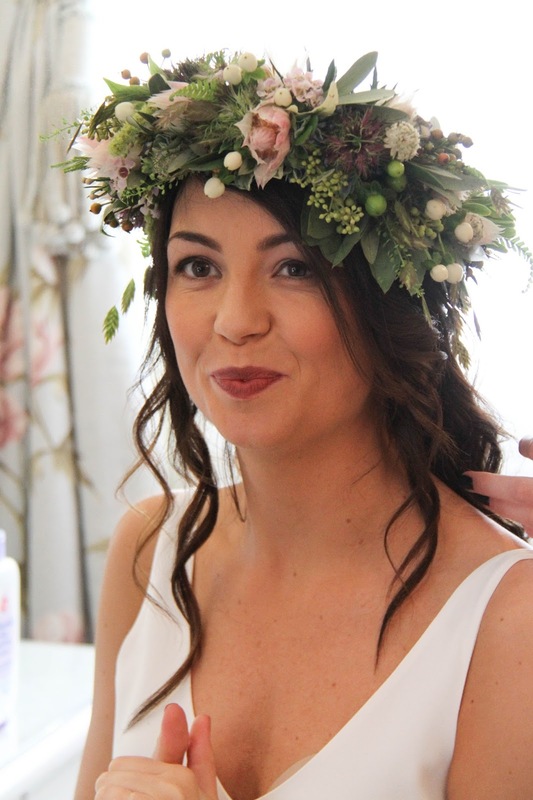 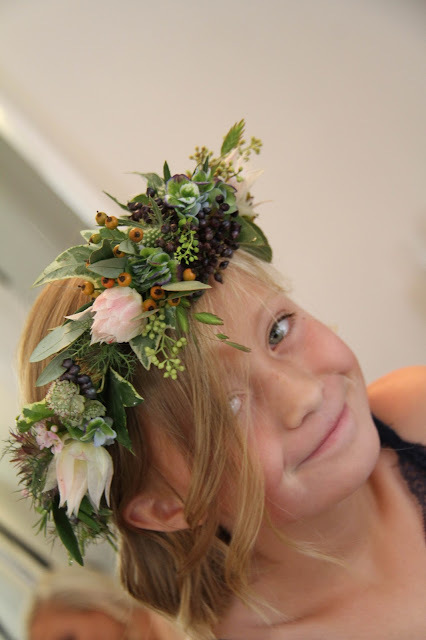 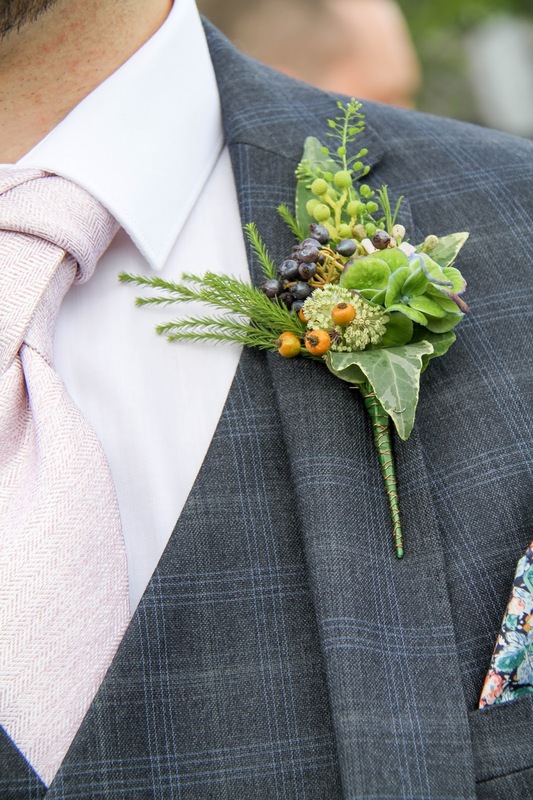 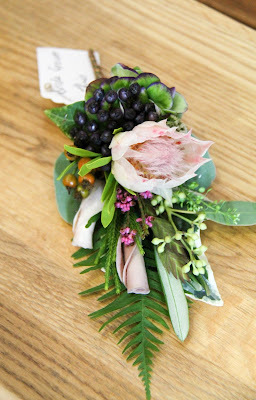 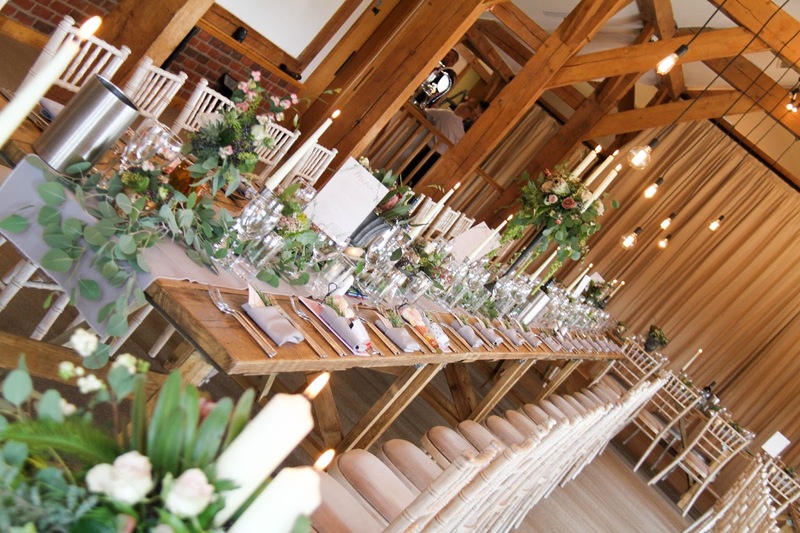 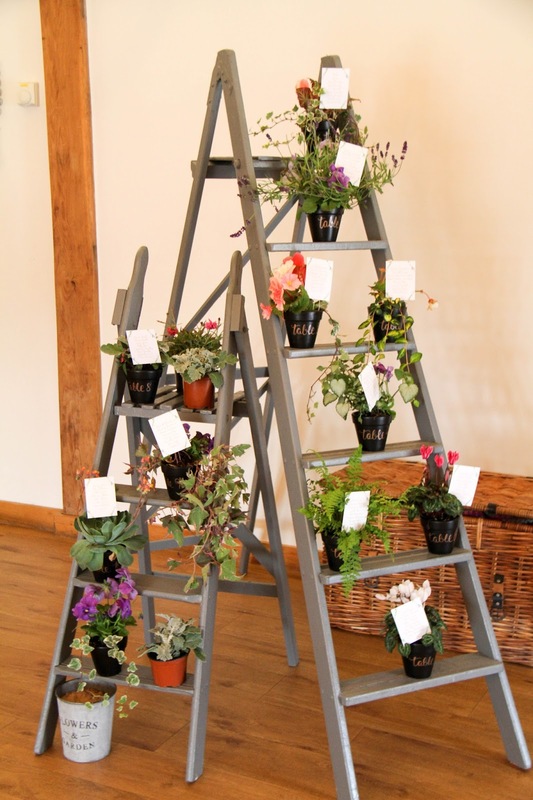 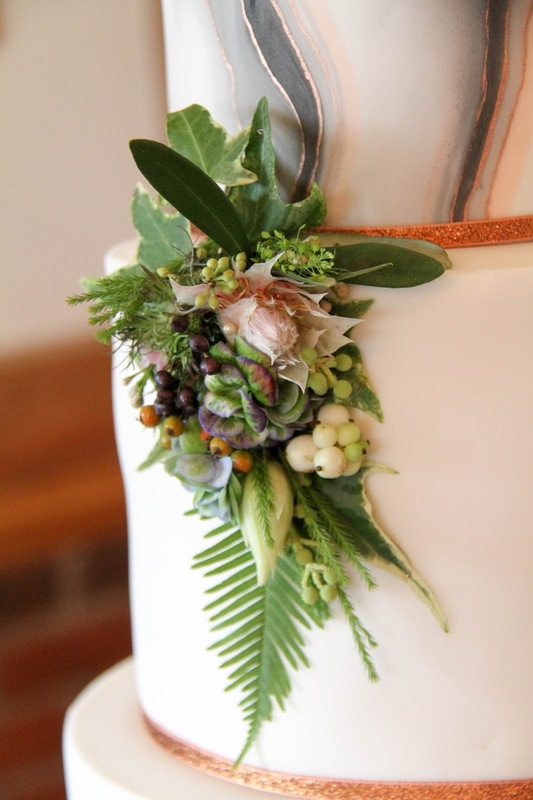 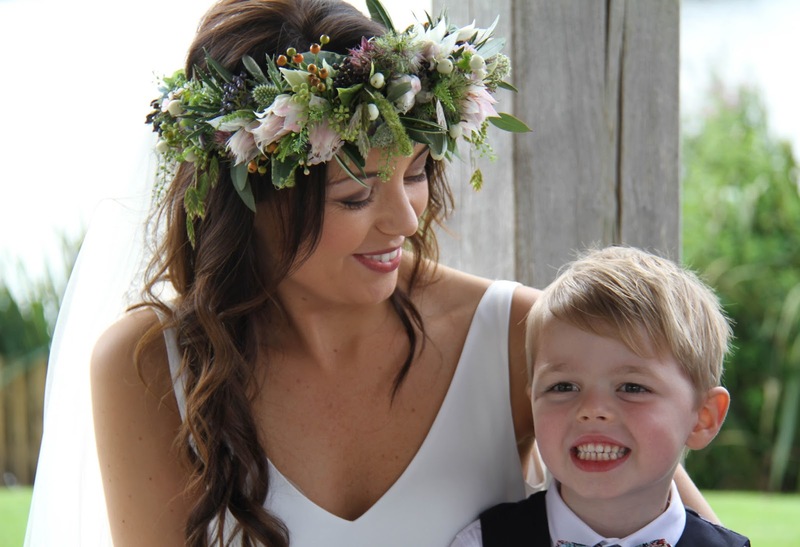 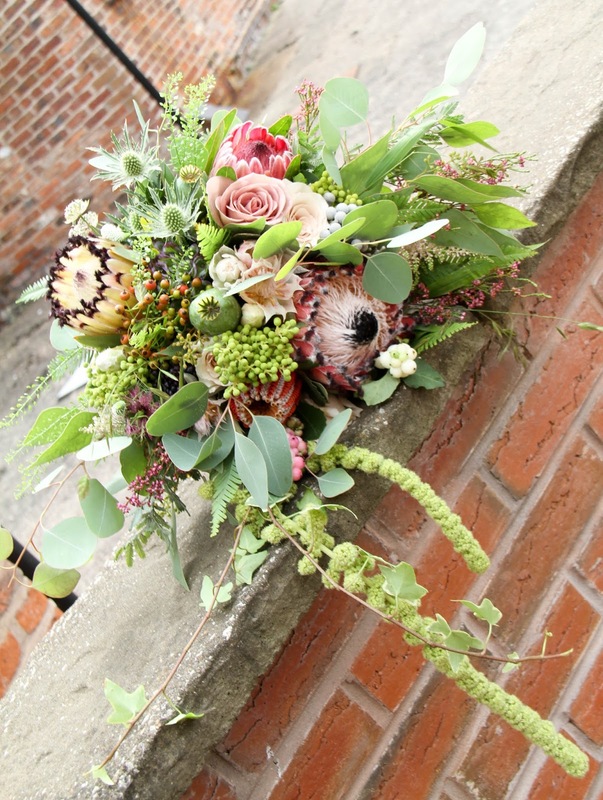 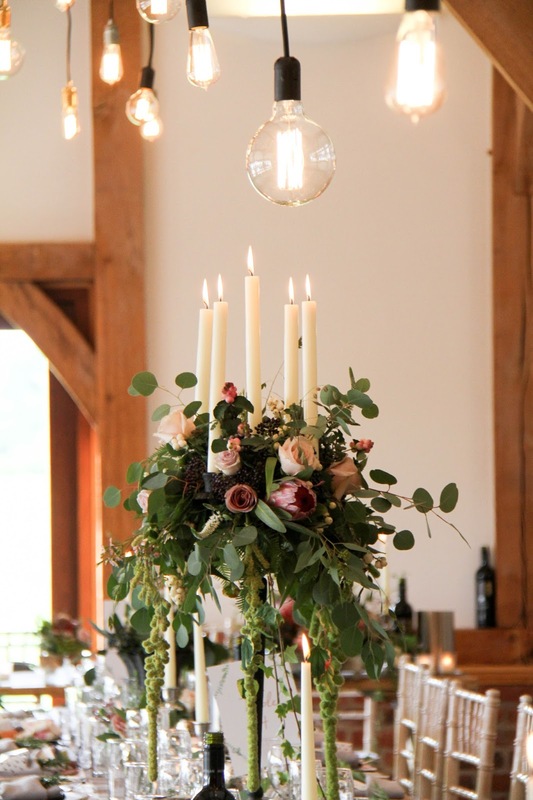 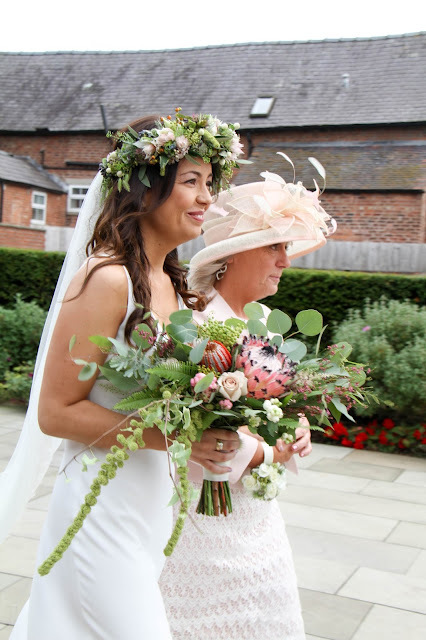 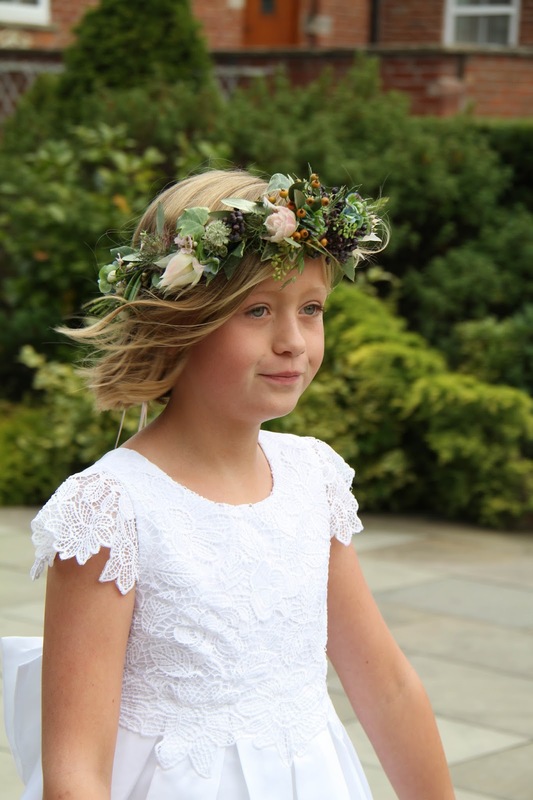 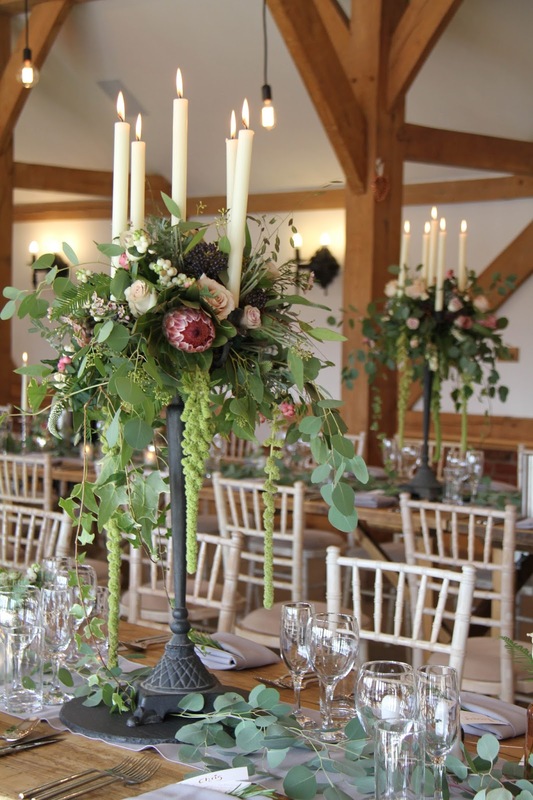 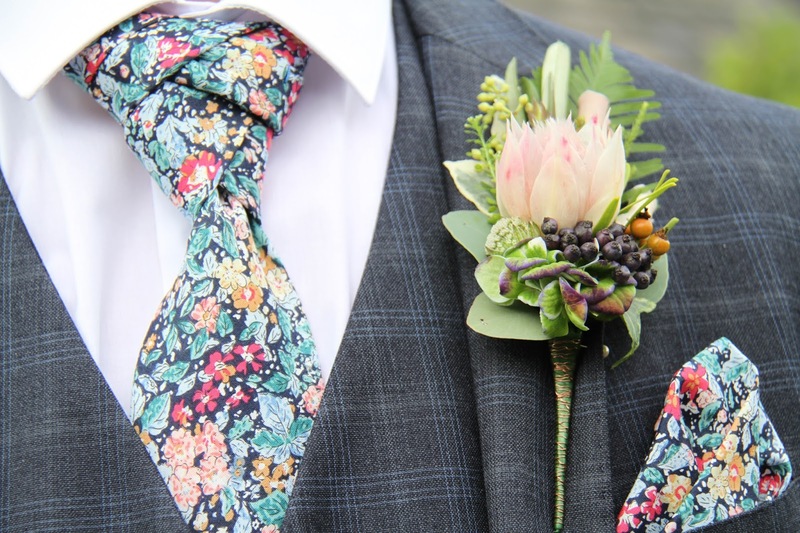 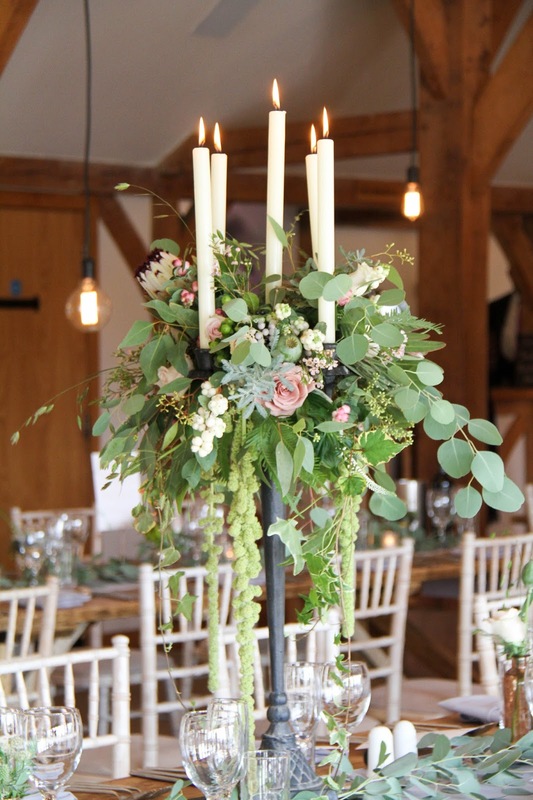 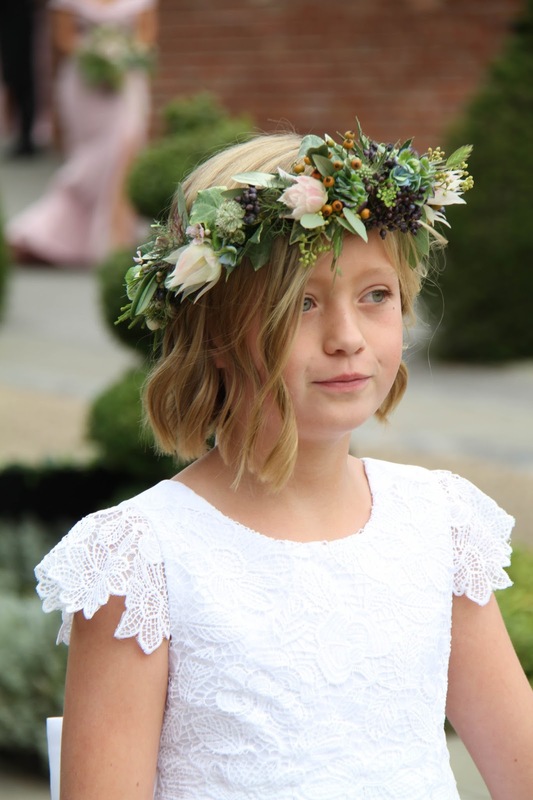 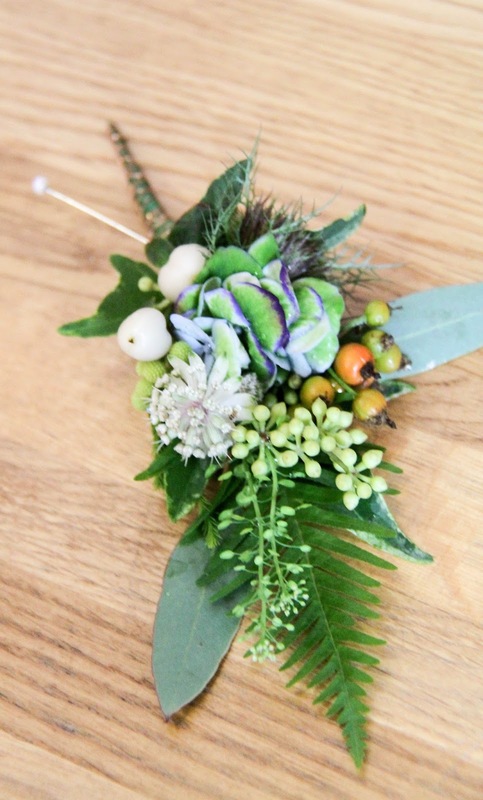 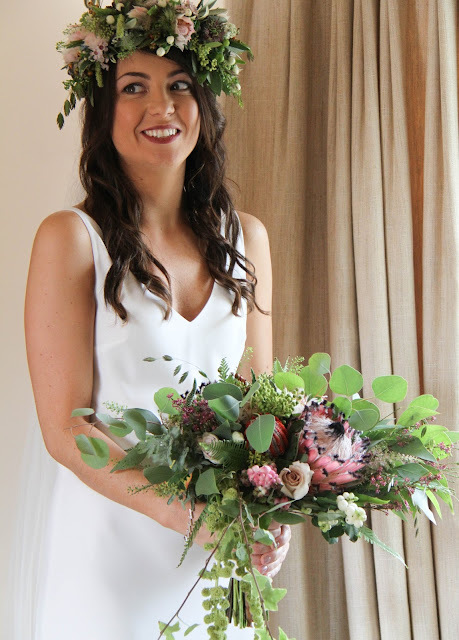 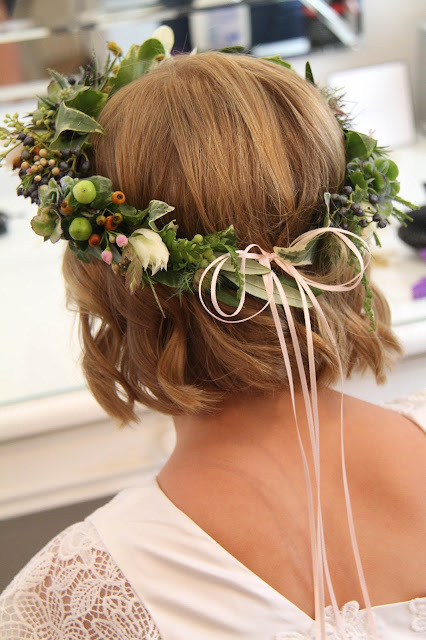 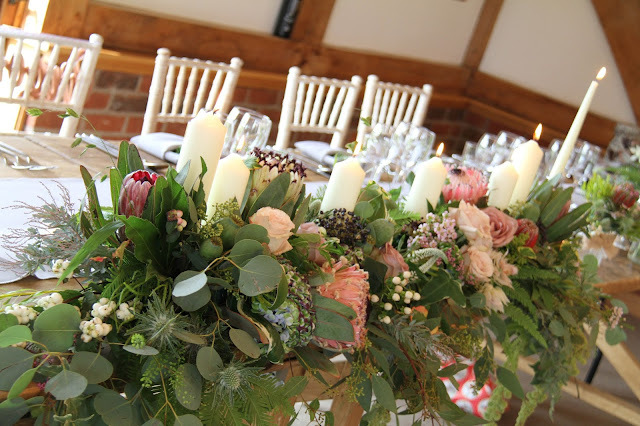 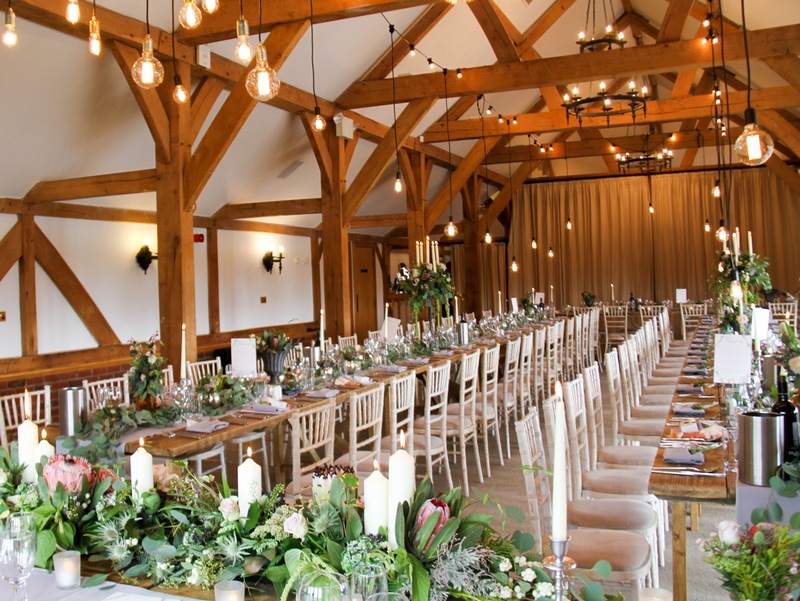 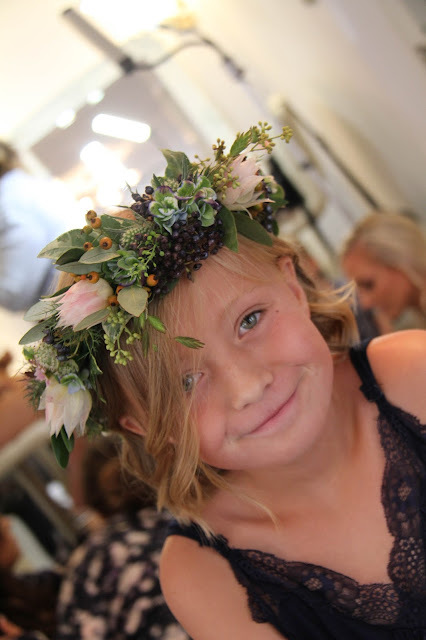 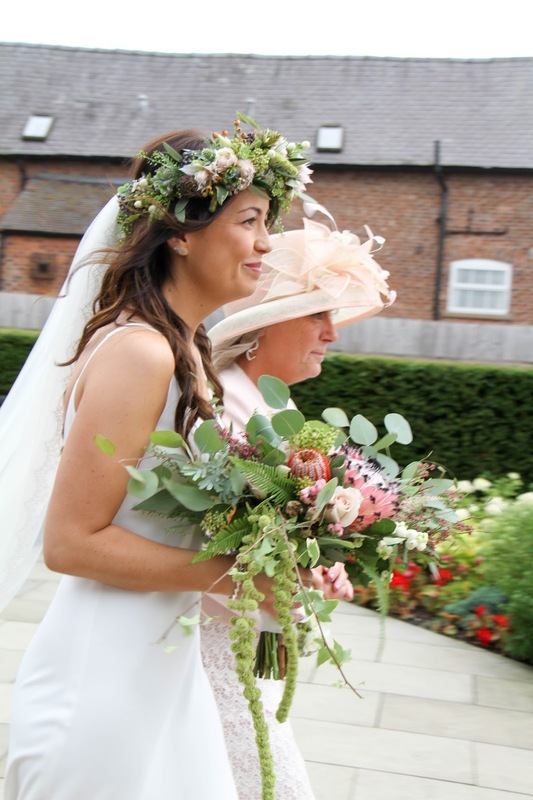 This 'Floral Crown' had a feeling of 'Titania' about it, all of the natural flowers and berries appeared as if they could have been picked from the grounds surrounding Sandhole Oak Barn, we'd tied the back simply with shoelace ribbon to add an element of naivety and innocence to the design. 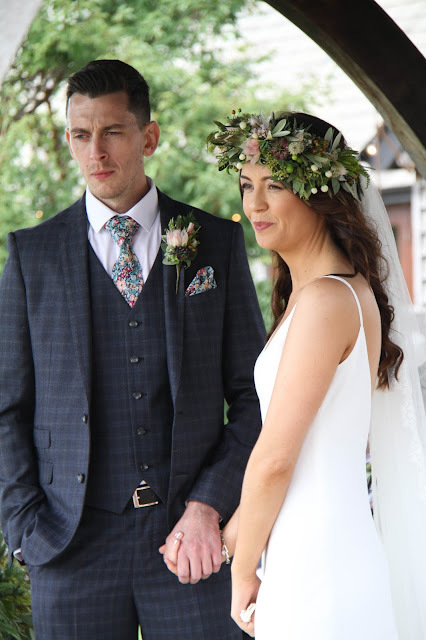 Leanne looked incredible, the Bride's Floral Crown was so much more layered, many elements were used to add facets and layers of interest, with the dancing grasses creating movement and a magical feel, I wish too that you could take in the fragrance of the headdress it really was a heavenly thing, fresh and herby, clean and cool, sweet like fresh cut grass. 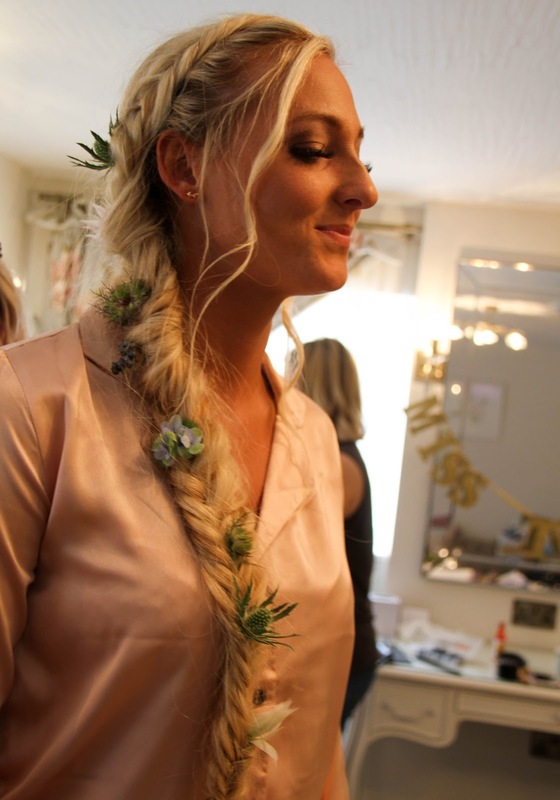 Oh me oh my, utterly breathtaking!!! 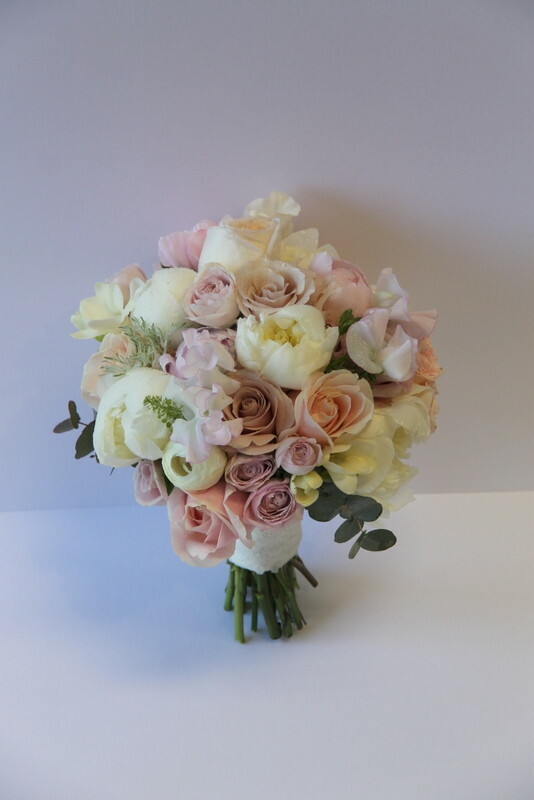 Dear Jane, Jason and your incredible Flower Design Team! 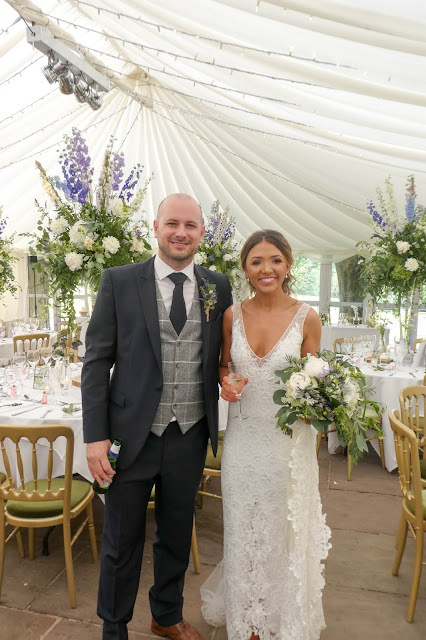 We can not thank you enough for this beautiful write up, you put so much time and effort into every wedding and you all work so hard. 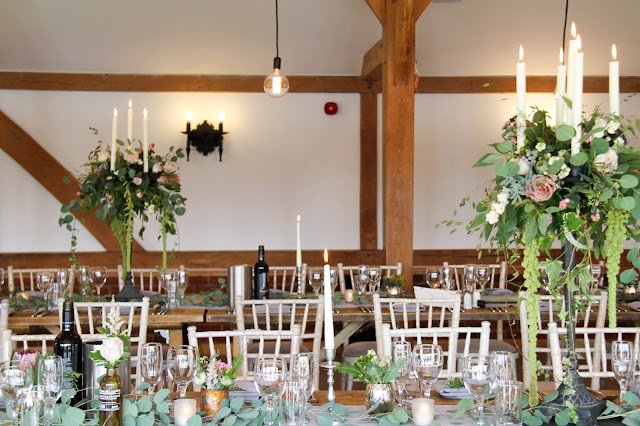 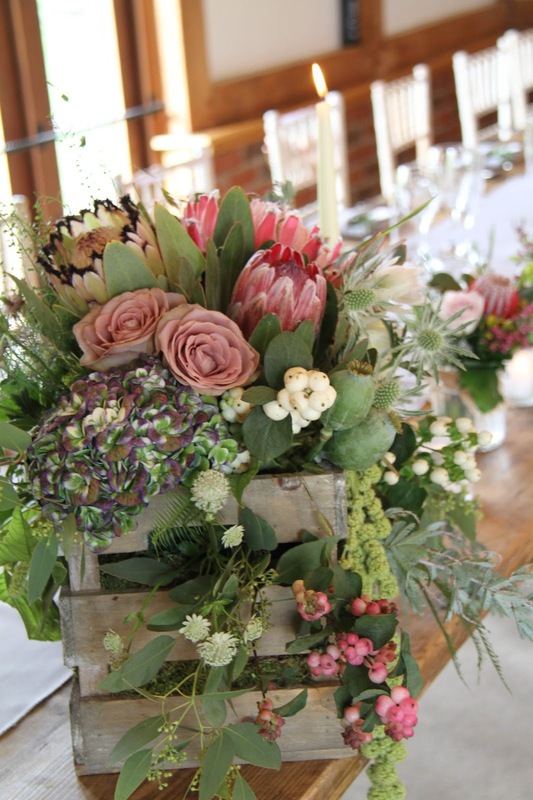 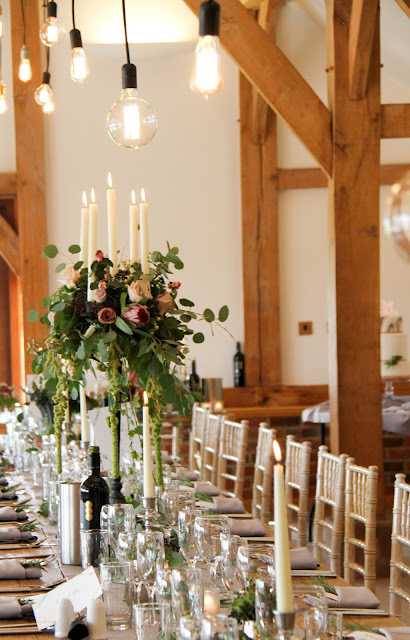 Our flowers and the decorated venue were WAY beyond our expectations. 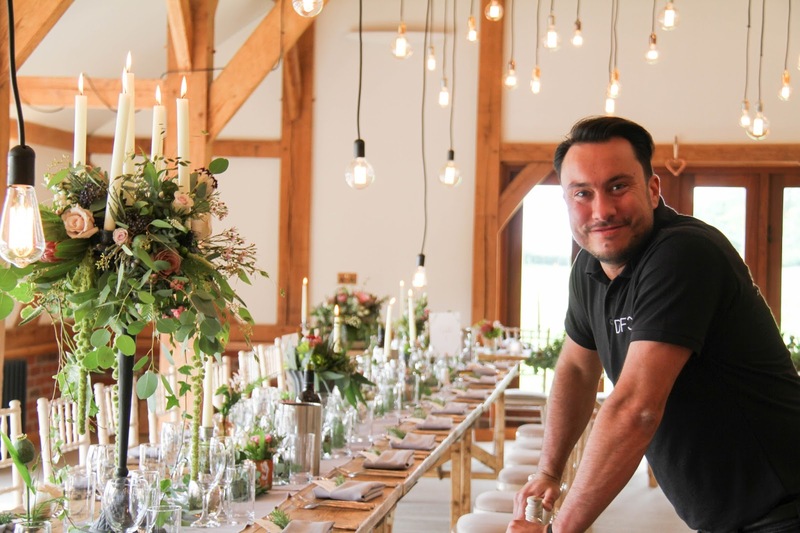 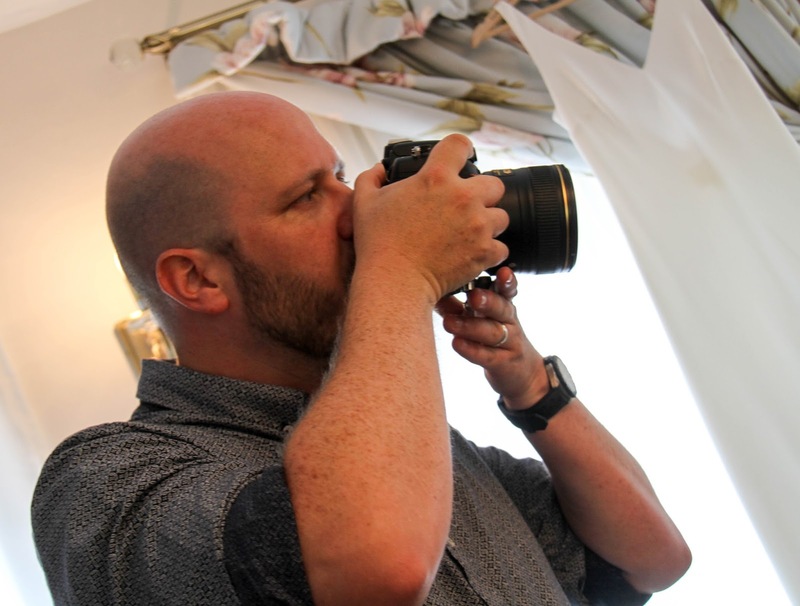 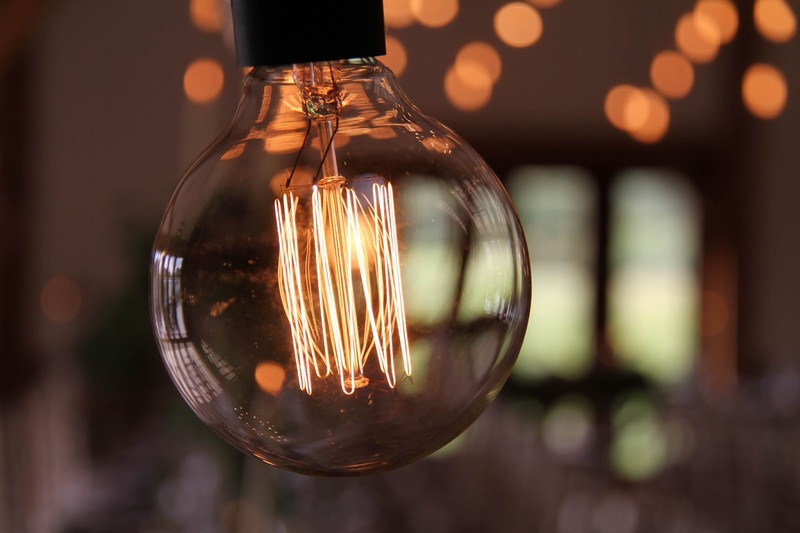 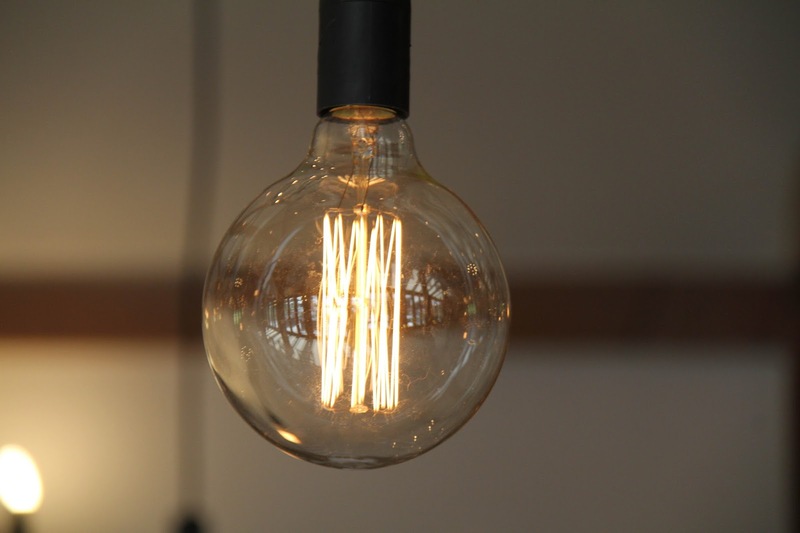 We (I 😂) knew exactly what we wanted and although it was hard at first to hand over the reigns, you and your team are the experts and you absolutely nailed every last detail. You are just the loveliest bunch and you are all worth your weight in gold. From the real rose petal confetti to swapping those chairs 👌 you make sure that everything is just perfect. 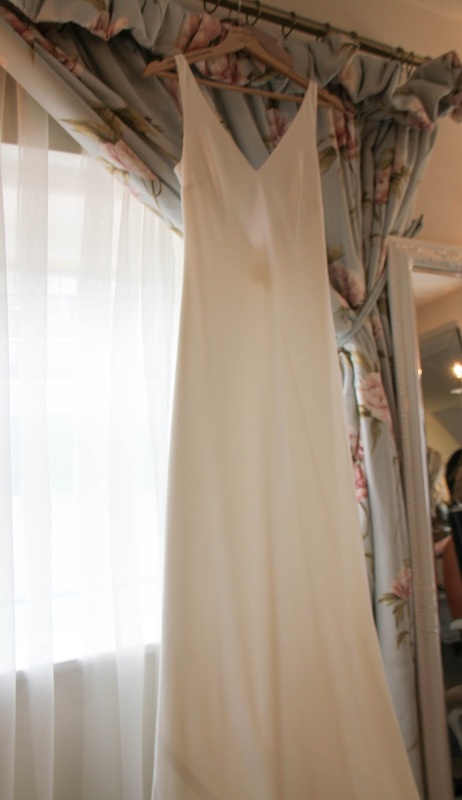 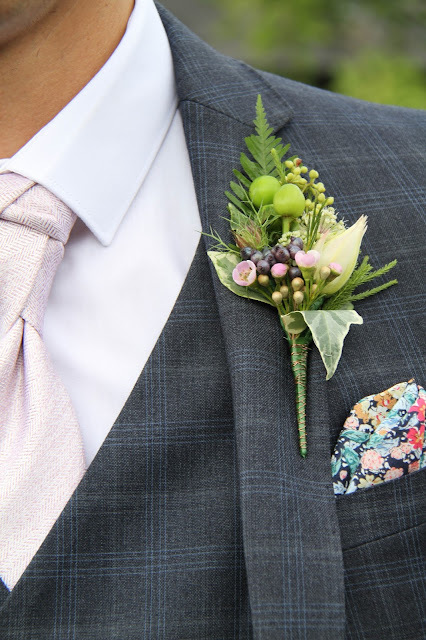 The flowers were perfectly arranged and everyone complimented them and the bouquets. 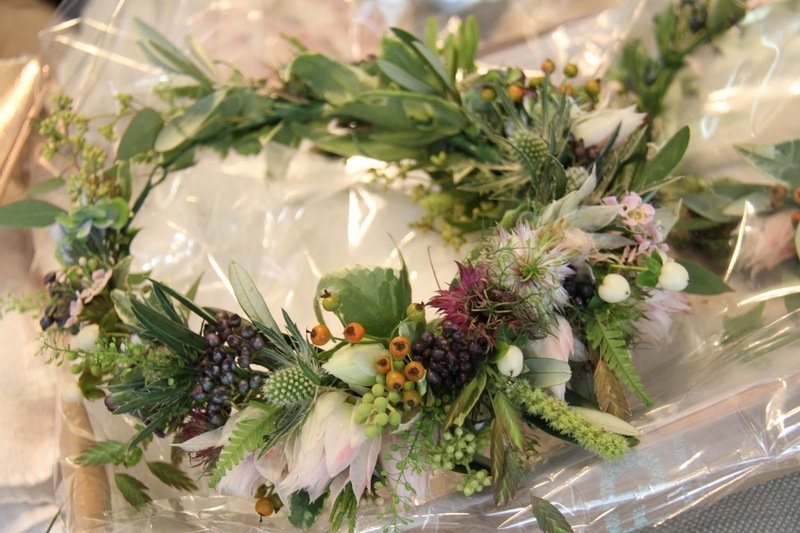 My flower crown is one of the most beautiful things I have ever worn and once it is fully dried it is going to be framed. 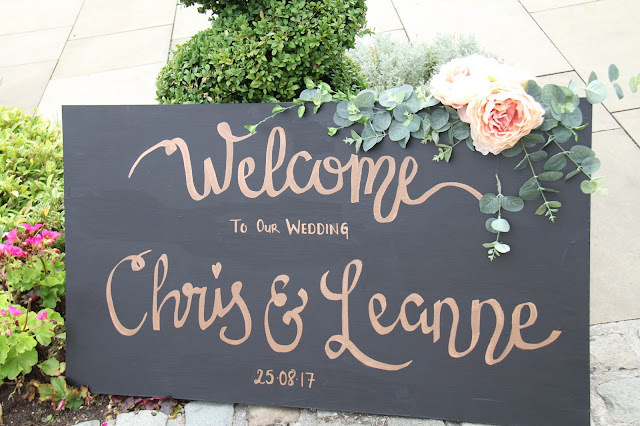 I could go on and on but in short... you are the best and we are SO glad we chose you and we would not hesitate in recommending you!